George Town was an early day for us because the ship would only be there until the early afternoon. We got up and around around 8 a.m. Alicia and I had gone to bed late, and I felt like I hadn’t really slept. My morning coffee helped a bit, but not much. Perhaps the morning sun would wake me up. The port at George Town does not have a pier for large cruise ships, so we had to take a tender to shore. 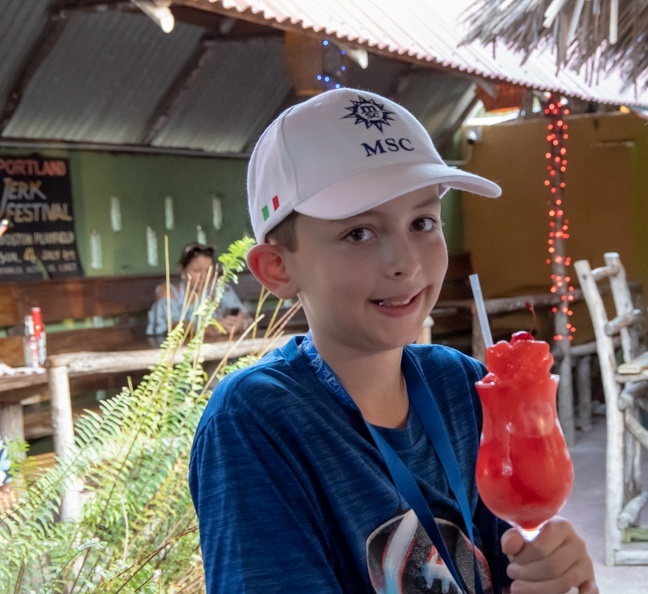 We had booked a snorkeling excursion through MSC, but they had canceled it for unknown reason. We decided we would do what we often do in ports where we had no excursion; we would hire a taxi to show us around. We met up with a taxi driver at the port and arranged for a tour of the island. 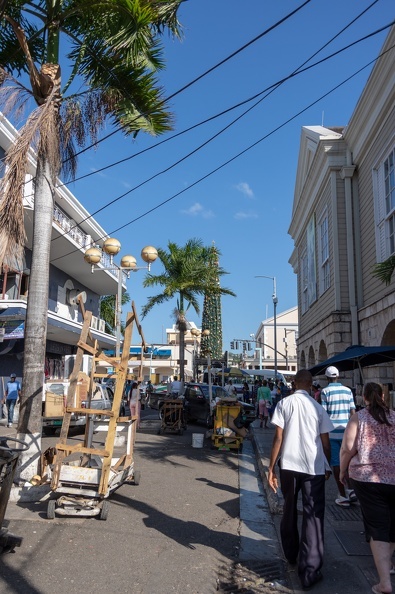 George Town is the capital city of the Cayman Islands, and is home to much of the country’s financial industry (The Cayman Islands are home to more than 600 banks). We drove north through town past numerous resorts that lined the coast. Our taxi driver was kind enough to point each one out as we passed. Our driver stopped in front of a nondescript home. In front was a sign calling it “Old Homestead.” The driver explained the home was built in 1912 and has been owned by the Bothwell family since its construction. It is claimed the Old Homestead is the oldest house on the island. 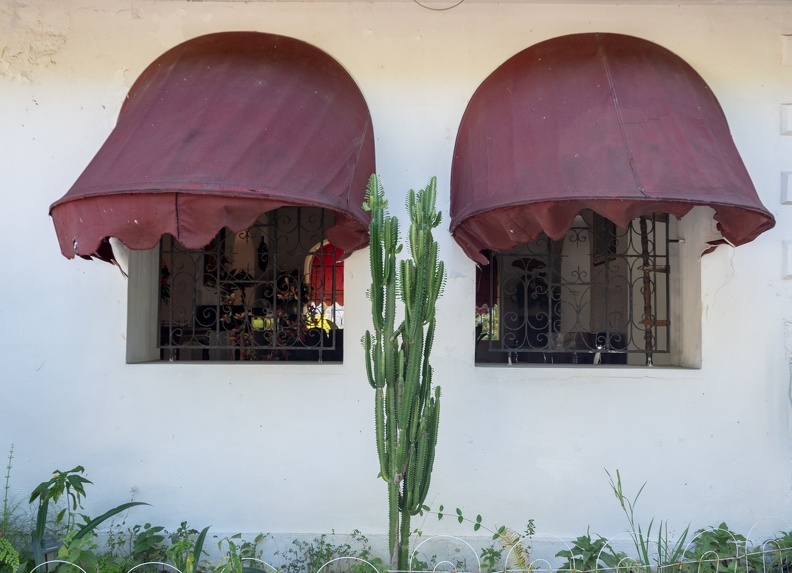 Pink and white, with a sandy yard and a corrugated metal roof, you would not think this house was anything special. The house’s frame is built from ironwood. 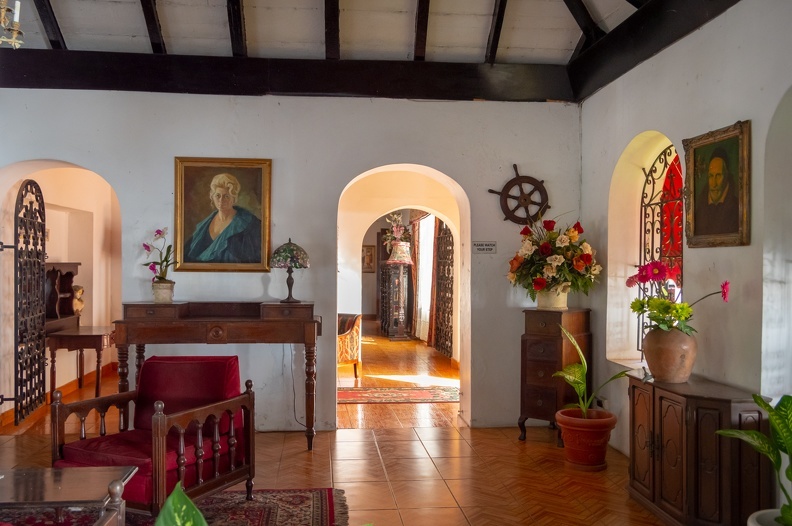 The home has withstood countless tropical storms and hurricanes over the years. Driver man said the home’s resistance to the elements is because of its ironwood construction. Ironwood is very dense and resistance to water rot and insects. 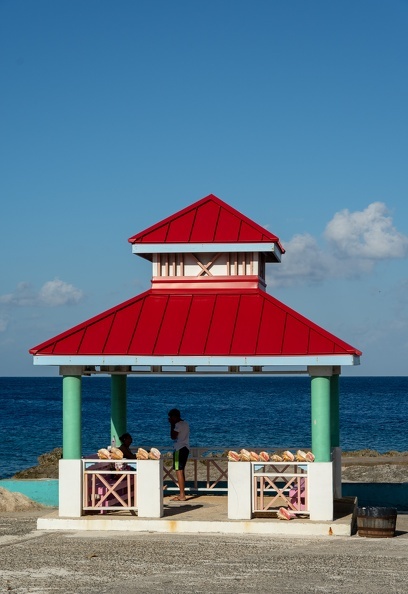 Our next stop was the area of Grand Cayman Island known as Hell. 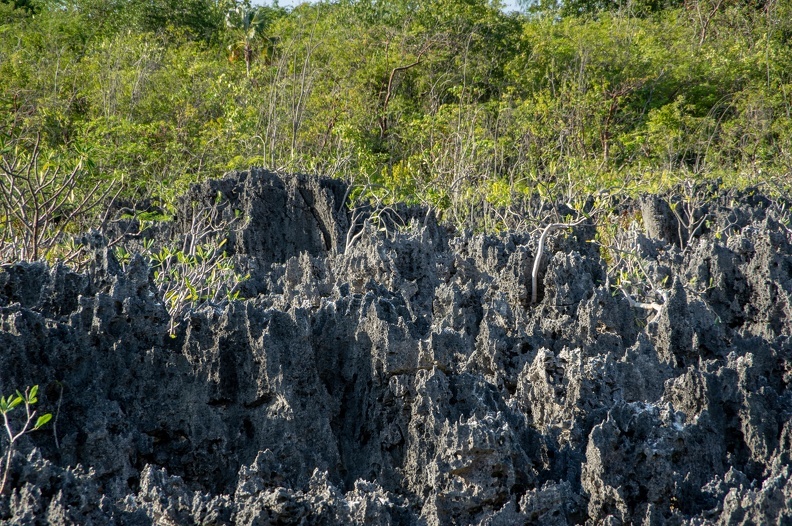 Hell is home to an outcropping of black limestone formations roughly the size of a football field. There are various stories about how Hell got its name. Settlers reportedly, upon first seeing the limestone outcrop, said, “This is what Hell must look like.” Other stories say that if one was to throw a rock into the outcrop, the rock makes a sound that echoes through the formation and sounds like the rock is falling “all the way to Hell.” The outcropping looked like a hellish moonscape, and the limestone formations looked razor-sharp. Certainly one would have a hell of a time if they tried to hike through. 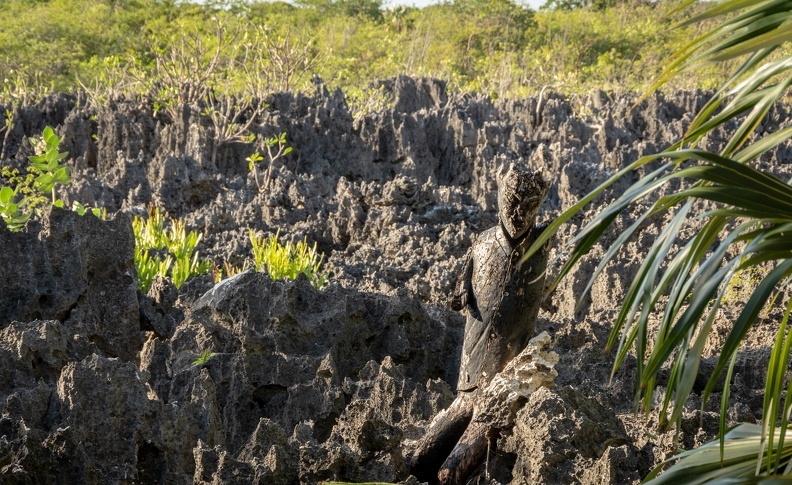 The outcropping was guarded by a small wooden statue of a devil. 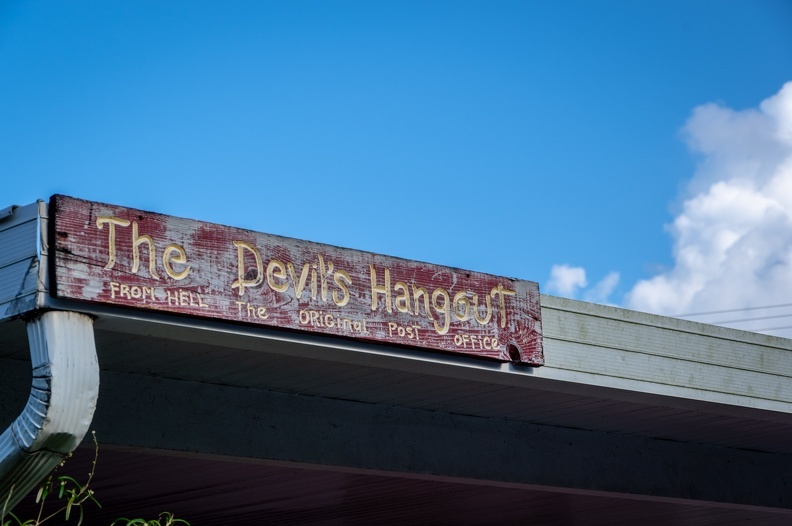 Hell is home to a post office where you can send your friends a postcard from Hell, and a kitschy little gift shop called The Devil’s Hangout. 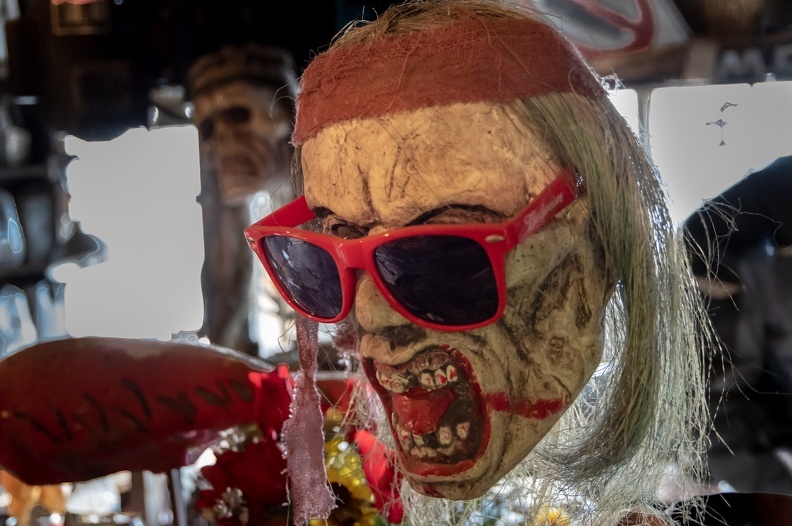 We walked in and the shop’s owner, Ivan, greeted us with a hearty, “How the Hell are you?” You could buy any number of Hell-themed items in the shop from t-shirts, to shot glasses, to postcards from hell. I learned from Ivan’s daughter, who was working the counter with him, that Ivan had been a merchant mariner and was very supportive of veterans and law enforcement. 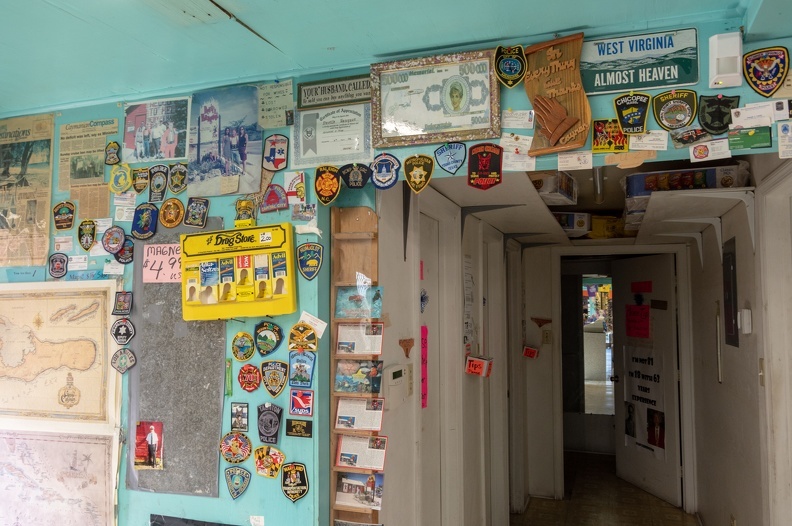 The back wall of the shop was filled with patches from various law enforcement agencies that had been left behind by officers on vacation. 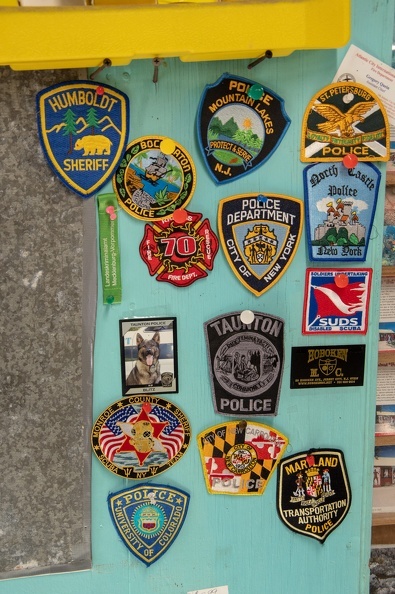 Since I always carry patches with me when I travel, I pinned one of my own Humboldt Sheriff patches to the wall. I tried to get the driver to stop at the Hell post office, but my request fell on deaf ears. 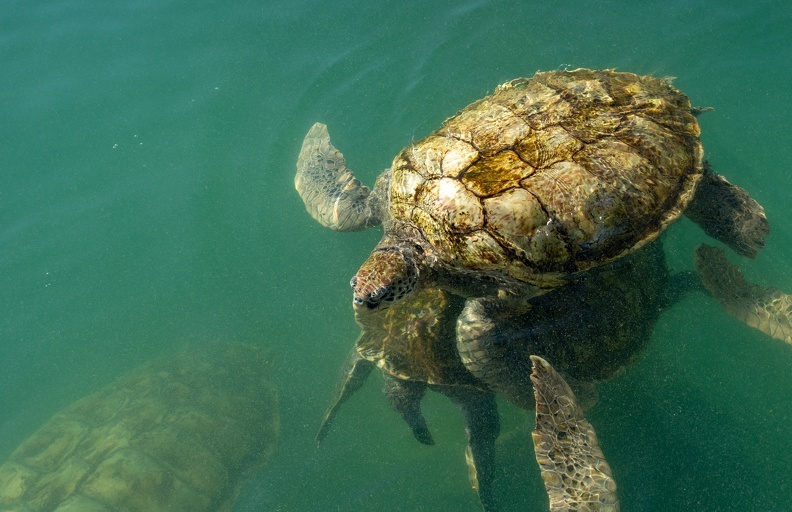 The driver was in a bit of a hurry to get us to the Tortuga rum shop, as if he was on a schedule. I was starting to get the feeling that he was not much interested in driving us around. We stopped at the rum shop, which was right on the beach. 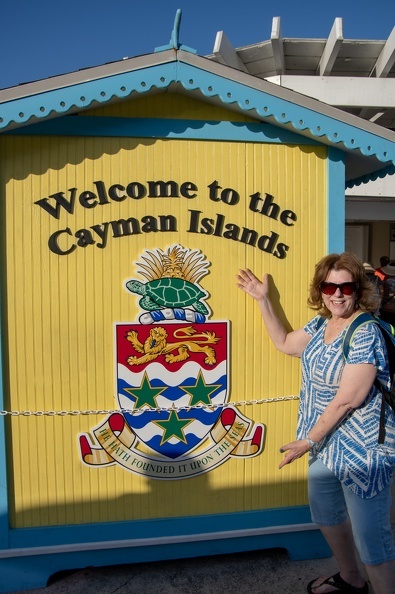 There was not much to it other than shelves with bottles of rum, and more Cayman Islands souvenirs. Outside was a woman weaving straw baskets. We must have picked a bad time to stop because they did not have any rum or rum cake samples for us to try. I grabbed a “meat patty” from the snack counter. Meat patties are fairly popular in the Caribbean. Think of a patty as a beef-filled hot pocket. The beef had a nice kick to it, and the crust had a hint of butter flavor. I thought it was quite good. 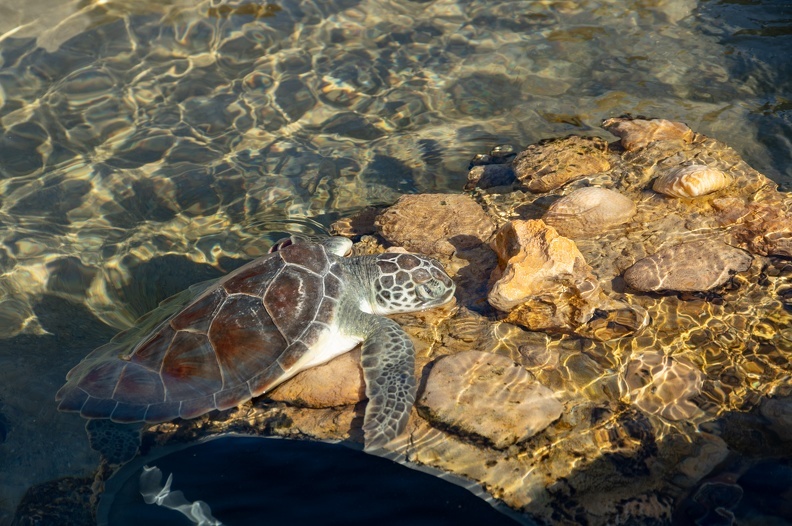 We went to the turtle center and got to see their adult turtle swimming about in a man-made lagoon. 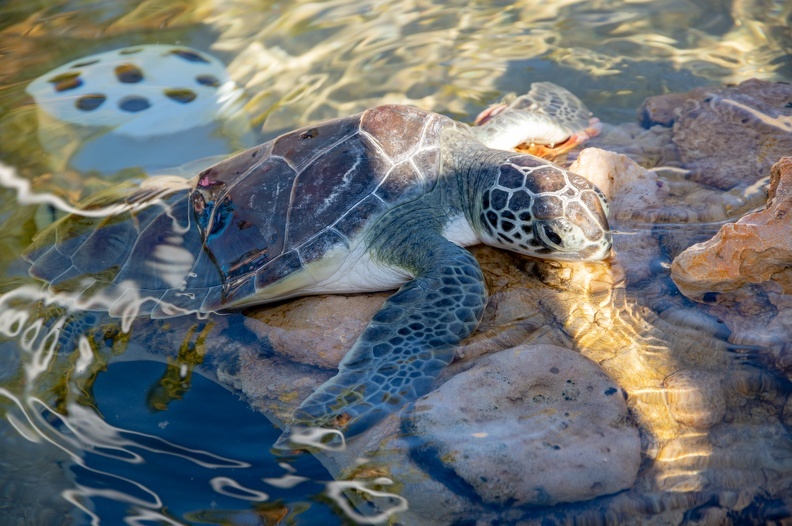 The center had recently had a group of baby turtles hatch, so they weren’t quite ready for display. 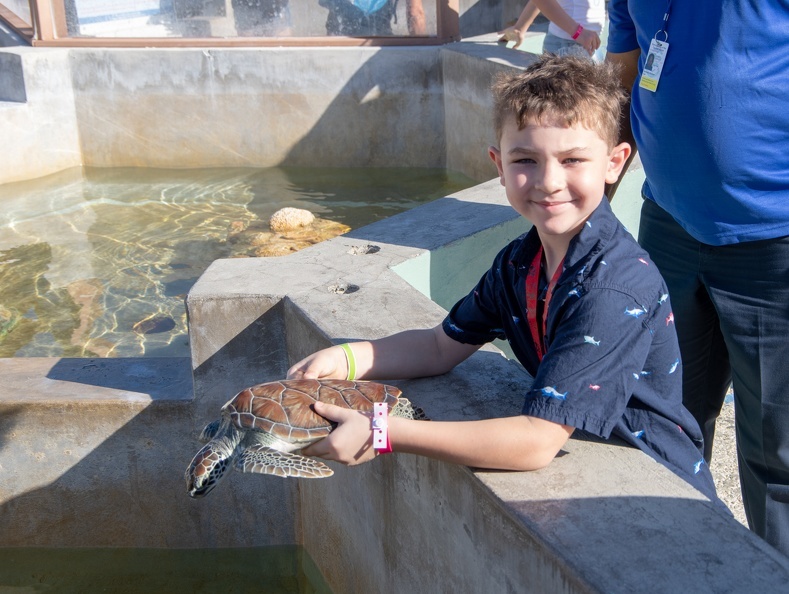 We walked around checking out the turtle exhibits and even got to hold some of their beautiful juvenile turtles. 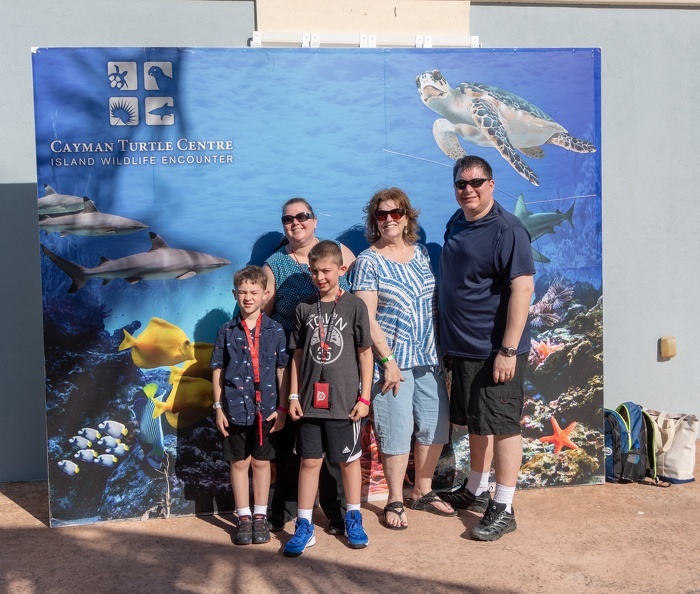 After our time at the turtle center the driver insisted we visit the Dolphin Discovery Center across the street. He seemed very insistent we at least walk in the door of the place. We walked in, saw the pools, but barely saw any dolphins, then left. The driver’s insistence on a visit to the dolphin center was very suspect. Perhaps he, like other tour guides at other stops, was receiving kickbacks from the places we visited. We headed back into town and the driver pointed out several other obvious points of interest along the way: a golf course, a bank, a resort. I’m not quite sure why he felt he needed to point out the obvious. 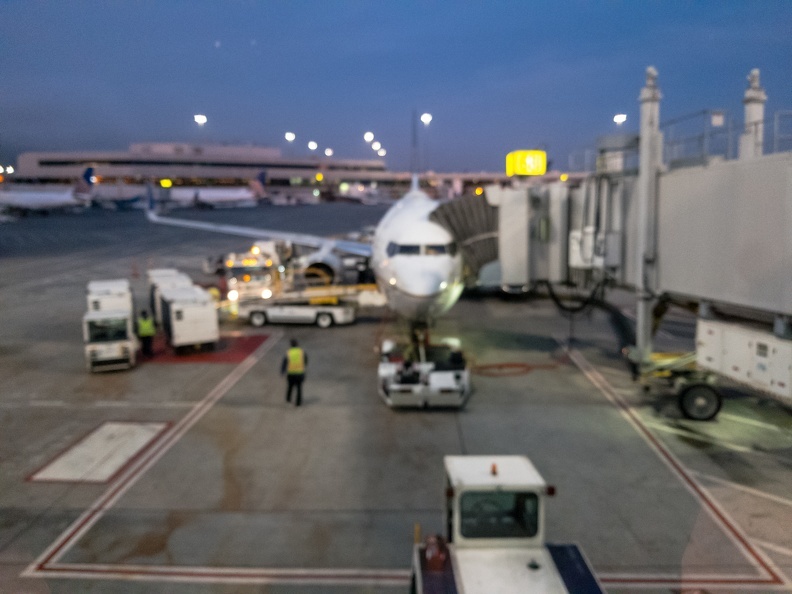 Then he let it slip … The driver had a pre-scheduled pickup at the airport in less than an hour. I had thought the tour felt a little rushed. We made a quick lap through the central part of the city where we saw the parliament building, main courthouse, government administration building, and police headquarters. Though the tour was good overall, I think the driver should have kept his mind on his current customers instead of the future ones. We killed a bit of time checking out some of the souvenir shops on the waterfront. 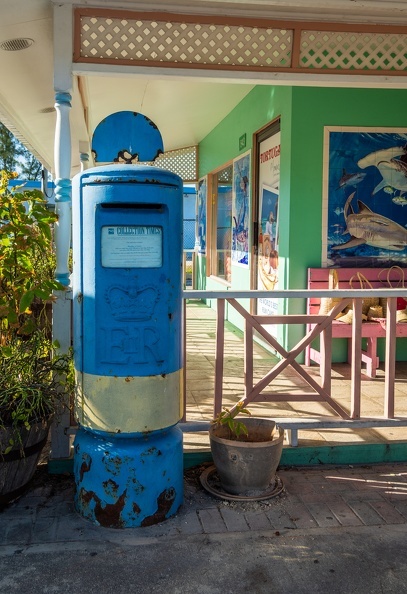 Some of the shops were built over old buildings from the early colonial period on the island. One shop even had a plexiglass floor where you could see the old limestone steps leading down to a basement well. We headed back to the ship for lunch and a nap. While I rested, Alicia and the boys hit the pool to cool off. Later on, Ryan learned a valuable lesson about the ship’s arcade. We had let him go back to his cabin on his own so he could read instead of going to the kid’s club. I went to the cabin to get him for dinner and discovered he was not there. I had not gotten any messages from him about leaving the room. I went to the arcade and found Ryan there playing the skill crane game. Ryan happily showed me the stuffed Snoopy he had won. 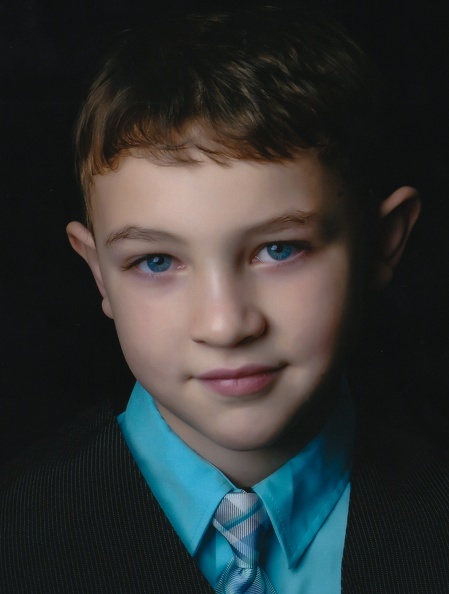 All I could ask was, “What did you do?” I didn’t know how many times he had played the game, and neither did he. It turns out Snoopy was a very expensive toy. Ryan had spent nearly $200 playing the claw machine, not knowing that each time he swiped his room key it billed our account. Ryan was devastated because he knew he had made a big mistake. We complained to guest services about them allowing children to charge expenses on their cards, despite telling them we did not want to allow it. In the end, they didn’t refund everything, but did refund part of Ryan’s charges (and turned off his ability to charge in the future). We shared the port today with Carnival Vista. As such, we had to get a shuttle from the dock to the main part of the cruise terminal where we’d catch our tour. Alicia had arranged a tour of the city with a local tour company prior to our trip. We met up with Howard, our tour guide, outside the terminal. 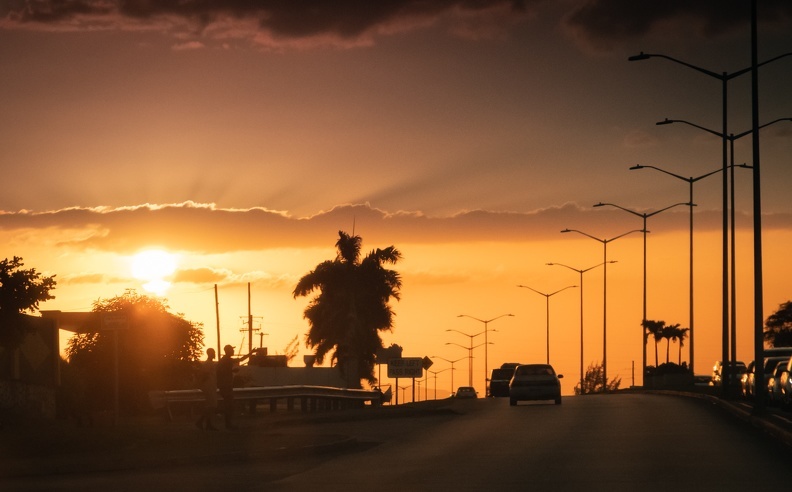 It was hot in Montego Bay, often called “MoBay,” about 90 degrees. It felt odd to be so warm in the middle of winter. In addition to the heat, it was also pretty humid. Fortunately for us, Howard’s van had air conditioning. We loaded up and headed into town. 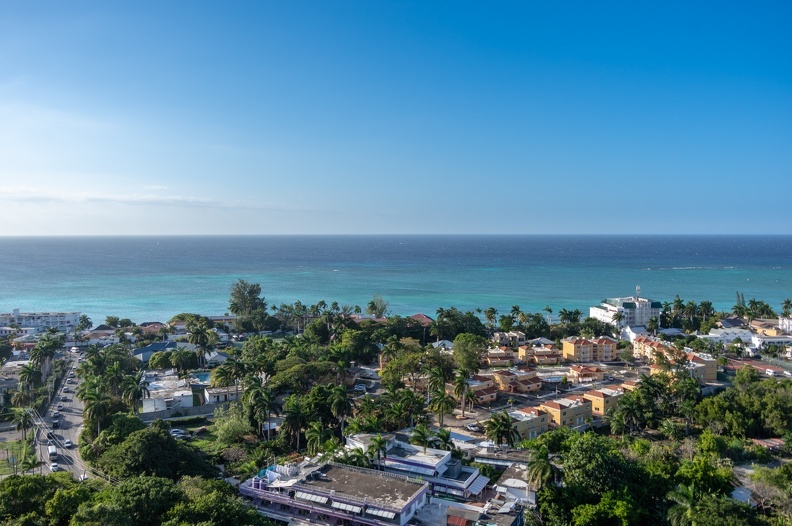 Montego Bay is one of only two incorporated cities in Jamaica, the other being Kingston. 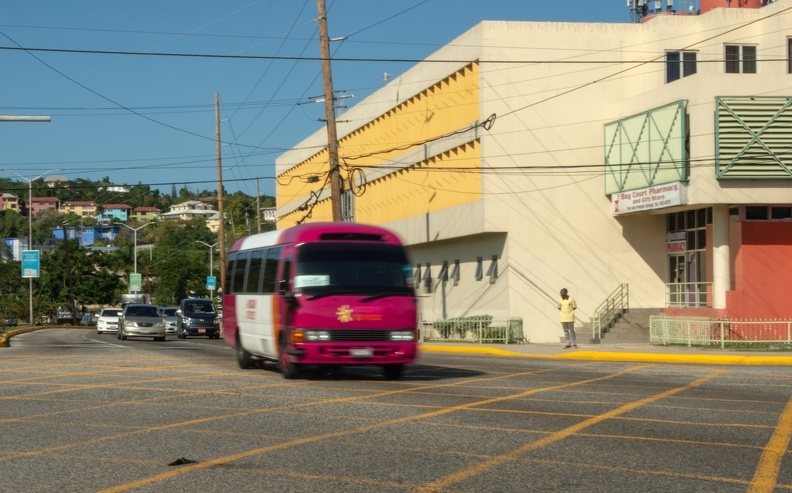 MoBay is home to more than 110,000 people and is the main point of entry for tourists to the island. 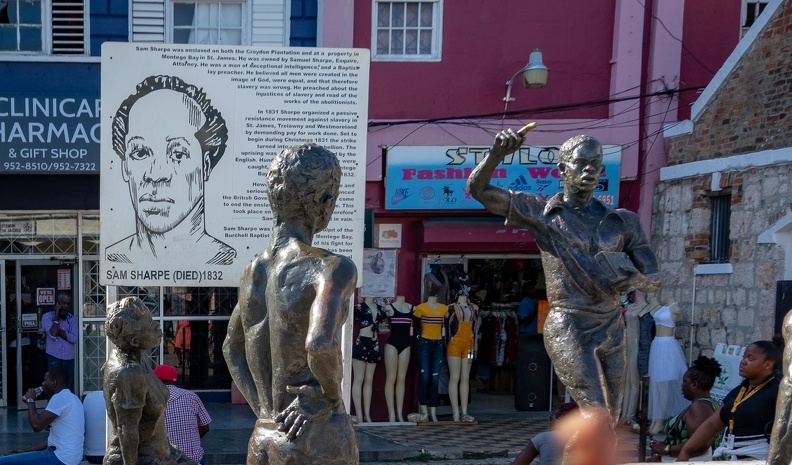 MoBay is also the setting for many of the scenes in the 1973 James Bond film Live and Let Die. As is common in many of the ports I’ve visited, there was a lot of traffic and the rules of the road were not even so much as a guideline. Howard told us people pretty much do what they want when driving. Little did I know we’d see it firsthand later. Our first stop was Sam Sharpe Square. The square is the center of the city, and is home of the city’s first courthouse and jail. 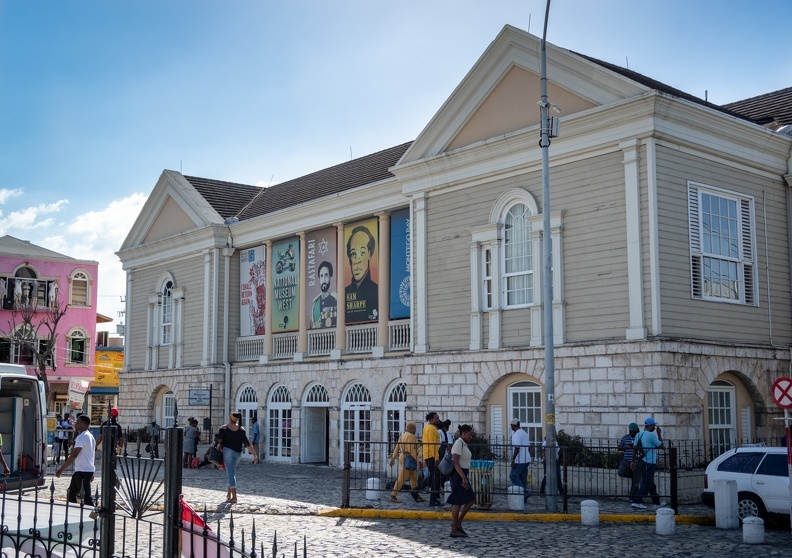 It’s named for Samuel Sharpe, Jamaica’s national hero. Sharpe was a slave who led the Baptist Rebellion in 1832, which ultimately led to the abolition of slavery in Jamaica in 1832. 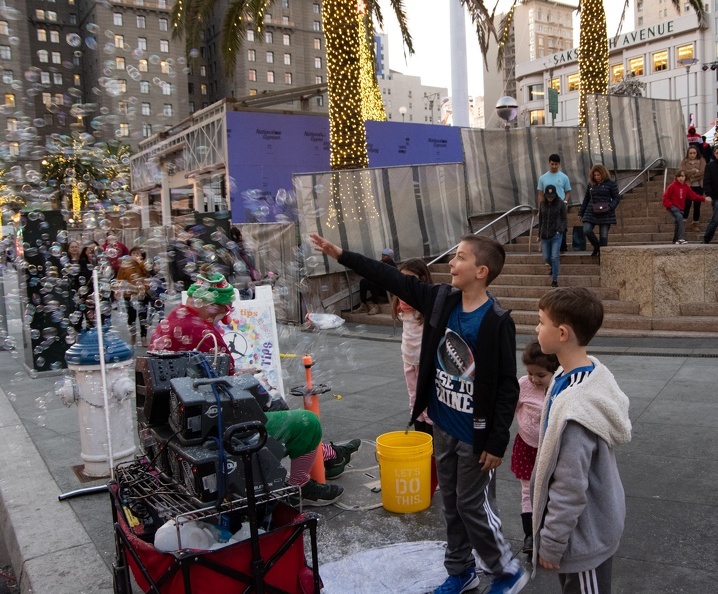 In the center of the square was a 50-foot-tall Christmas tree. Around the periphery, vendors sell items ranging from fruits and vegetables, to jewelry, to clothing. The smell of freshly cooked sausages filled the air from one vendor near where Howard parked our van. Howard introduced us to a friend, who told us the history of the square. He told us the story of Sharpe’s rebellion from in front of the Sam Sharpe memorial. The memorial depicts Sharpe, holding a Bible, preaching to slaves. 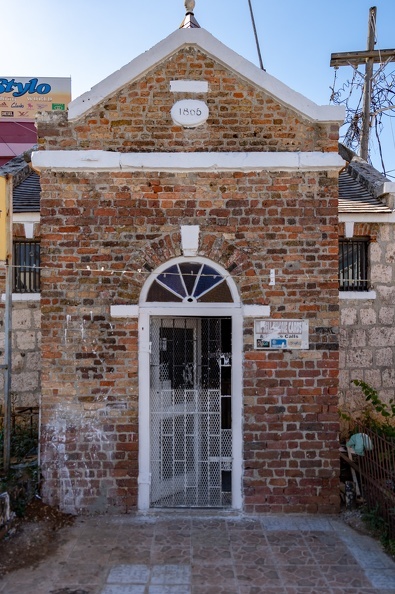 The memorial sits in front of MoBay’s first jail, known as “The Cage.” The cage was the place where captured slaves were brought to return them to their owners, or where they were held prior to execution during the rebellion. The cage also was where vagrants, drunks, and runaways were held. Today the cage is a souvenir shop. 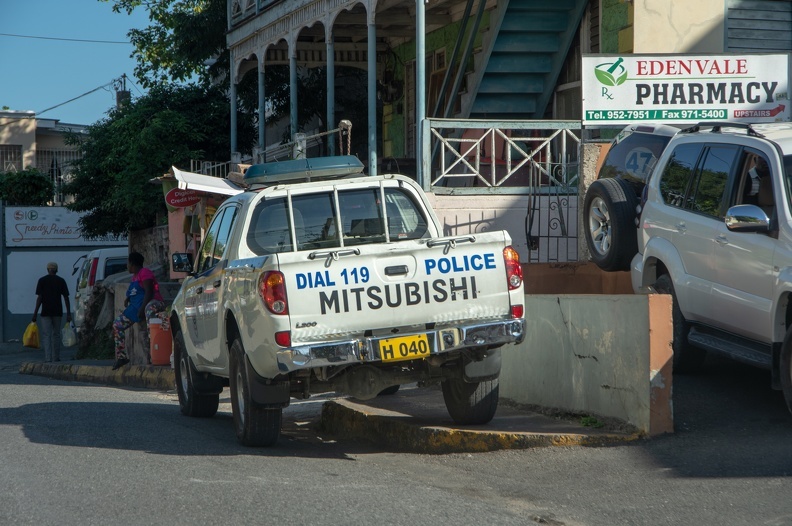 We thanked Howard’s friend and tipped him and headed back into the narrow streets of MoBay. Our next destination was Richmond Hill Estate. 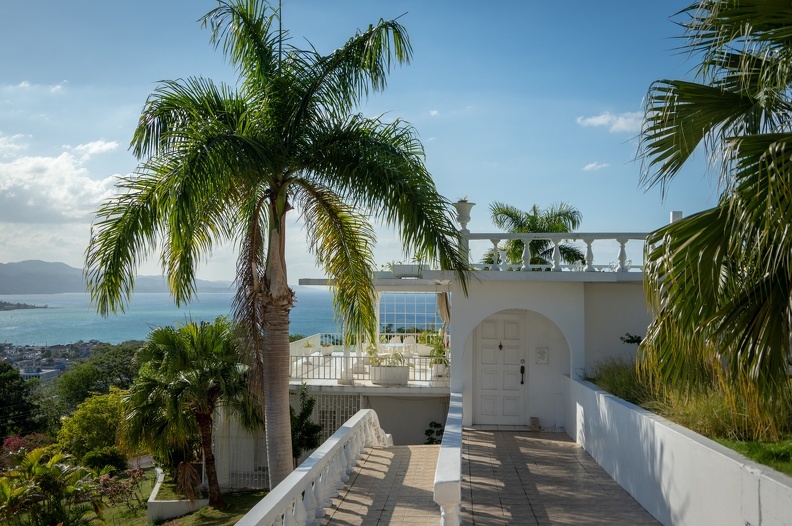 The estate sits on a hill overlooking Montego Bay. Dating back to the 1700s, the property was once owned by Dewars, the family known for its Scottish whisky. Now it’s a hotel and wedding venue. 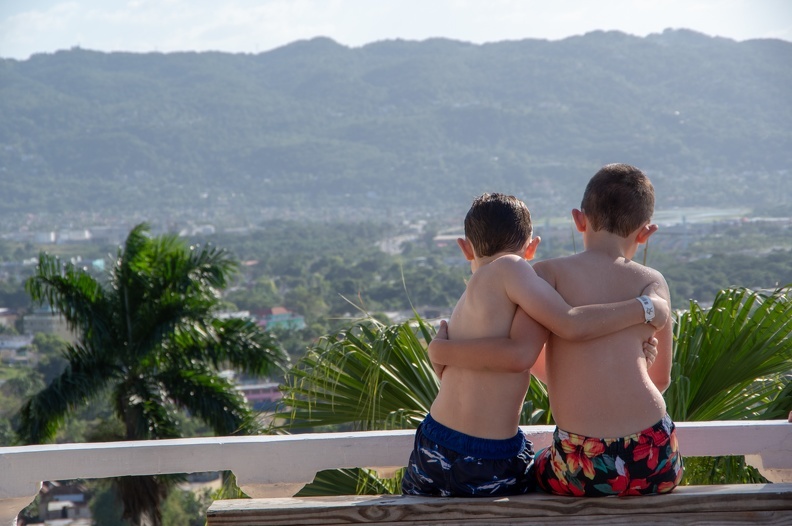 The boys and Alicia took the opportunity to cool off in the hotel’s pool with a panoramic view of Montego Bay. 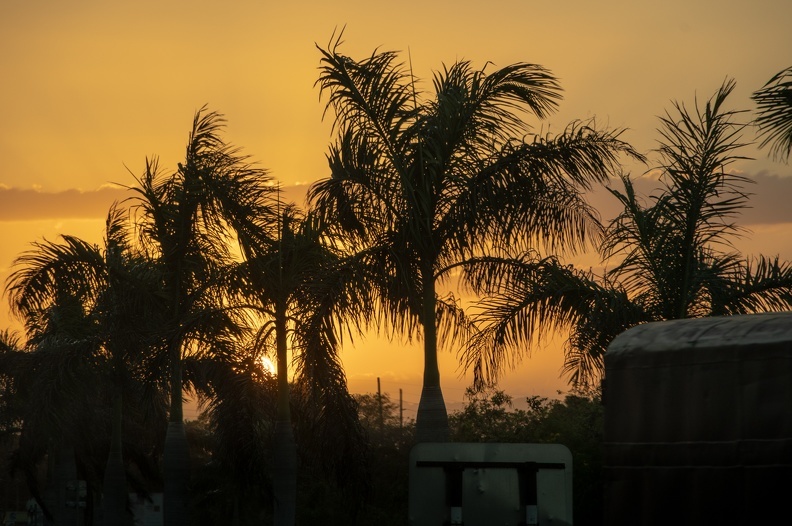 I relaxed and enjoyed a Red Stripe – Jamaica’s national beer. When in Rome, they say. I also got myself a bottle of Ting, a grapefruit-flavored soda that is popular in the Caribbean. 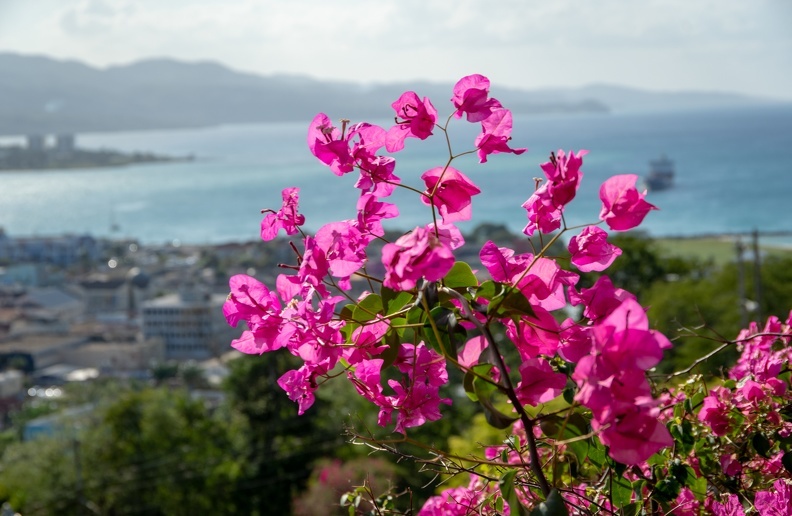 I discovered it when I was in St. Kitt’s on a previous cruise. I liked it so much that Alicia once ordered me a case of it over the Internet. Alicia and the boys dried off and we loaded back up for our next stop. 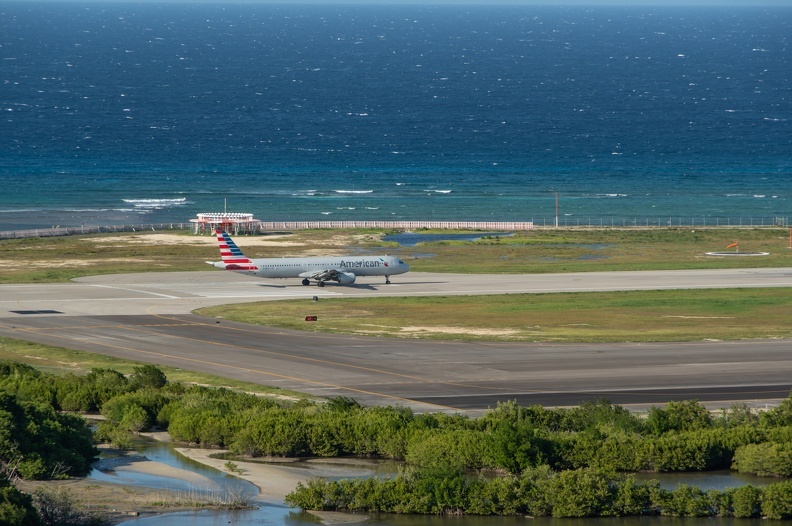 We weaved our way through more narrow roads and dodged more crazy drivers, ending up at a bar and gift shop overlooking the airport. We went to the roof and watched a few planes take off. 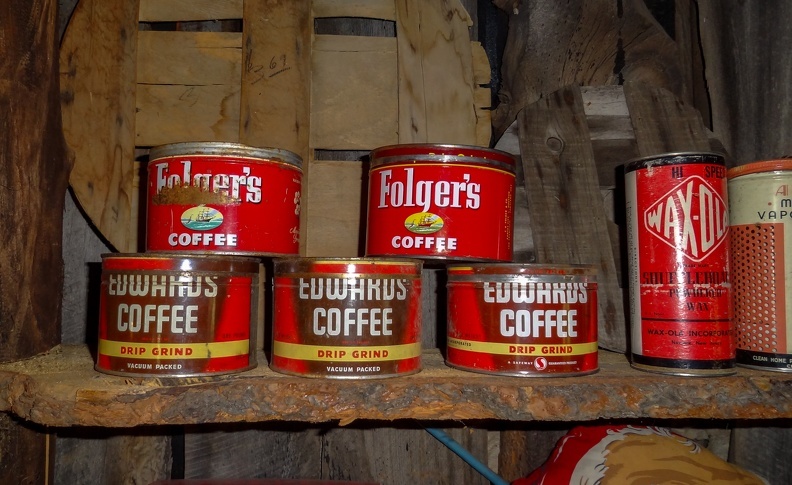 We took the opportunity to pick up a bag of delicious Jamaican Blue Mountain coffee. We headed down the hill from the shop overlooking the airport to a shopping center called Whitter Village. The shopping center had no historical or cultural significance, but there was a souvenir shop (and the driver probably got a kickback for taking us there). There was also a KFC, and the scent of fried chicken smelled really, really good for some reason. We picked up a few things at the shop and started to walk around. In the courtyard of the shopping center there was a fountain with a few local kids playing in it. We were then approached by another taxi driver asking if one of us was Alex. It turns out Alex had dropped his ship card in the parking lot. 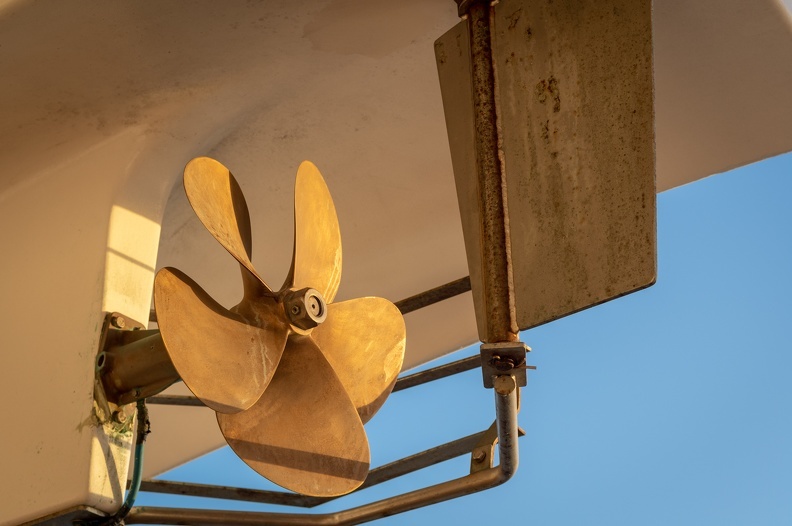 Losing the card would have been a bad thing, as it is what allows you to get on and off the ship. Who knows what would have happened if he had lost it, and we would not have wanted to find out. By now we were starting to get short on time and it would be time to head back to the ship. Howard took us to a beach by the airport, but they wanted $5 per person as an entry fee. We had already paid a tip to Howard’s friend at Sam Sharpe Square, and about $20 at Richmond Hill for entry. Why did nearly each stop cost money? We were not about to pay $25 for the five of us to go to a beach when there were public beaches we could have visited. Additionally, looking out on the water, it was really choppy and we could see a strong current. We passed on the beach, and Howard begrudgingly took us away from there. 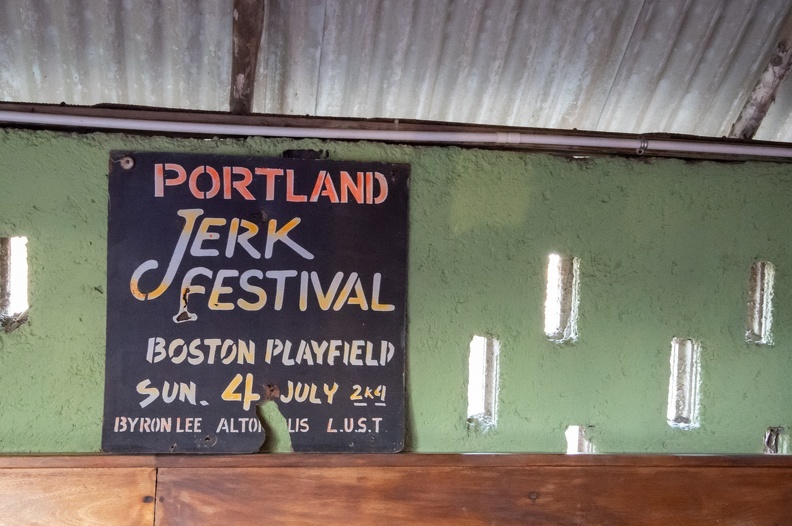 Instead, we decided to seek out some jerk chicken. We couldn’t visit Jamaica and leave without it! We checked one restaurant down the street from the beach club, but they didn’t have any. Alicia had heard about a restaurant called Scotchies that was well-known for its chicken. Luckily, it was near by, so we asked Howard to take us there. 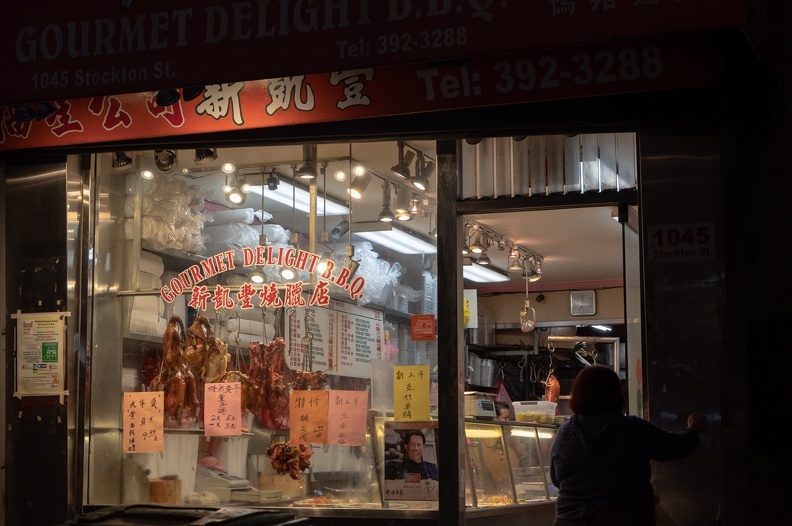 When we arrived, we could see the kitchen was open for all to see. Logs of pimento wood rested over a fire. 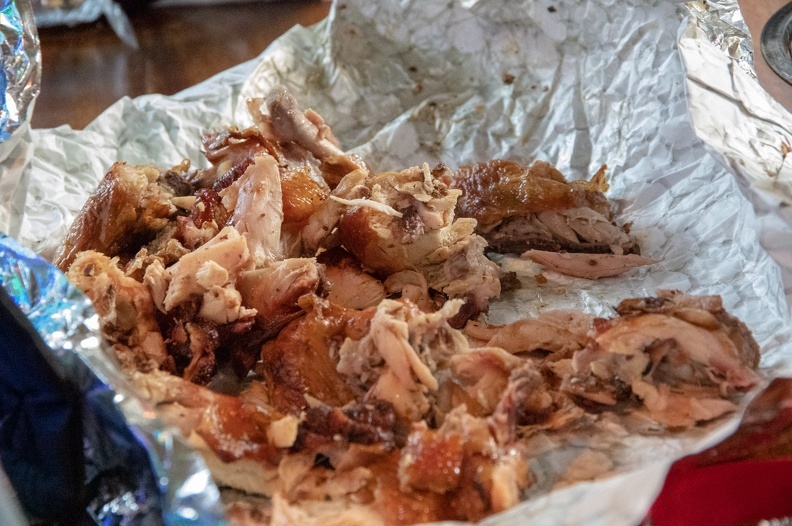 The chicken was cooked on top of the logs, and sheets of corrugated metal were placed over the chicken to trap the heat. It looked questionable, but someone with a lot more culinary sense than me came up with this stuff, so I didn’t question it. We ordered a pound of chicken, a half pound of chicken sausage, and drinks. All of the food was very good. 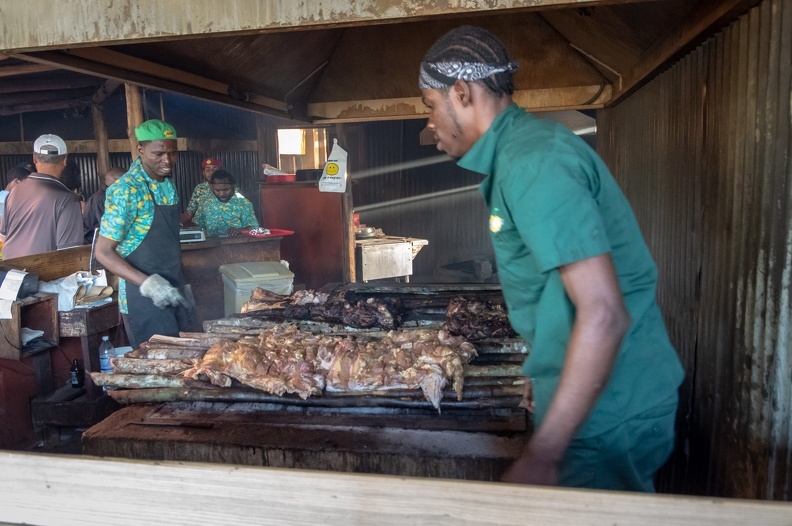 The jerk chicken was full of flavor, with just enough of a kick. The sausage was very spicy, but not spicy simply for the sake of being spicy. 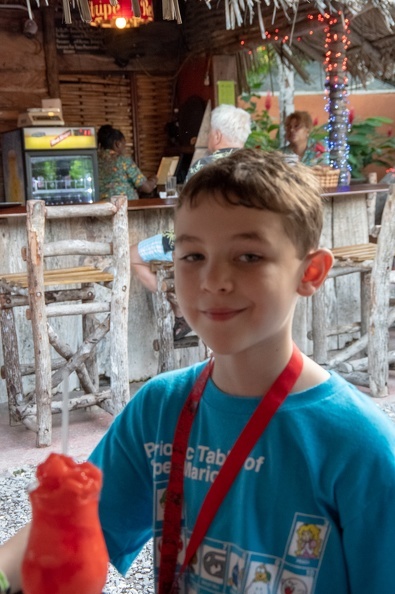 The boys enjoyed some chicken and (non-alcoholic) strawberry daiquiris. We all left happy, and surprised that food for five and drinks was only about $40. When we left Scotchies, we noticed we had about an hour before we had to be back on board the ship, so we started our way back. We figured an hour should be plenty of time. Not long after leaving Scotchies we rand into heavy traffic. Apparently everyone on Montego Bay decided they were going to head the same direction as us at the same time. OK Howard, time to work some magic and earn your pay! Howard turned off the main road for a possible shortcut, but that too was met with a long line of traffic. Didn’t I say to work some magic?! 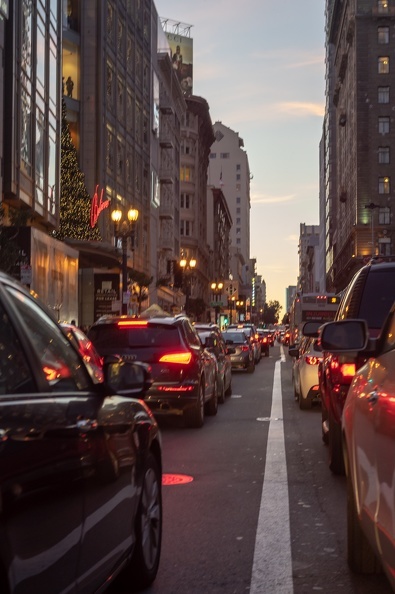 Howard made a cringe-worthy move, driving into the empty oncoming lane and making his way toward the front of our long line of cars, forcing his way back in line only when met with oncoming traffic. It still wasn’t enough, and Alicia was starting to worry as the deadline got closer and closer. Soon, we only had 30 minutes to get back, with no end in sight to the gridlock. 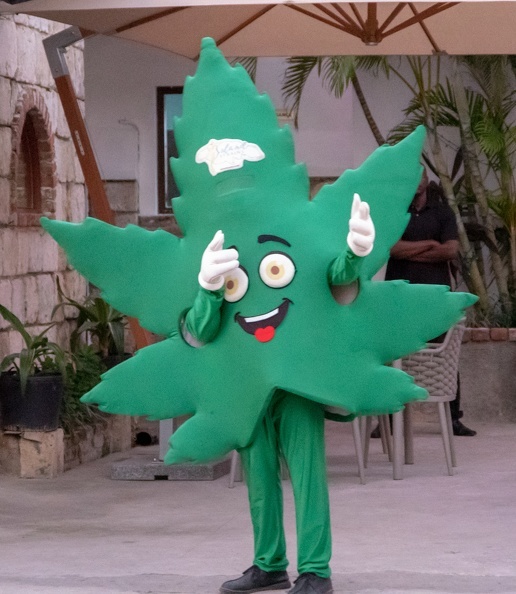 On the bright side, we did get to see a beautiful sunset and a dancing pot leaf. Howard took more liberties to keep us moving, skipping the line a few more times, and maybe even running some traffic lights. 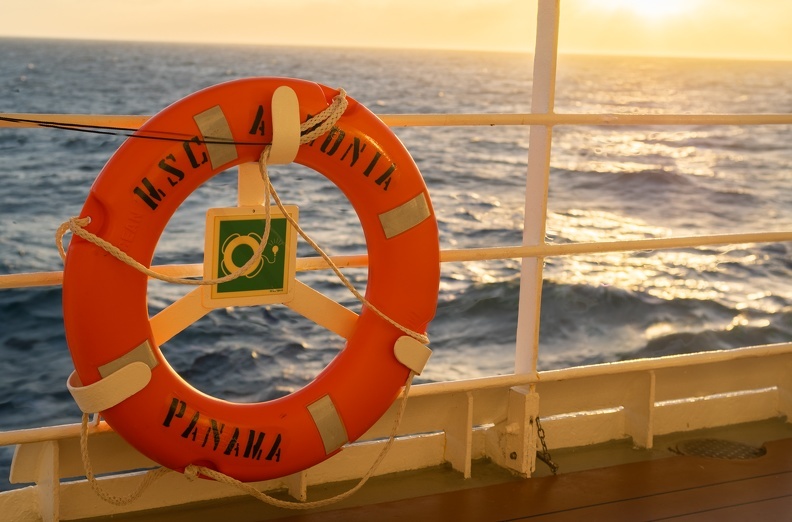 I kept assuring Alicia that we would be OK, and even offered up that if we were stuck in traffic, so too might official excursions from the ship. The ship wasn’t going to leave without them. I soon recognized where we were, and realized we were only a couple miles from the ship with about 20 minutes to go. Howard made some more daring moves, and I could finally see the traffic breaking. I knew we were going to make it. Howard got us to the terminal and we got onto the shuttle to the ship with about 15 minutes to spare. We were going to make it. 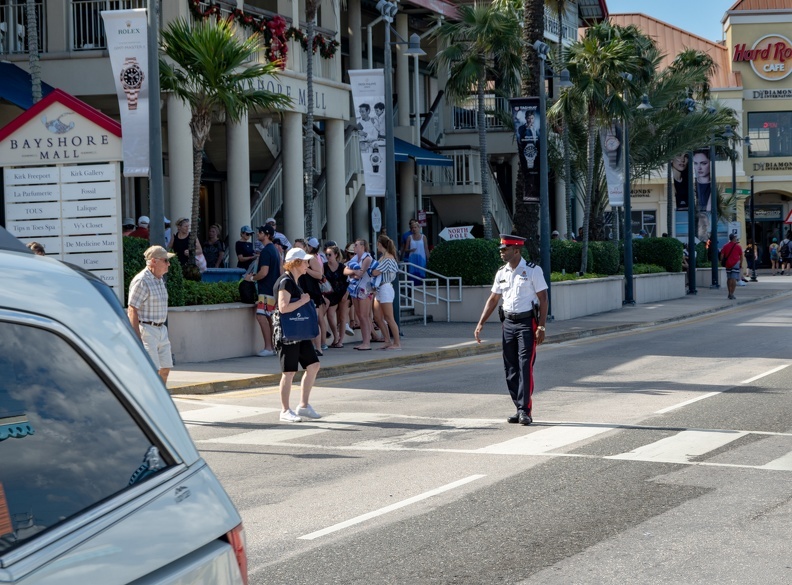 All in all, the tour of Montego Bay was good, if not slightly adventurous thanks to Howard’s navigation of the traffic. 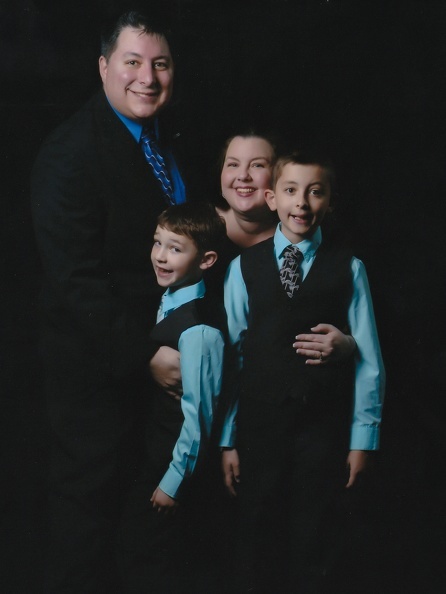 We cleaned up and enjoyed formal night at the dining room, and even took a few family pictures. The shower was still a challenge, and I often ended up with the shower curtain trying to wrap itself around me when I would turn around, but I figured out a system. It wasn’t a pretty system, but I found that rinsing, then turning the water off and opening the curtain allowed me to move around and soap up without getting trapped. I will not let the shower defeat me. Due to the previous night’s festivities, we slept in, waking to room service at the door. 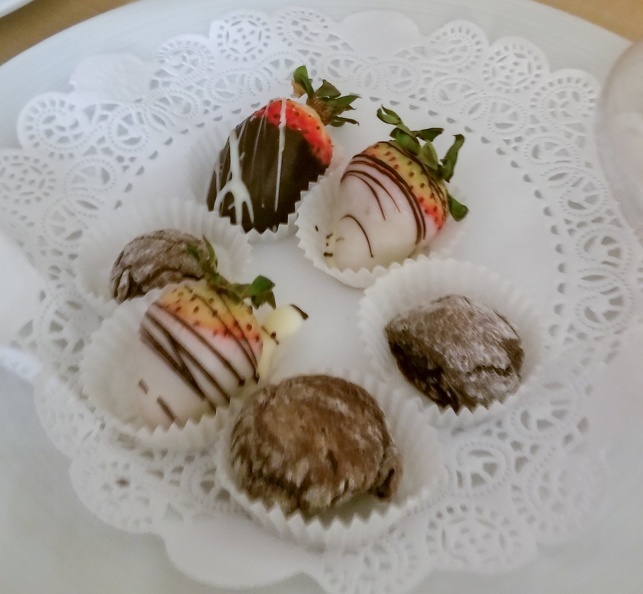 Breakfast wasn’t much, just a Continental breakfast of coffee and pastries, but it was enough to satisfy our hunger and we didn’t expect them to deliver Denny’s Grand Slams to our door. Besides, it it was almost lunch time. I dropped the kids off at the kid’s club so they could play for a while. 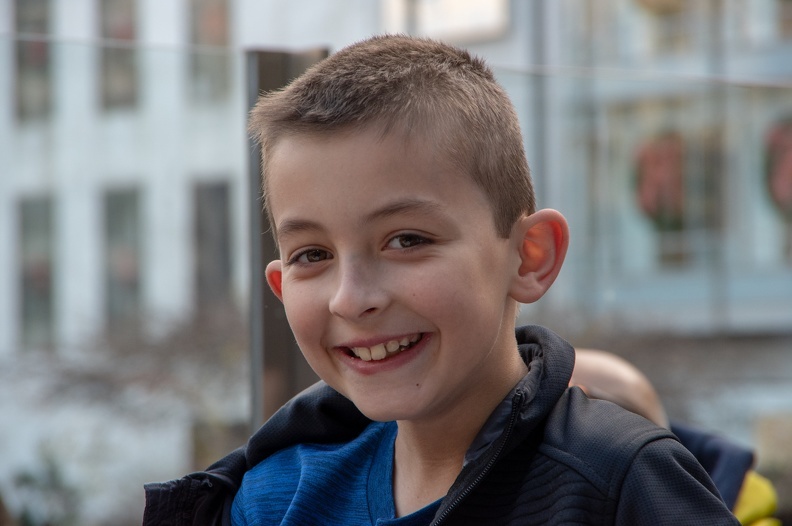 They seemed to enjoy the selection of video games, Lego kits, and art activities. 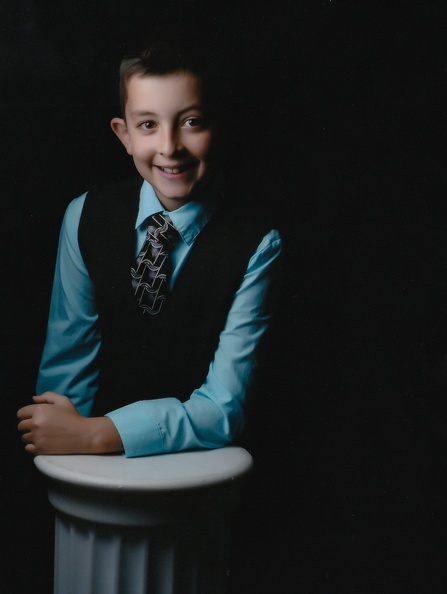 Ryan won a Lego-building contest by making an “Illuminati” – a triangle with an eye in it … very creative. Where do they pick these things up? Unfortunately, I didn’t get a picture, but this gives you an idea. After a cheeseburger and hot dog lunch, we went to the pool so the kids could play. The pool area was very windy, but that tends to happen when the ship is creating its own wind by moving forward at 25 mph. The boys managed to get themselves lost on the way to the pool. I went to look for them, but they found their way before I was able to locate them. The kids’ splash park was closed so the various fountains would not be hosing down the deck. Despite the wind, the boys enjoyed playing in the water as they always do. 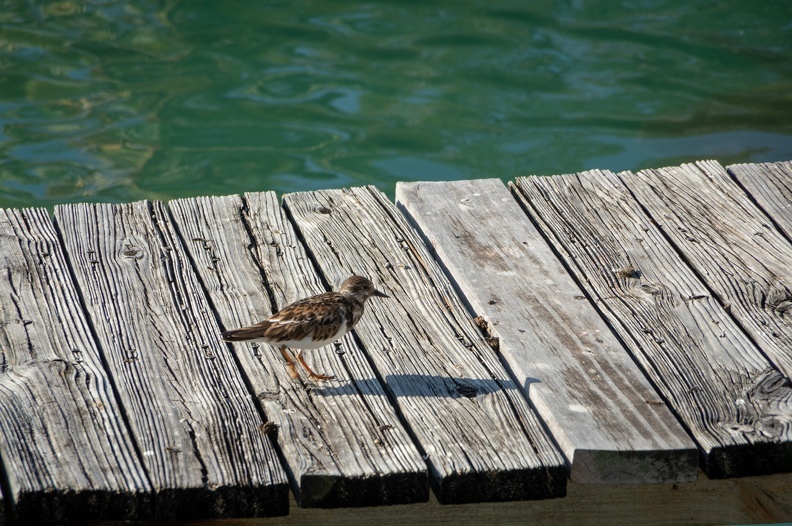 Every so often, we’d see someone’s towel fly across the deck. 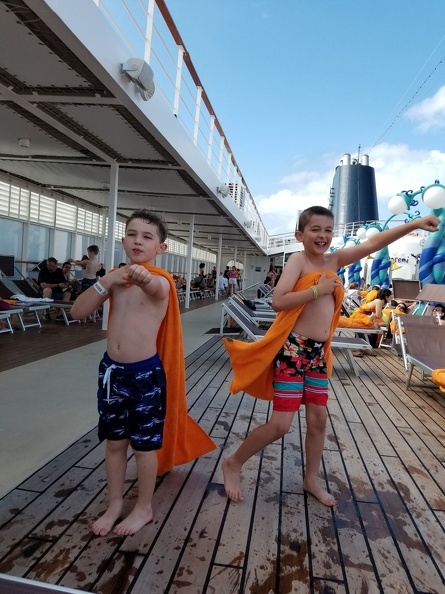 The boys decided to turn their towels into capes to fly in the wind. We cut the pool play a little short because of the wind, but grabbed some gelato from the poolside stand before heading back to the room to change. I took the afternoon to explore the ship, since there was not much else to do during the day if you don’t like the casino. 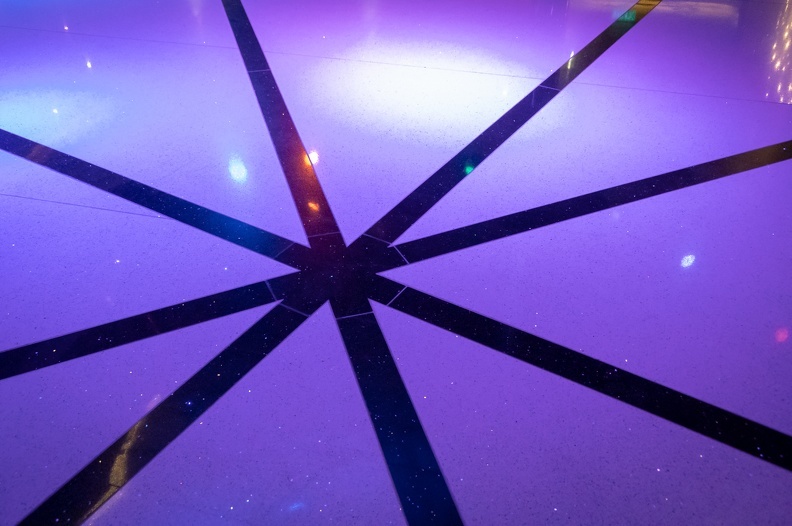 I noticed the décor was classier than that on previous cruises I’ve been on. The furnishings and decorations were fancy without resorting to cheesiness. 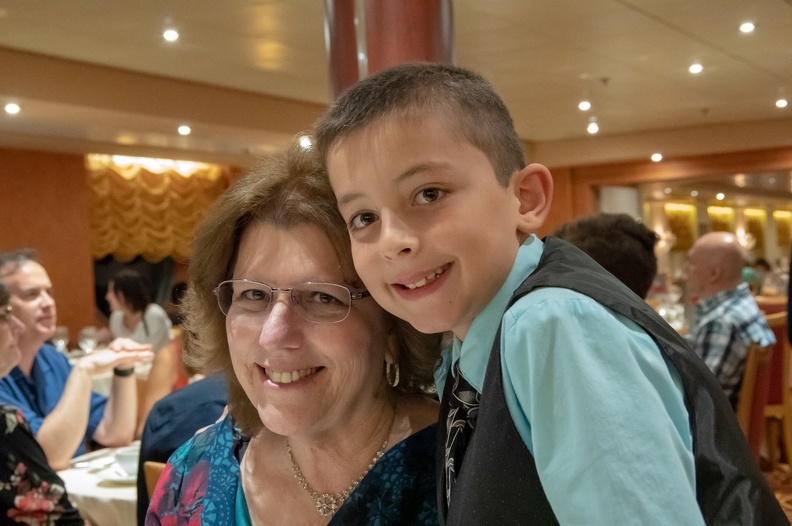 Soon it was time for dinner – it’s always time to eat on a cruise ship – I chose a double entree of chicken breast and biryani. Biryani is a mixed rice dish popular in the Middle East and India consisting of rice, spices, and vegetables. Commonly it is served with meat mixed in, but tonight it was a vegetarian option (hence the chicken breast). I had biryani a lot when I was deployed to Iraq. 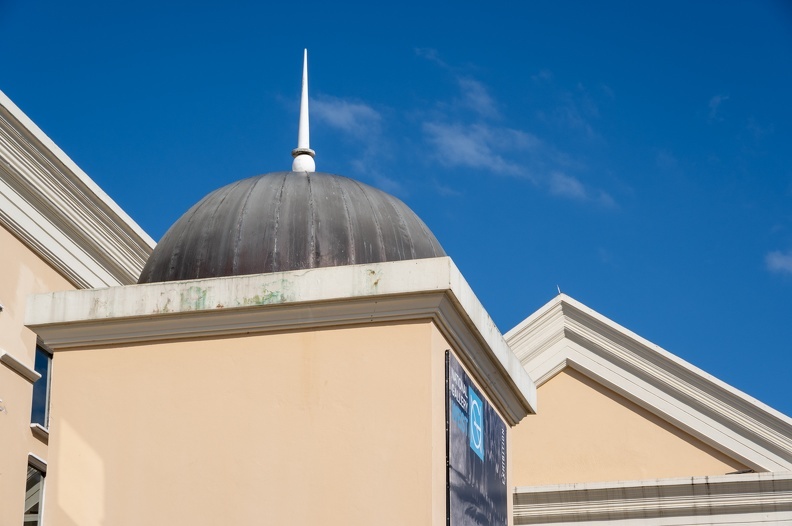 Often we would go to towns around the base to meet with the local sheikhs. The sheikhs always made sure to provide their guests with a large meal. I hadn’t had biryani since then, mostly because I could never find anyplace that sold it (and I was too lazy to make my own). The ship’s take on biryani was good, but nowhere close to the “homemade” stuff I had so many years ago. 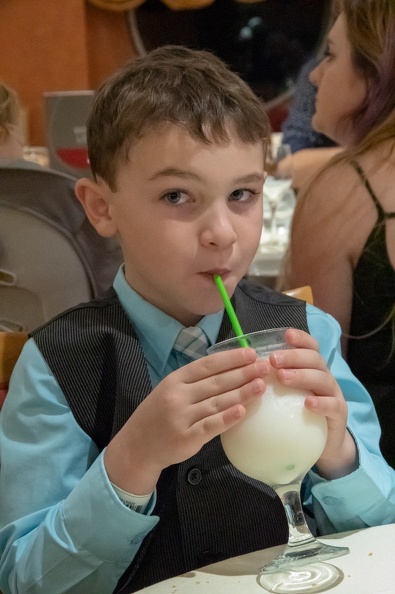 The boys, meanwhile, discovered piña coladas (non-alcoholic, of course). After dinner I walked around the ship some more. 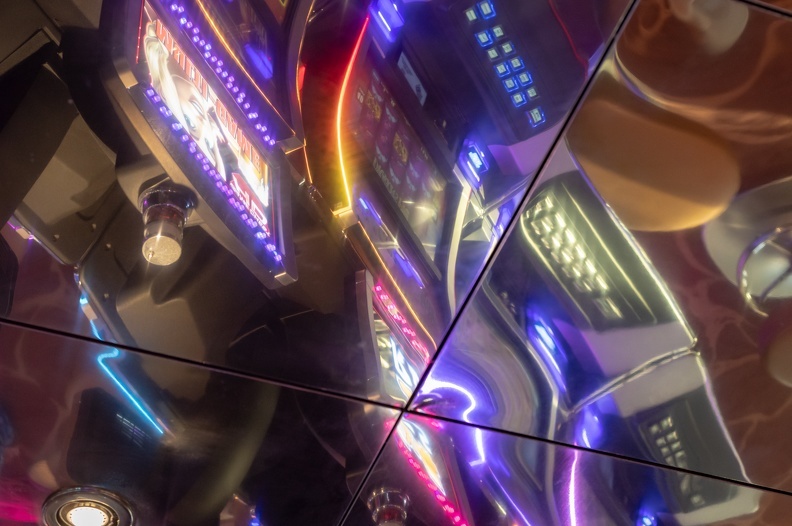 I joined Alicia and my mother in the casino, but the machines were not very friendly to me. I quickly lost the money I allowed myself to spend. The house always wins (against me). Tomorrow we arrive in Jamaica. 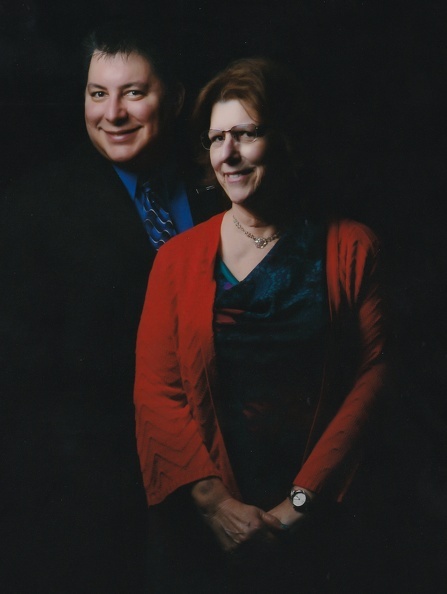 We had been planning a New Year’s cruise for several months. 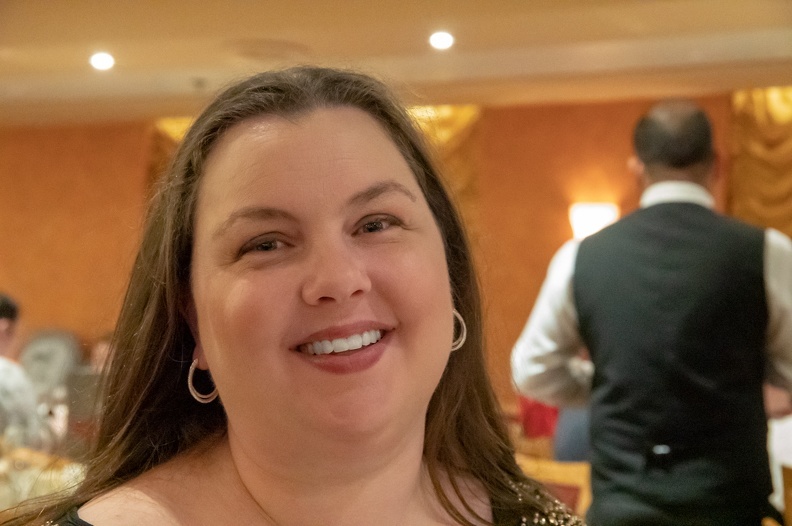 Alicia had gotten a free cruise from Royal Caribbean during her last trip. She got in touch with a company called URComped and they matched her free Royal Caribbean cruise for one on MSC. 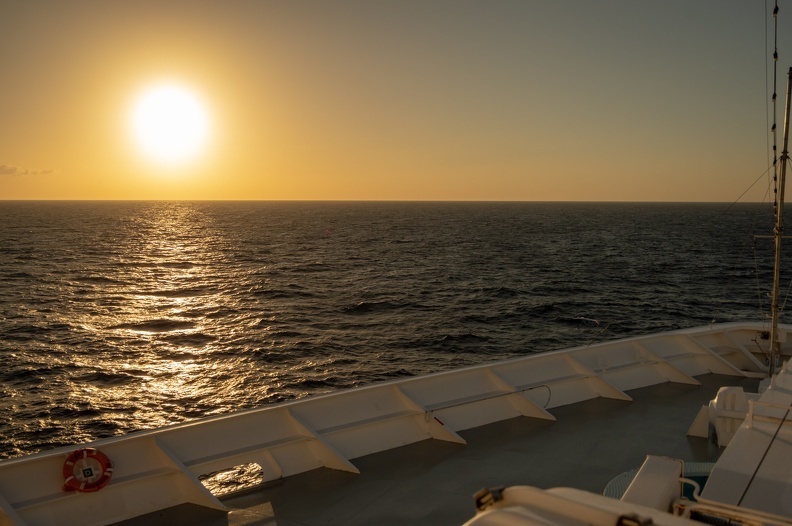 MSC has not been sailing out of the United States for long, but have been around the Mediterranean for some time. 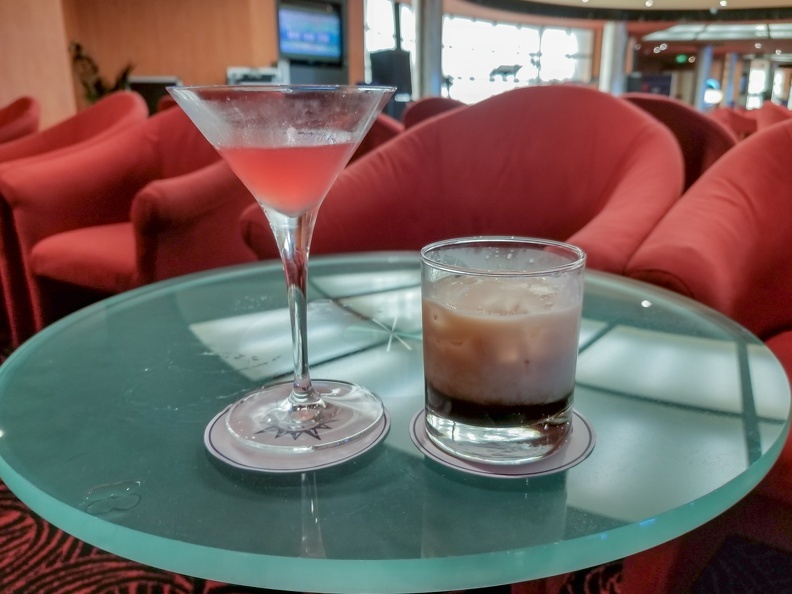 What drew us to this cruise was that one of the port calls was two days in Havana, Cuba. 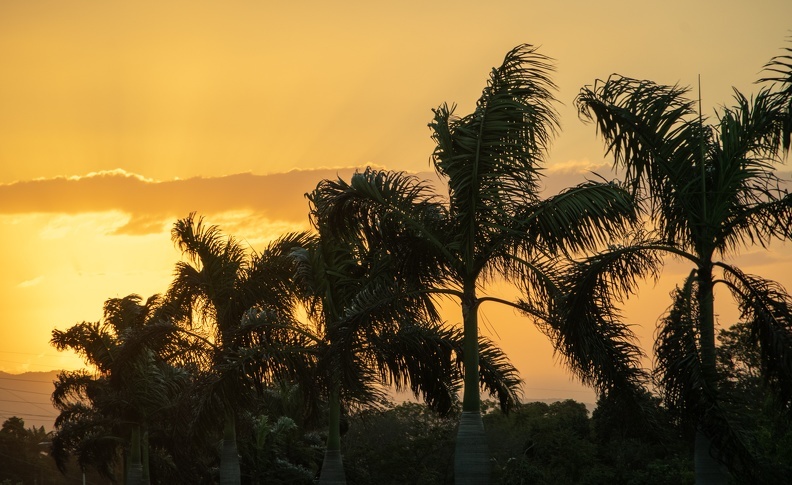 Something about Cuba drew us to the cruise. Maybe it’s because for so long Cuba was off-limits for Americans to visit because of the US embargo. Over the past few years, relations have been softening and the opportunity to visit was presented with some limitations. Plus the trip was free – the best price. The excitement was building as we got closer to departure day. We were looking forward to the trip, especially Cuba. We had made plans to see all Havana had to offer, and really looked forward to touring the city in a classic convertible car. 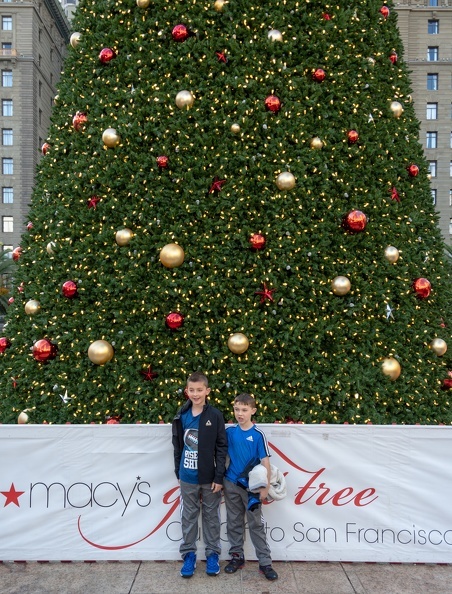 We spent the day of the 29th in the city. We skated at Union Square. 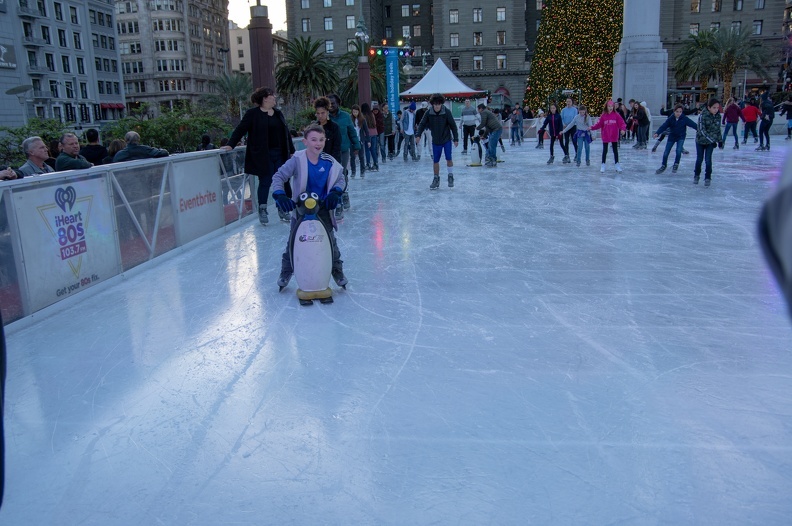 Every Holiday season they set up an ice rink at Union Square. Though the boys don’t know how to skate, they had fun on the ice. Alex “acquired” an abandoned penguin-shaped skate helper. We met up with Christelle and Armando, and their children for the skating adventure. Christelle is an old friend of Alicia’s and it’s always fun to get together with them. After skating, we had a fun dinner at Boudin in the basement at Macy’s. The boys had a delicious-looking cheese pizza from the Wolfgang Puck pizzeria. As we headed out of Macy’s, I noticed a suspicious-looking character behind us on the escalator. He was calmly going up with a purse tucked under his arm. I heard a voice from the bottom of the escalator shouting, “Sir! Sir! You can’t take that off the floor without paying.” I looked back and could see the character had no intention of paying attention to the employee. So I did what came naturally. I knew if I stopped at the top of the escalator, he had nowhere to go; so I did. I turned around and told him, “Sir. She said you can’t take that off the floor without paying.” No response from character … OK then. I reached out and grabbed the purse from him. He resisted a little, but let go of it and I handed it back to the employee, who was very thankful. The character had grabbed my wrist, but a stern stare at him made him let go and walk away without his ill-acquired prize. After he walked away I realized that certain things have become second nature to me from 10+ years in law enforcement. I instinctively turned my right side (my weapon side) away from the suspect, and I continually watched his hands (the hands will hurt you). That little bit of excitement had me feeling good for a good while as the night went on. Alex even quipped, “See? That’s why you don’t steal. Because someone will tell someone who’s bigger and you’ll get in trouble.” Words of wisdom beyond his years. 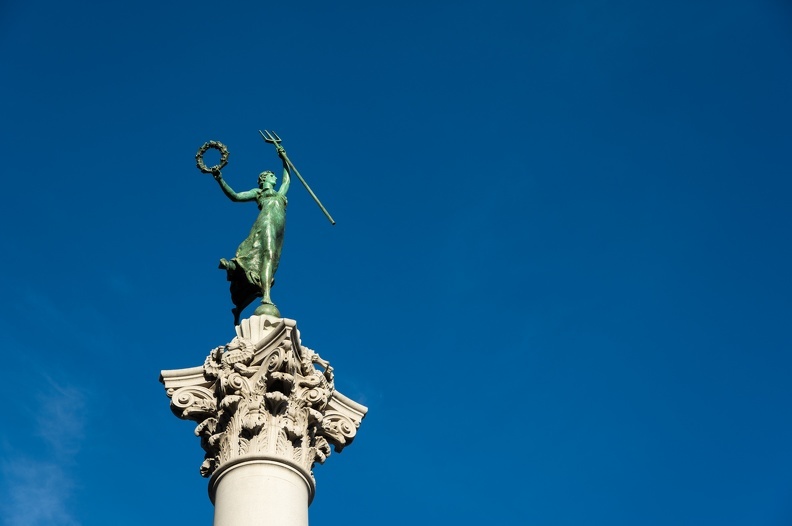 We left Union Square and headed further into the city to explore a bit. 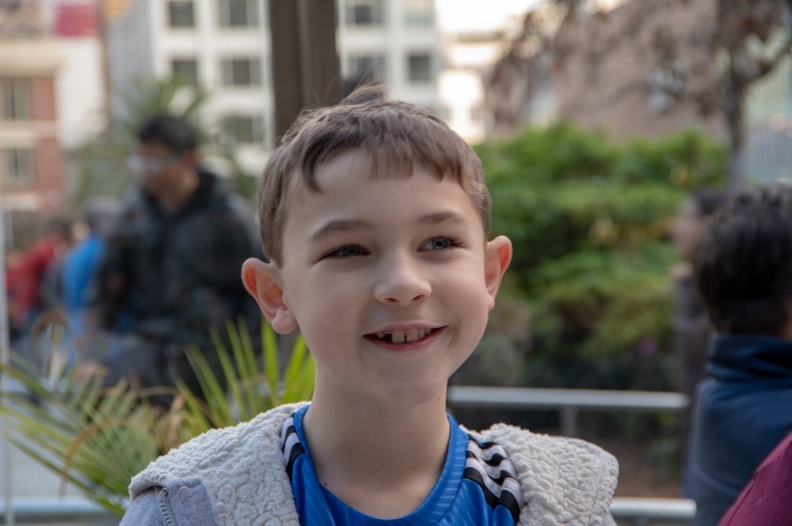 We took the kids down Lombard St. – “The Crookedest Street in the World” – and got a view of Coit Tower. Soon it was getting a little late, and we had an early flight. 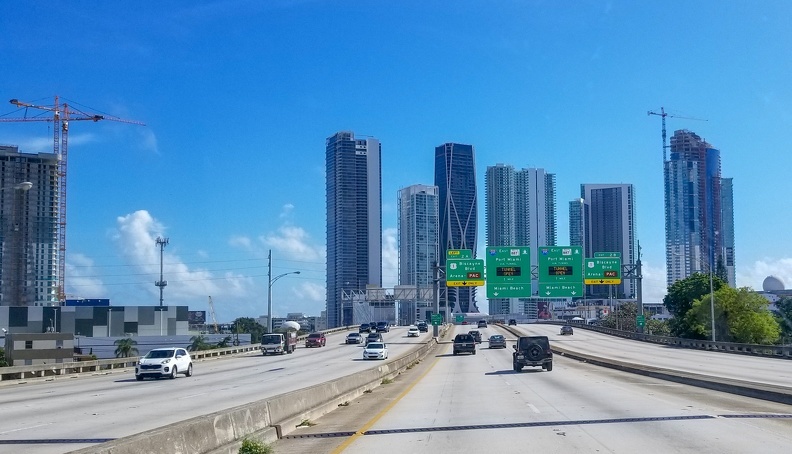 We did our best to get through the city traffic with ease (though that’s easier said than done). The next morning we got up at 5 a.m. to take the shuttle from the hotel to the airport. The shuttle driver showed up about 15 minutes late and drove the bus like he stole it to try and make up for lost time. 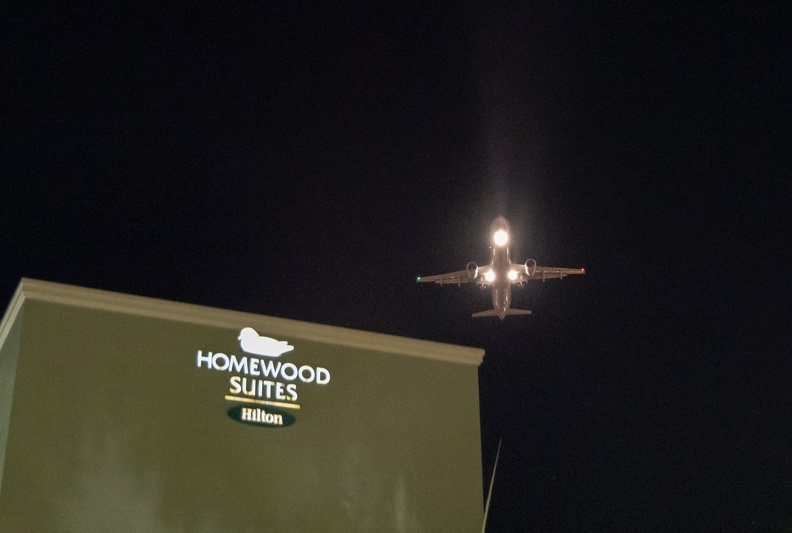 Nobody expected a thrill ride from the hotel to the airport! I woke myself with a Peet’s coffee and a bacon/egg croissant. The boys got muffins and it looked like half of the muffins made it to the floor in the form of mountains of muffin crumbs. On a side note, this is also about the time I found out my phone’s camera could no longer focus to infinity. 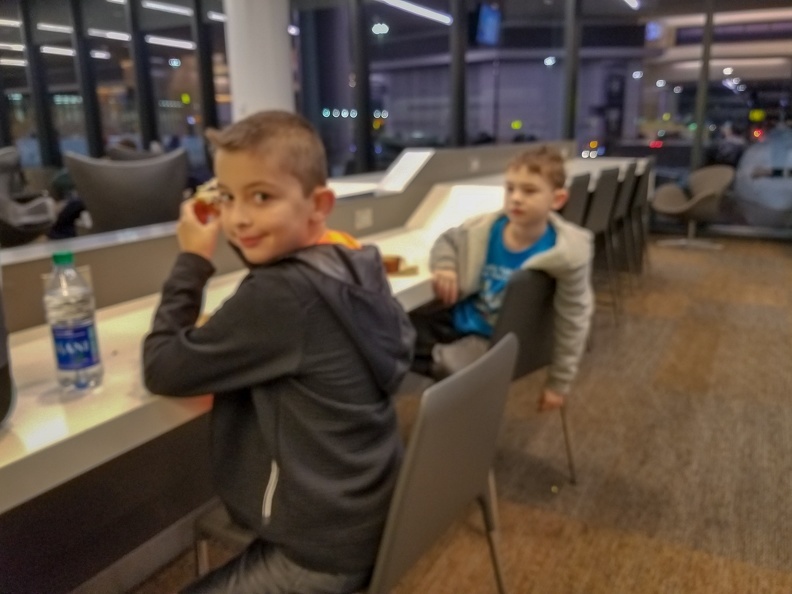 The boys occupied themselves through the flight with books, games, and in-flight movies. Despite a cramped seat, I managed to make it most of the way through Neil Peart’s book Ghost Rider. We met up with my mother at the hotel and had dinner. 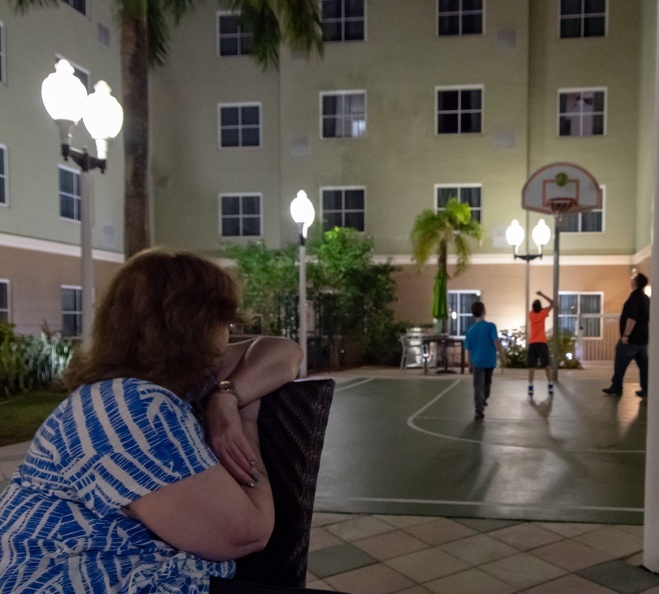 The boys wore themselves out by playing basketball in the hotel’s courtyard, which also happened to be under the approach path for Miami International Airport. Today was boarding day but not before a little cross-country business. Embarkation day was also the day of a promotional interview at work. Fortunately, the interview panel was nice enough to do the interview by phone. That’s the first time I’ve done an interview in a pair of shorts and t-shirt. With that out of the way, it was time to go. Our home for the next week would be the MSC Armonia. 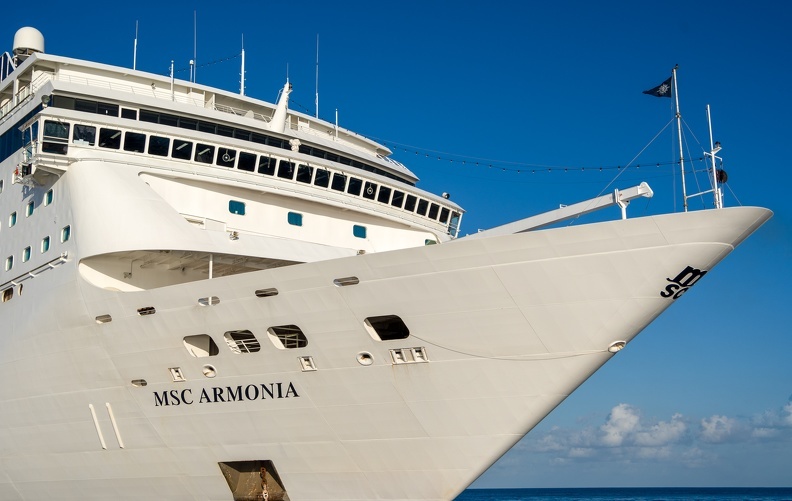 Armonia was originally built in 2001 for Festival Cruises as MS European Vision. 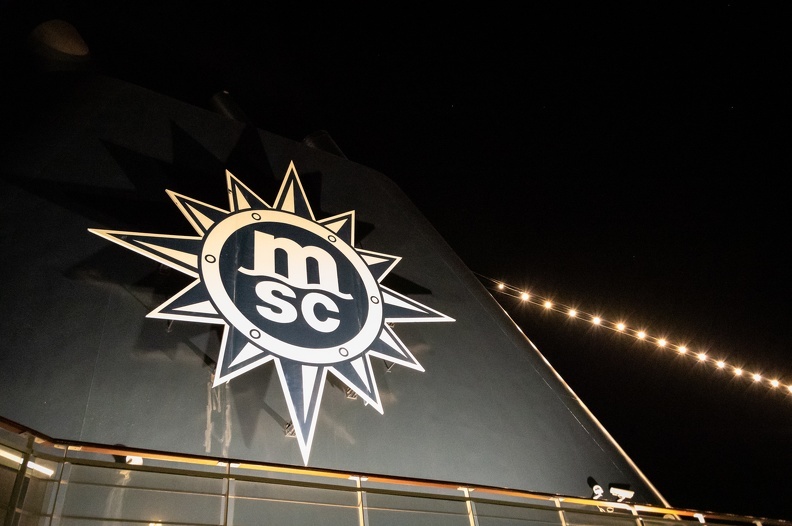 She was purchased by MSC in 2003 and re-christened. Originally 824 feet long, she was lengthened in 2014 to 902 feet. During the 2014 renovation, Armonia was cut in half and an 80-foot pre-built section was inserted in the gap. She carries nearly 2700 passengers and more than 700 crew. 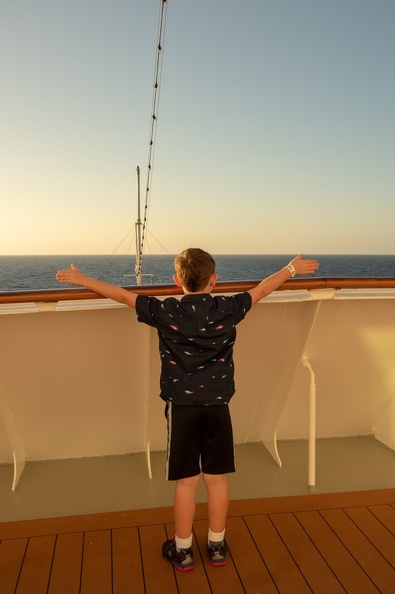 Having only cruised with Carnival before, I expected the embarkation process to be about the same: a long line with the 3000 other guests, reams of paperwork, wrangling children, waiting in line to board, the whole deal. Our process with MSC was really quick. There was no line, and MSC had a large amount of agents to deal with completing the registration process. Within a few minutes, we were walking up the gangway to the ship. I stopped on the way to the gangway at a table with dispensers of “natural water.” What exactly is “natural water?” I was not aware that “artificial water” was available as a consumer product. As it turns out, their “natural water” was just water with slices of lemon in it. With about five hours to go before we sail, we had some time to kill. 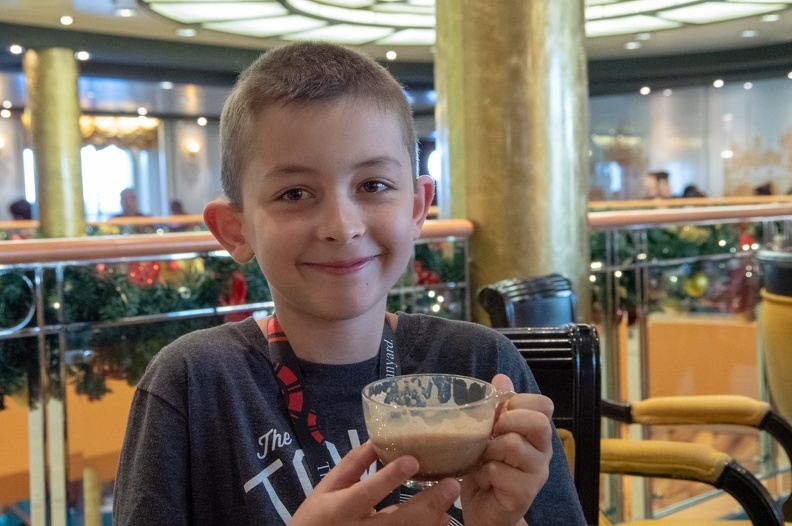 We were told cabins would not be ready for about an hour, so we did what any cruise guest would do – eat! We headed up to the buffet and circled around looking for a table for five, eventually finding one after a group got up. The chicken wrap was not too bad. The boys chowed down on the traditional pre-cruise cheeseburger. Sitting at the table, enjoying my lunch I did what comes natural, I people watched. 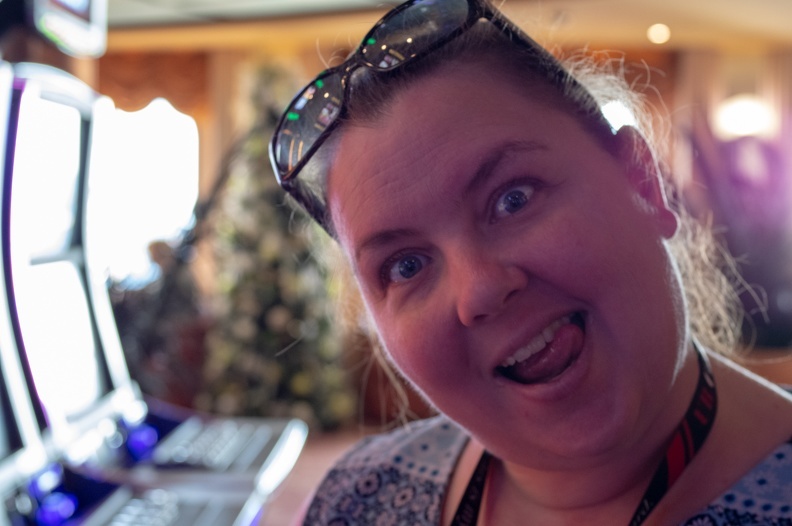 Looking around, I noticed something that was much different from other cruises I’ve been on, even those out of Miami. Most of the guests were not speaking English. This will be interesting. After lunch we got changed into swimsuits and hung out by the pool. The pool area was surprisingly not that crowded. The kids enjoyed playing in the splash park, while Alicia and I soaked in the pool. I have never seen so many tiny bathing suits in one place. Guests of all ages, genders, and body types were walking around in itsy-bitsy teeny-weenie bikinis and speedos. From leathery old Latin and South American ladies to middle-aged guys with hairy chests and beer bellies. Even a few young children were sporting the tiny swimsuits. I didn’t get the memo and left mine at home. 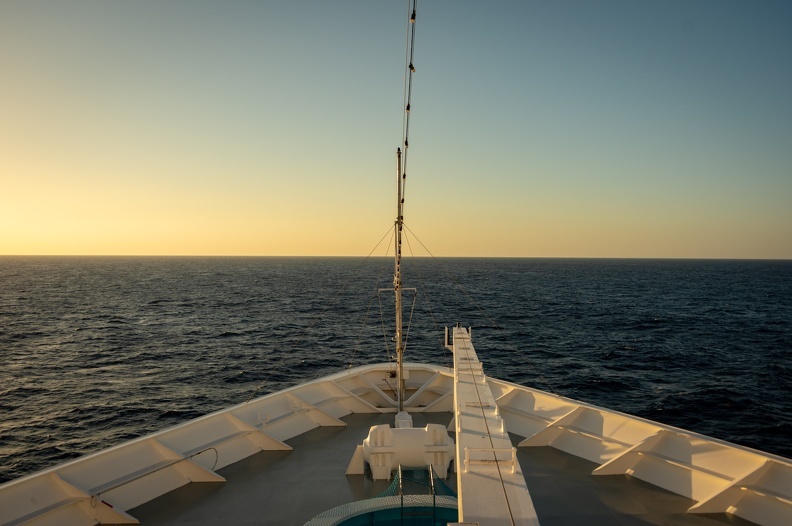 Because of the wide variety of nationalities on the ship, all announcements were done in several languages – usually English, French, Spanish, Italian, and Portuguese. The emergency drill was no exception. As we stood around being given information about the ship’s emergency procedures, I look around and what do I see? People taking selfies while in their life vests, completely ignoring all the instructions (which included no cell phones or personal belongings at the drill). More room in the lifeboat for me, I guess. After the formalities were out of the way, it was time to set sail for our first port. Shortly after setting sail it was time for dinner. 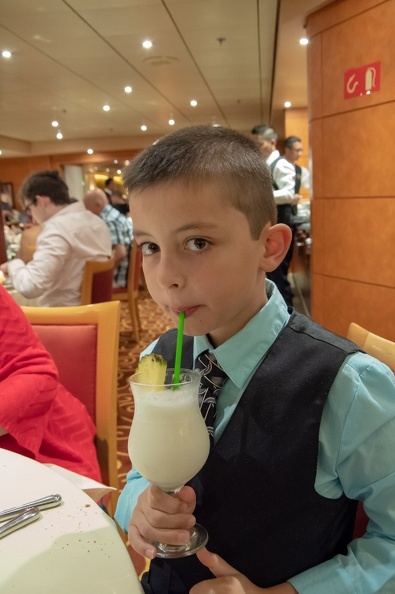 Cruise ship dining rooms are typically a place where you can get fancy food any night. I think I’ll have the filet mignon (bacon-wrapped) and lobster tail. But where’s my drawn butter? The food was good anyway. The filet was perfectly good and the lobster was nice and tender. For dessert was berry cobbler with vanilla ice cream; also very delicious. Seeing as it was New Year’s Eve and it was only about 7 p.m., I was starting to get tired after the day’s activities. The boys and I took a nap so we’d be able to celebrate the arrival of the new year. The ship was looking to be one large party in the minutes leading up to midnight. The nap was just what we needed, though Alex had a little difficulty getting up. We headed up onto the pool deck for the party. There was a stage with a band, and a large group of revelers. Champagne was ready, but only being sold by the bottle (what?) at $50 a pop. So there I was, celebrating with a can of Angry Orchard, and Alicia with a rum drink of some sort. The ship’s captain came up on stage to start the countdown from one minute. There we were, about 1000 guests, the captain, and a band under the skies of the western Atlantic for New Year’s at sea. 10, 9, 8 … the crowd started to get louder … 7, 6, 5 … the captain told everyone to count with him … 4, 3, 2 … oh wait, is the clock off by a minute? Who cares … 1 … HAPPY NEW YEAR! The crowd cheered, couples toasted and kissed, and the ship’s horn sounded several times. We capped off the night with fresh pizza from the ship’s pizzeria. Welcome to 2019. We headed back to the cabin to call it a night, though there was nowhere to be tomorrow since we’d be at sea all day. 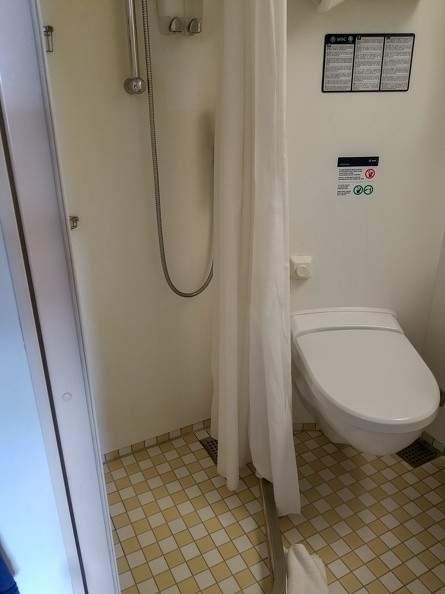 Because of limited space, some liberties have to be taken when planning staterooms. Some things are made smaller than others. You need to have room for multiple beds, so you can’t take a lot of space from the living area. You have to be able to hold a week’s worth of clothes for up to four people, so you have to have a good-sized closet. So where do you reduce space? In the bathroom. In the case of Armonia, it appeared they chose to downsize the shower. Clark Kent would not even have room to change into Superman inside! In any event, I’m up for a challenge when it’s time to clean. 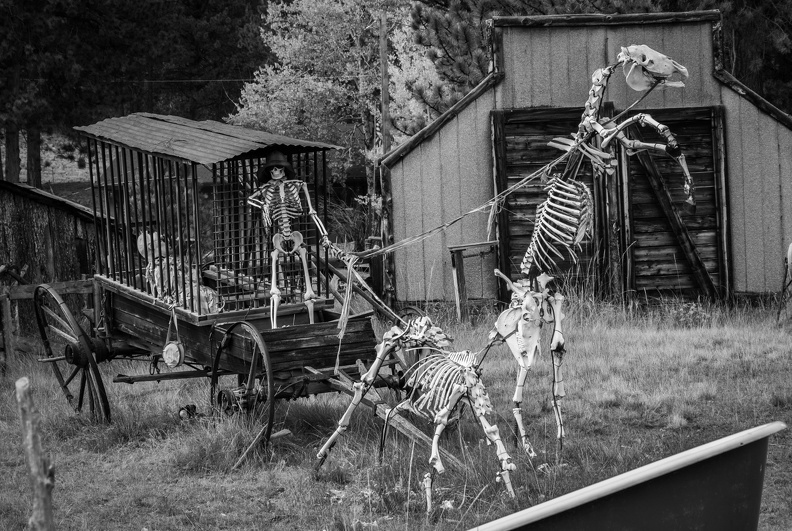 It’s the final day of our MRP tour of Colorado – well, part of it. We packed up our belongings and loaded them in the support trailer for the ride back to Littleton. 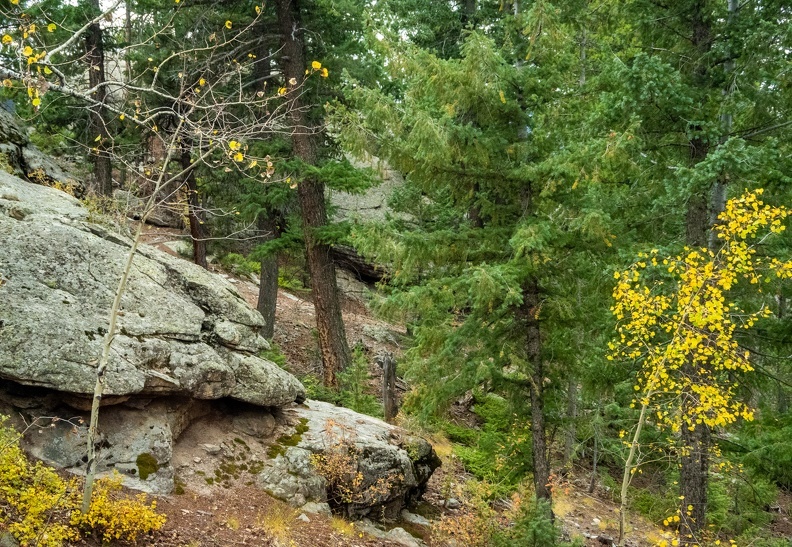 We headed out of town on US Highway 24 through Ute Pass and back to Woodland Park. It was slightly breezy, but nothing like the previous day. 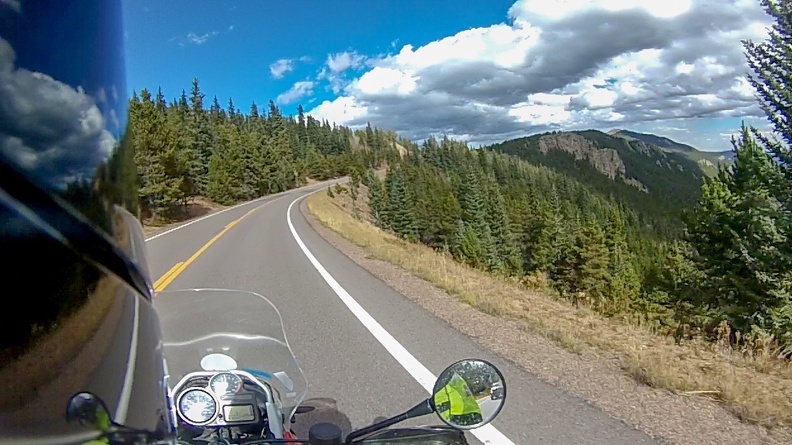 We turned north on Colorado Highway 67 and headed into the Rampart Range toward Deckers. 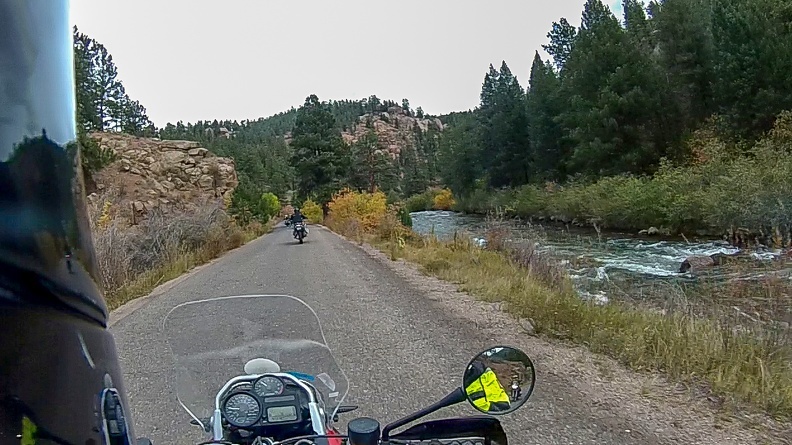 From Deckers we followed the South Platte River on County Road 126 as it wound west then north through multiple canyons carved by various creeks. 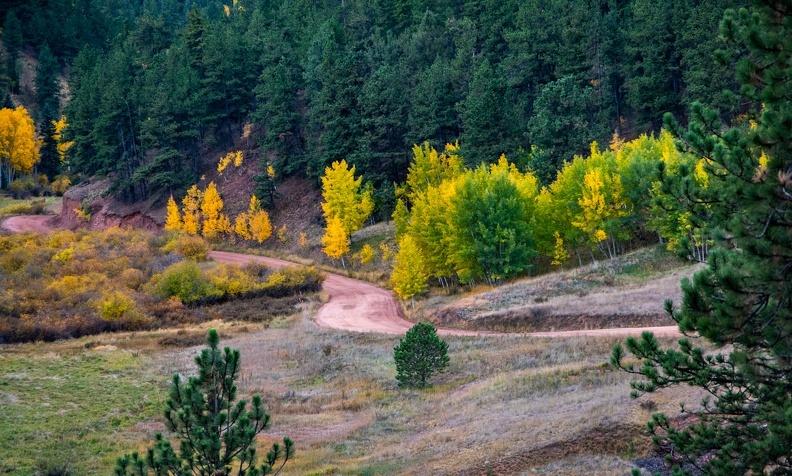 As was typical, the road was lined by dark green evergreens, yellow aspens, and brown grasses. The road followed the canyon, then climbed up and over a ridge, coming out at Pine Junction. From Pine Junction we went west on US Highway 285 toward Bailey. 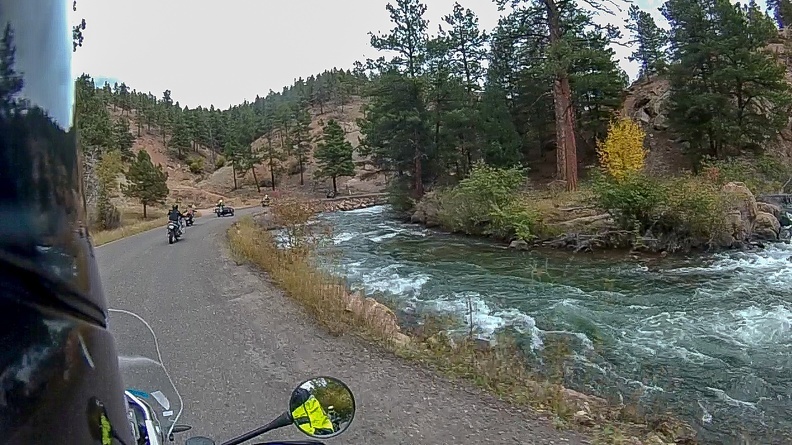 We dropped down into Bailey, where the highway hugged the South Platte River through its canyon. Along the way, the steep mountains bordering the canyon leveled out into a strip of farmland along the river’s banks. 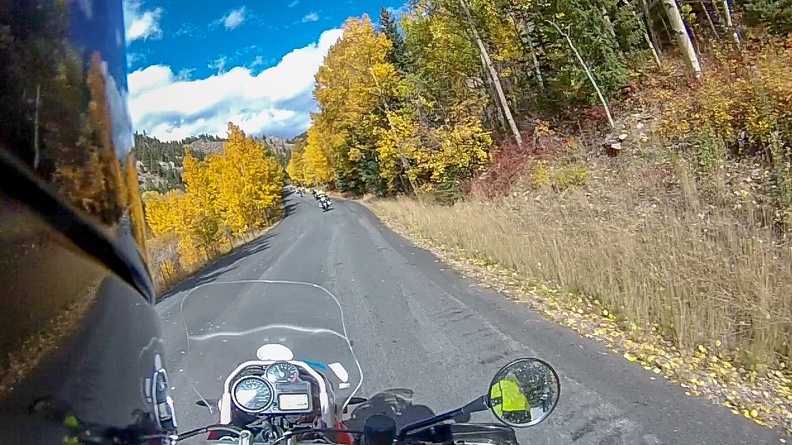 When we reached Grant, we turned north onto Guanella Pass Road to make the climb up. 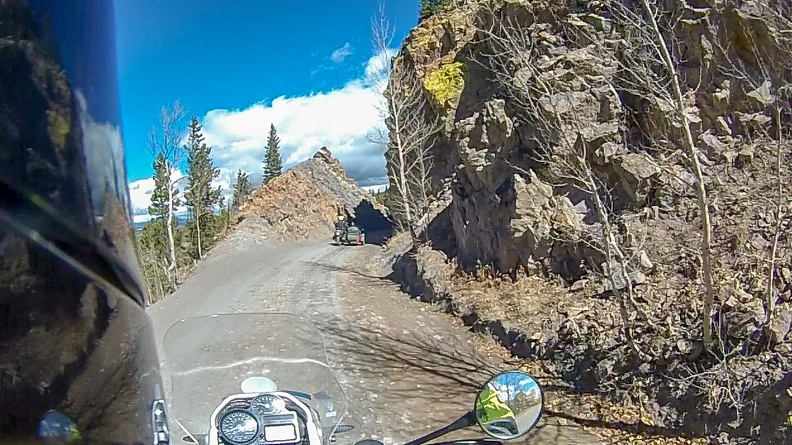 The pavement was very smooth and traffic was light as the road climbed the pass following Geneva Creek. 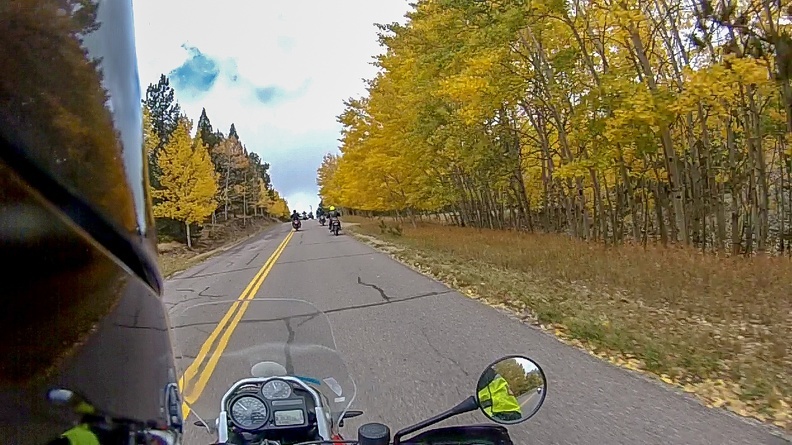 We passed through several yellow tunnels of aspens on our way up. Once the road started making it final climb to the summit, I slipped back from the pack as we wound up the tight switchbacks. A cold drizzle started to fall as we went up. 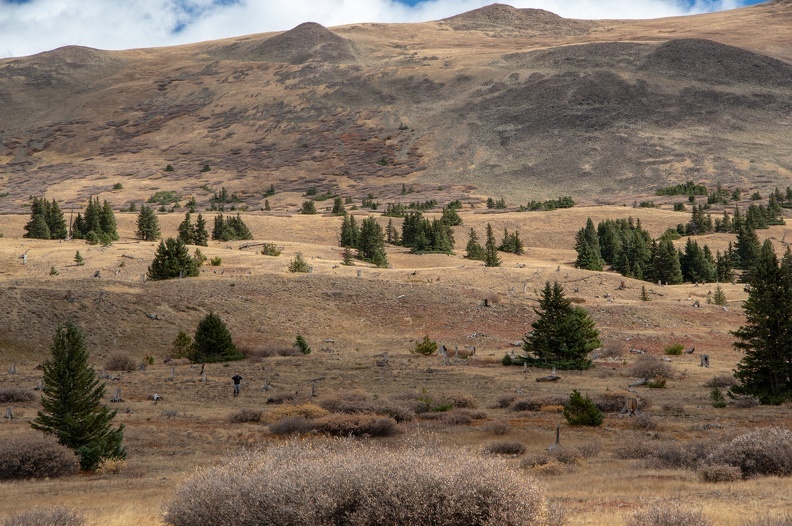 We passed through the tree line near the pass’s summit and we were greeted with a vast valley of brown rocks with sparse specks of green trees that managed to survive at the altitude. Several peaks were visible from the summit. 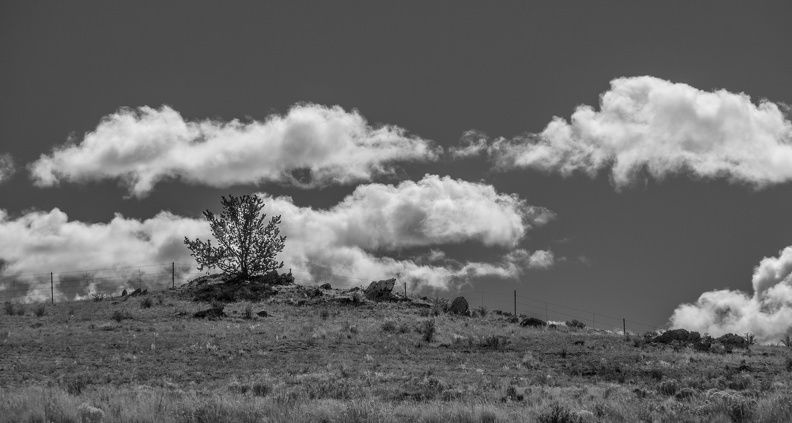 To the east, Geneva Mountain, Mount Bierstadt, and Mount Evans. To the west were Squaretop Mountain, Mount Wilcox, and Decatur Mountain. 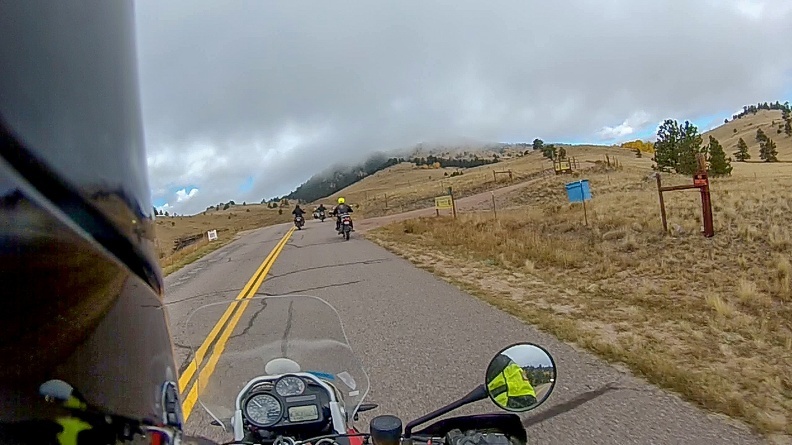 As I rolled across the summit (elevation 11,669 ft), I still did not see the rest of the group. I didn’t think I was going that slow as to let them get so far ahead. We didn’t stop at the summit because we thought the group was already on their way down. As we descended, more rain started to fall. The air temperature gauge on the GS was showing it was in the low 40s. Soon, the drizzle turned into gently floating snowflakes. It was not thick enough to stick, but I guess I can mark “riding in snow” off my list. As I was riding down the pass, I saw a bighorn sheep along the side of the road near the Silver Dollar Lake trail head. 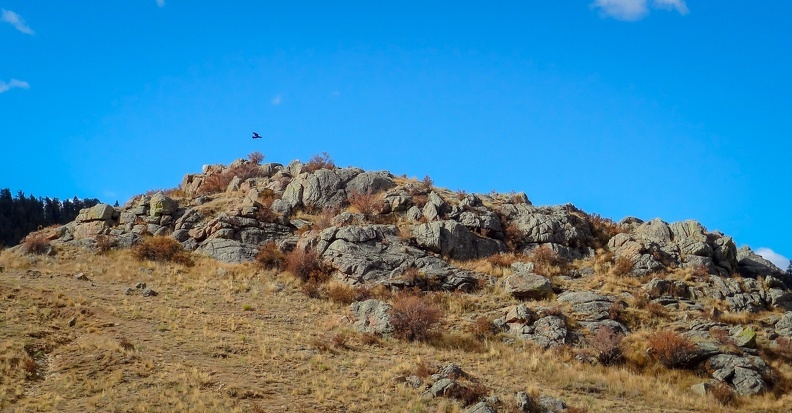 He must have been shy because he bounded down the hill before I could stop for a picture or turn on my video camera. 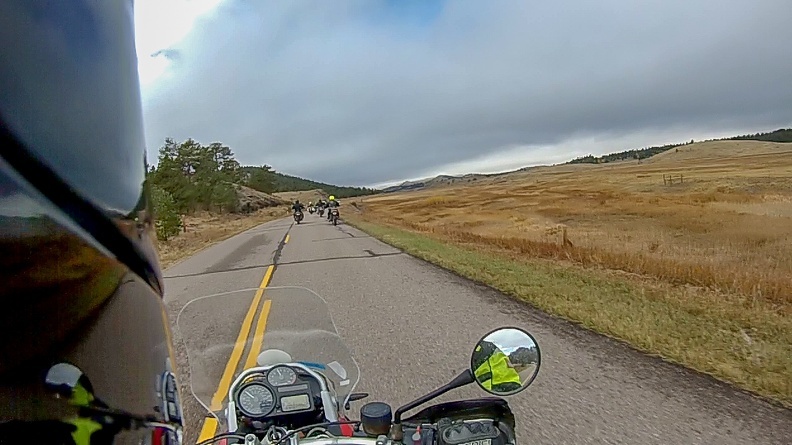 The road straightened out a bit near Cabin Creek Reservoir, but I still saw no sign of the rest of the group. They must have been booking it! 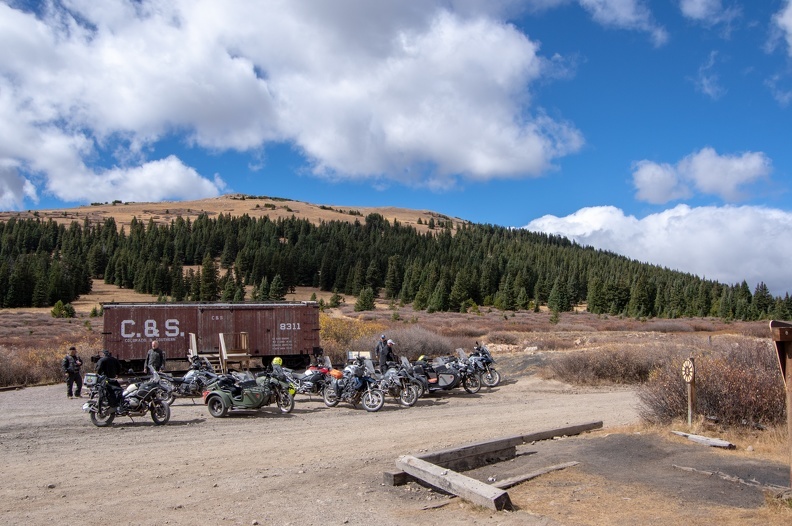 I arrived in Georgetown with one other rider and the support truck and stopped at the city park where we were supposed to have lunch – the group was nowhere to be found. It turns out they had stopped at the summit and had been in a parking lot that was not visible from the road. The rest of the group caught up and we ate lunch in the park in the shadows of the towering mountains adjoining the Clear Creek valley. A quick stop for gas and a warming cup of coffee, and we were off on Interstate 70. 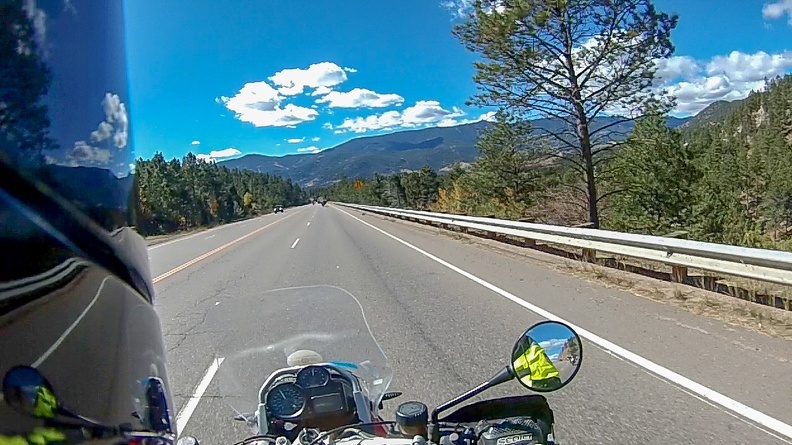 We got off the Interstate at Idaho Springs and climbed Colorado Highway 103 toward Mount Evans. 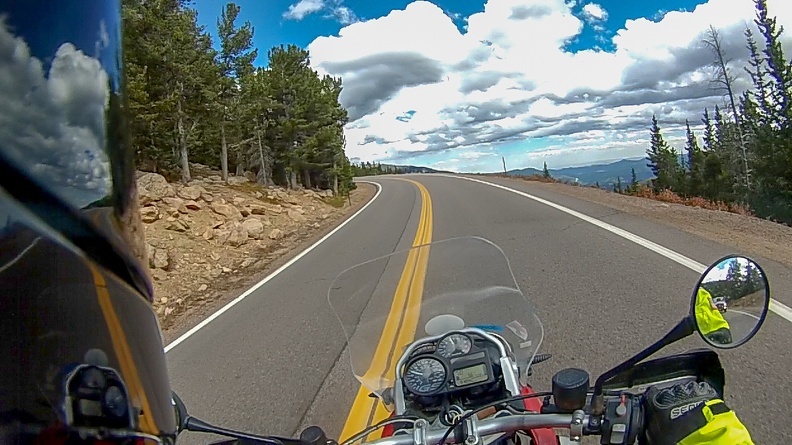 The gentle curves of the highway gave way to twisty switchbacks as we climbed from 7,500 feet at Idaho Springs to 10,650 feet at the base of the Mount Evans Road. 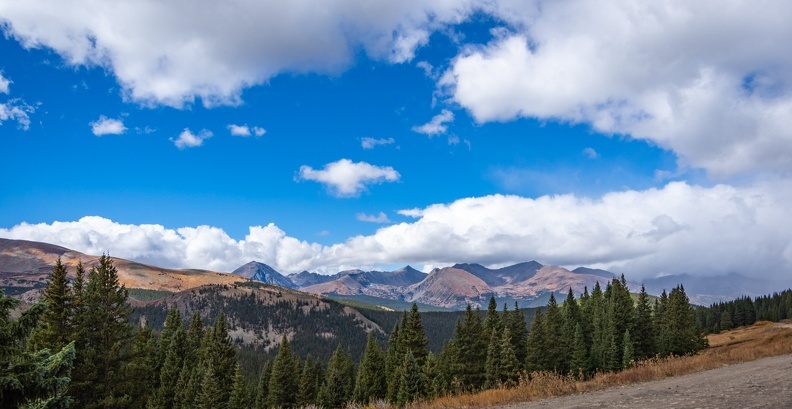 A sign at Echo Lake, the start of Mount Evans Road proclaimed the road as the “Highest Auto Road in North America,” topping out at 14,264 feet – probably the easiest way to summit a fourteener. Unfortunately for us, an early snowfall had closed the road for the season, otherwise Evans is a usual stop for the MRP. 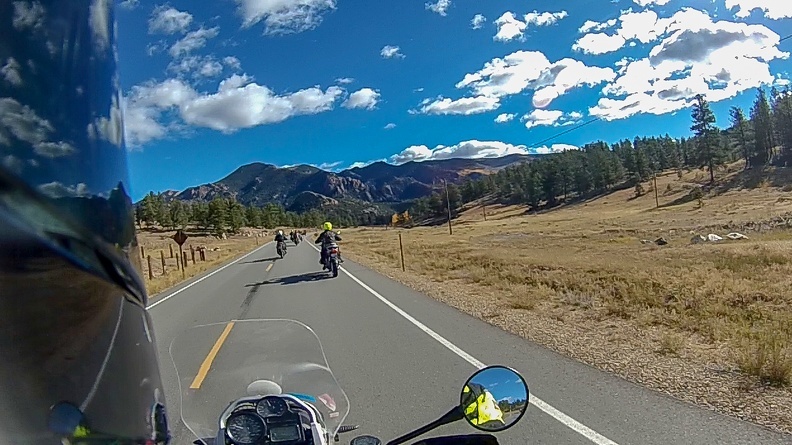 From Echo Lake, the faster riders were given free reign to continue on and “play” on Highway 103 as it went through Squaw Pass and down into Bergen Park. I remained back to ride my own ride. The strange thing though was that even though I thought I was going really slow through some of the twists and turns of these mountain roads, when I looked down at the speedometer I was actually going faster than I though. I’m not sure if that was a product of the GS, or just me getting more comfortable on it. 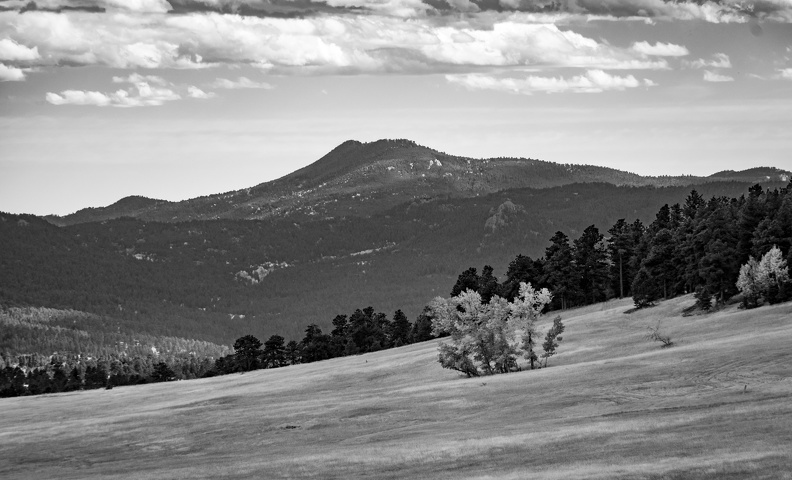 As we descended down from Squaw Pass, depending on the curve of the road, panoramic glimpses of the Denver area and the western Great Plains were visible. I guess this was pretty close to being on top of the world. 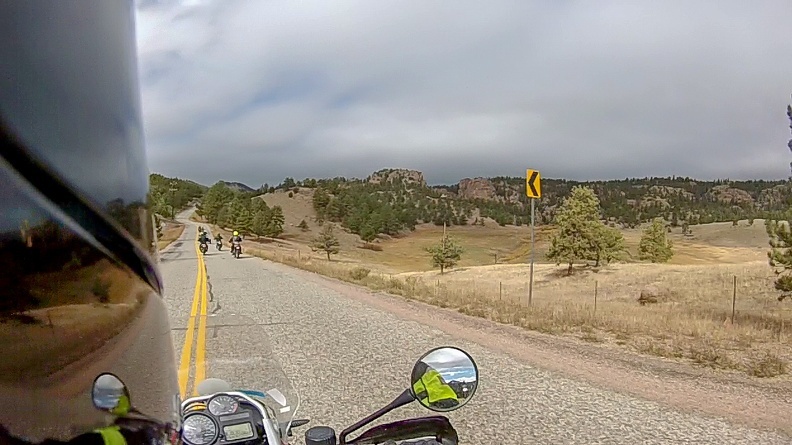 We met up with the group just south of Bergen Park and turned south on Colorado Highway 74. 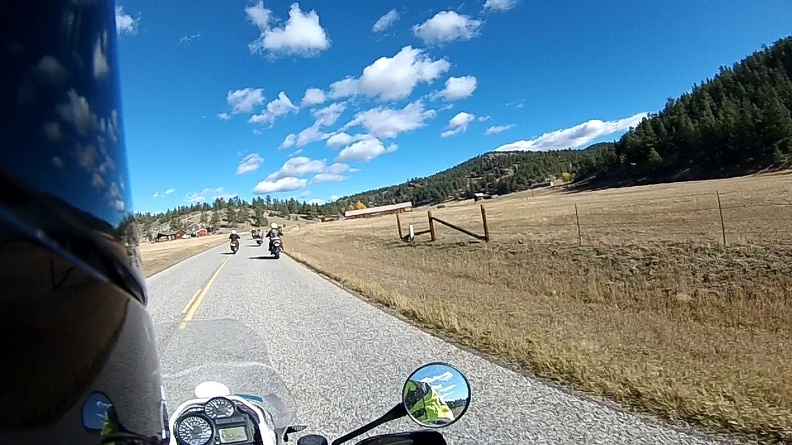 As we rolled into Evergreen, we started to pick up afternoon commute traffic. 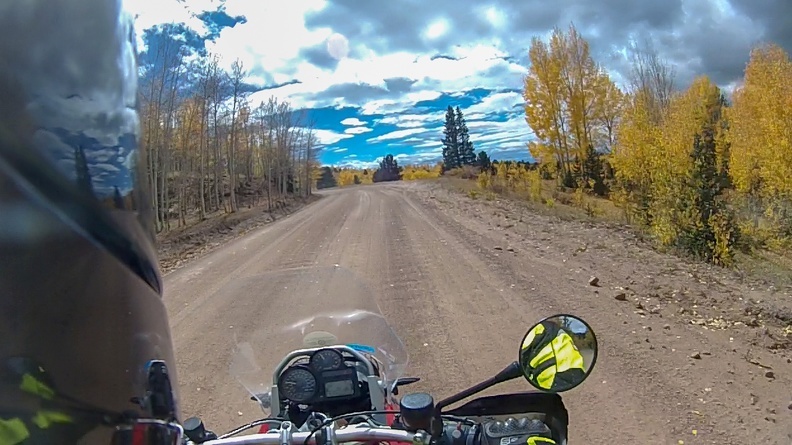 Just south of Evergreen, we turned onto Turkey Creek Road for the final crossing of the Rampart Range before arriving at Littleton. Turkey Creek Road followed a narrow canyon with many tight curves and trees lining the road’s edge. 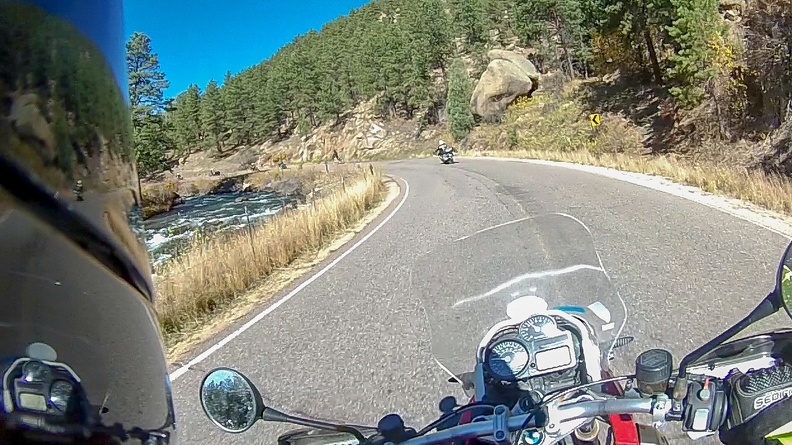 We hopped onto US Highway 285 for the final stretch through the Turkey Creek Canyon. As I got on the highway, a strong gust of wind hit me and blew me into the breakdown lane just as it was ending. I narrowly avoided hitting the guard rail. 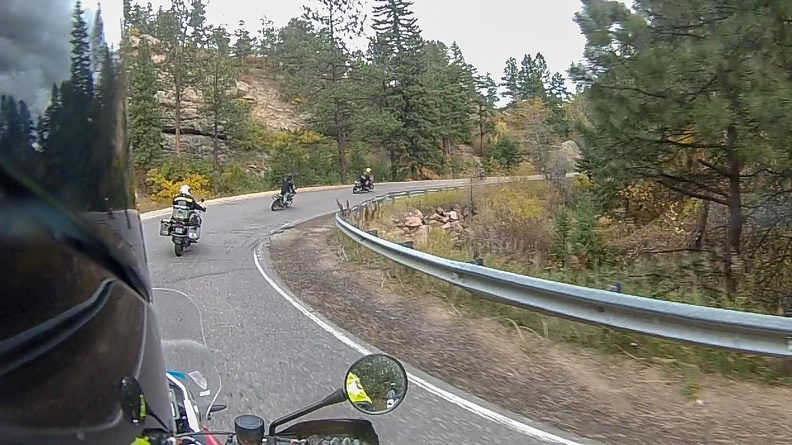 We emerged from the canyon near Morrison and made the final turn to MRP headquarters in Littleton. 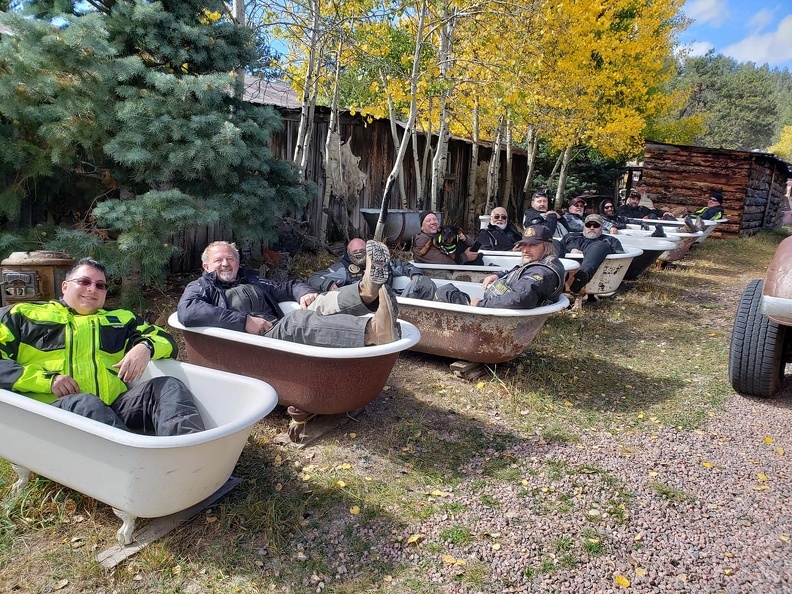 We parked our bikes and partook in celebratory adult beverages as we unpacked the gear and put the bikes away to await the next group of veterans. The evening was capped off with a dinner with the group, MRP staff, and supporters. The evening was spent sharing our memories of the trip and joking around like old friends. The MRP has a good thing going. 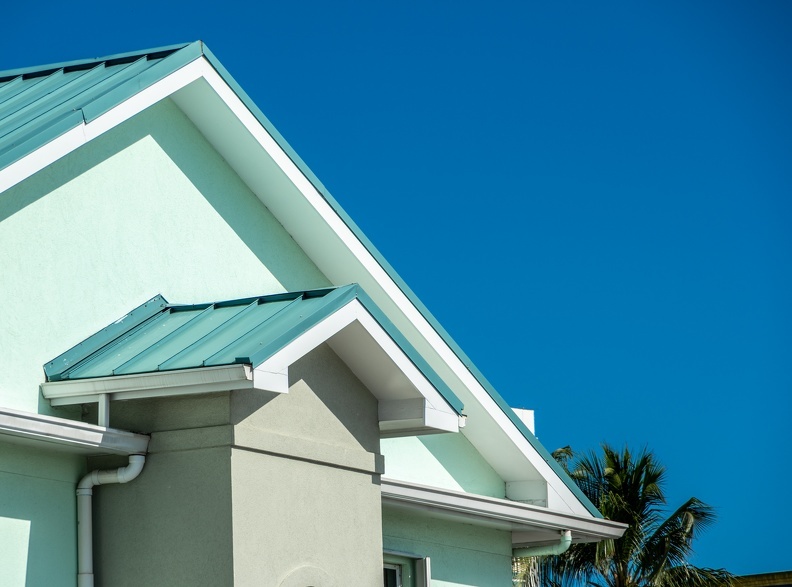 They don’t purport to be therapy, and they aren’t trying to cure anyone, but they do give their participants tools to use to continue the healing process. It’s only one step, but I watched some of the guys go from quiet, stoic, and withdrawn to actively joking around and socializing with other members. 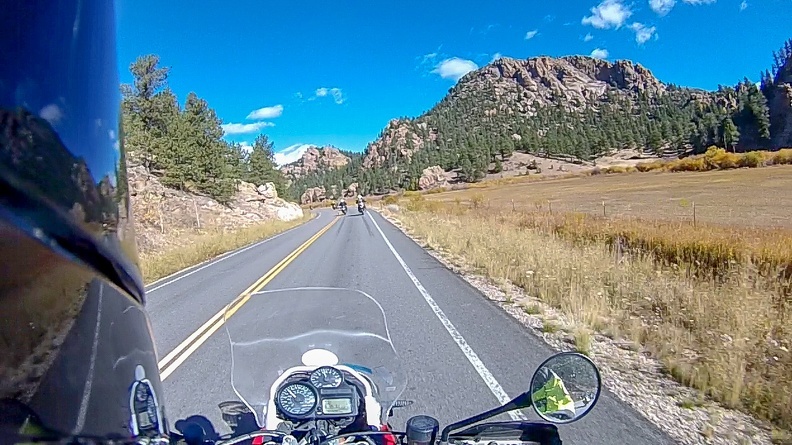 Guys who had little success with inpatient PTSD treatment programs said they got more out of a week riding around Colorado and participating in the MRP workshops than they ever did on the inpatient programs. If you know a veteran or first responder who might benefit from the MRP, tell them to check it out. We woke to wet weather, but a forecast stating things should clear up later in the morning. Additionally, temperatures were in the low-40s and had been near freezing over night. The staff decided to hold off on leaving for the day until the weather improved a bit. We gathered around the dining table for a 12-man game of Cards Against Humanity. For anyone who’s ever played, you know how the game is with a few people. When you get more than 10 playing, the hilarious responses get even better! At about 10 am. the weather had improved enough to get on the road. We headed south from Florissant toward the town of Guffey. 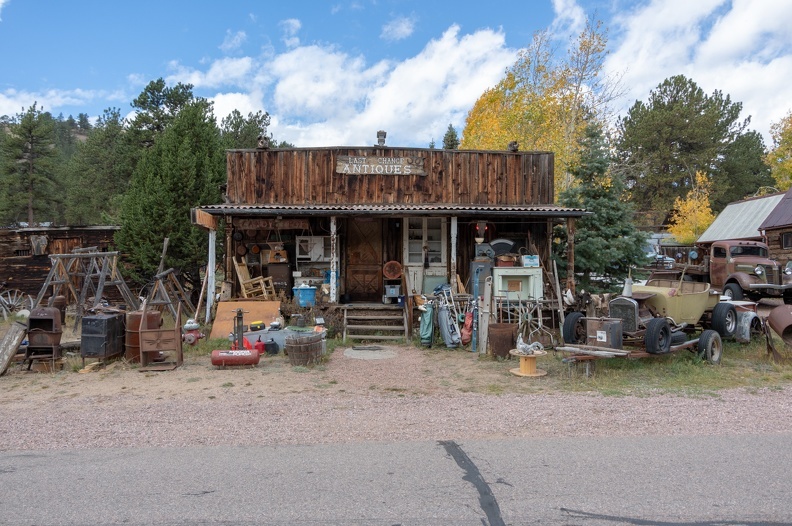 Guffey is an eclectic little town that is somewhat known for having elected animals to the office of mayor, despite such an office not actually existing. According to Wikipedia, the current mayor is a cat named Monster who was elected in 1998. Presumably, since cats don’t typically live 20 years, the office is actually vacant. 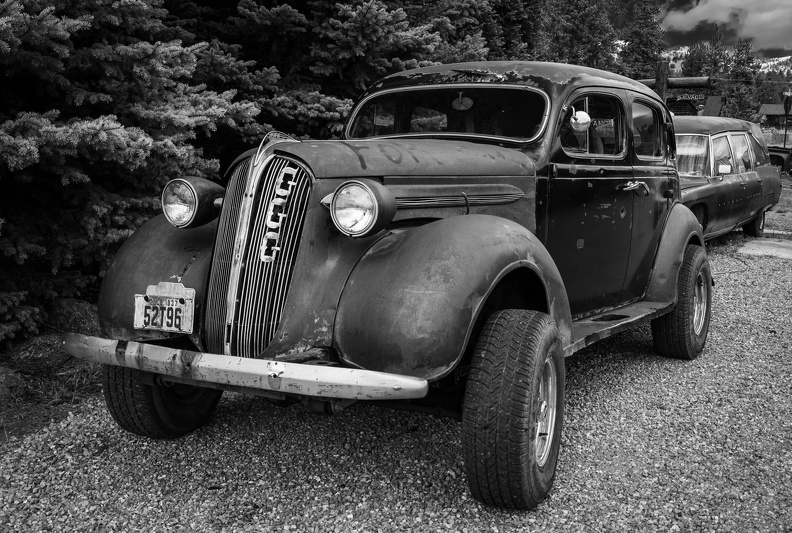 We stopped in front of the Guffey Garage, home of the private “stuff” collection of a man named Bill. Bill wasn’t around, but one of his business partners let us inside to walk around. Across the street from the garage was an antique store, also owned by Bill. 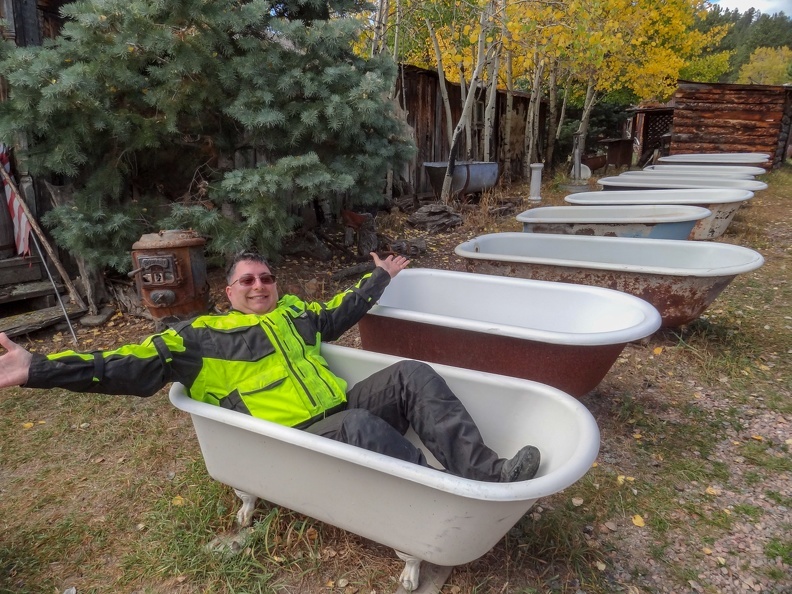 Outside the store were a bunch of iron bathtubs lined up along the east side. Our group took the opportunity for a photo. 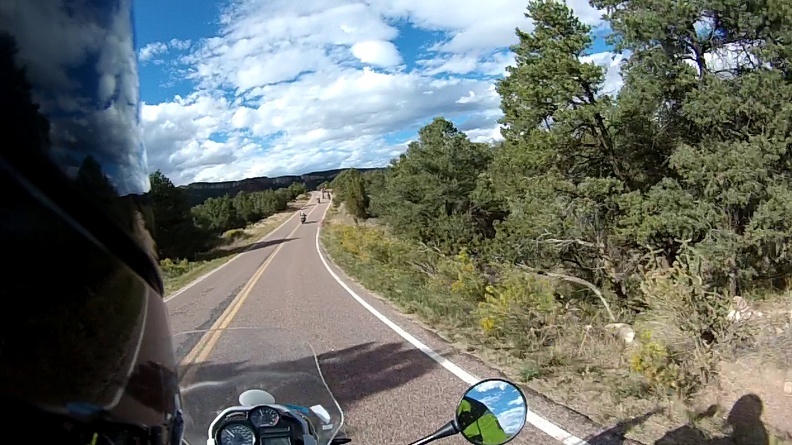 We headed out of Guffey on Colorado Highway 9 toward Cañon City. 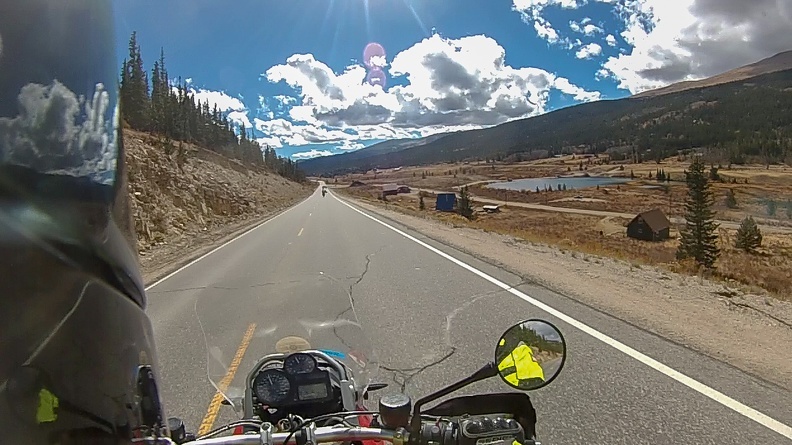 While riding Highway 9 I discovered I was in a bit of a mental funk. For some reason, riding felt difficult and concentrating was a bit of a chore. At one point, I pulled over to let the rest of the group go by so I could go at my own pace at the back of the pack. We stopped at the Royal Gorge for lunch. We passed on the tourist-trap bridge area and went to a Forest Service overlook. It was just us at the overlook and the views of the gorge’s red rocks with the Arkansas River winding its way through were spectacular. A couple brave members of our group ate their lunch perched on the very edge of the gorge. Not me though. After lunch we headed for Cañon City. 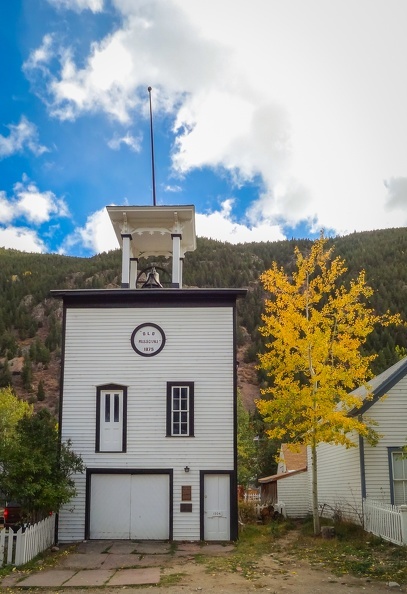 Cañon City was founded in the 1860s as a commercial center for the mining industry around the South Park area of Colorado. Today, it is a popular tourist destination for sightseeing and outdoor activities. 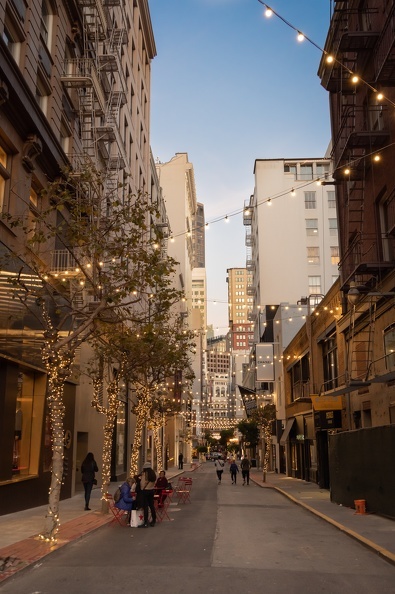 The city is also one of the few cities in the US with a Ñ in its name. We turned off US Highway 50 onto a narrow one-way road called Skyline Drive. Skyline Drive climbs up the top of a razorback ridge that rises a couple hundred feet above the city. The road was built by prison inmates in the early 1900s. Prisoners got 10 days off their sentence for every month they worked building the road. In 2001, dinosaur footprints were discovered along the road. There is a turnoff at the top with a sign and trail to the prints. In many places along Skyline Drive, the ridge was not much wider than the road, with steep drop-offs on either side. 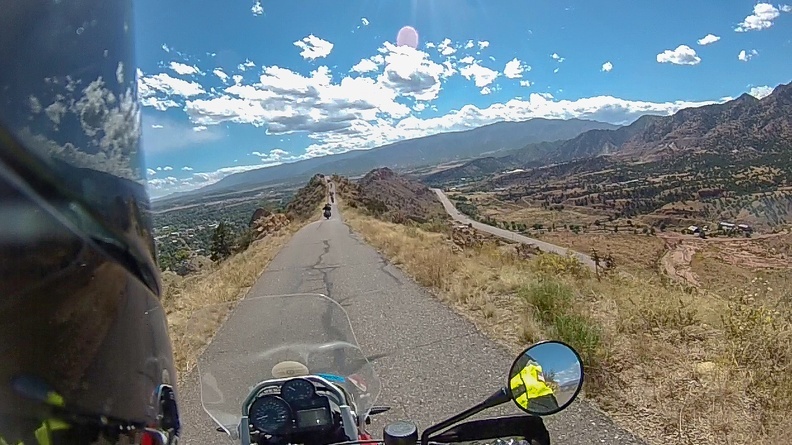 I’m not a huge fan of heights, so I kept my eyes on the rider in front of me and let me video camera take in the views. After descending off Skyline Drive, we turned west on Highway 50 and entered Bighorn Sheep Canyon. 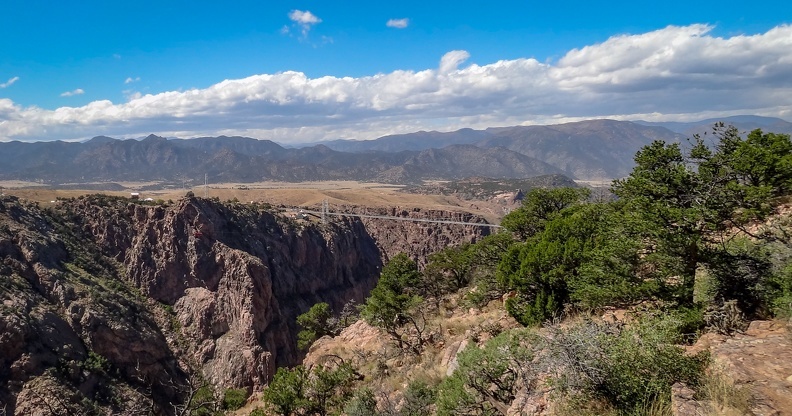 The canyon follows the Arkansas River along its course upstream from Royal Gorge. 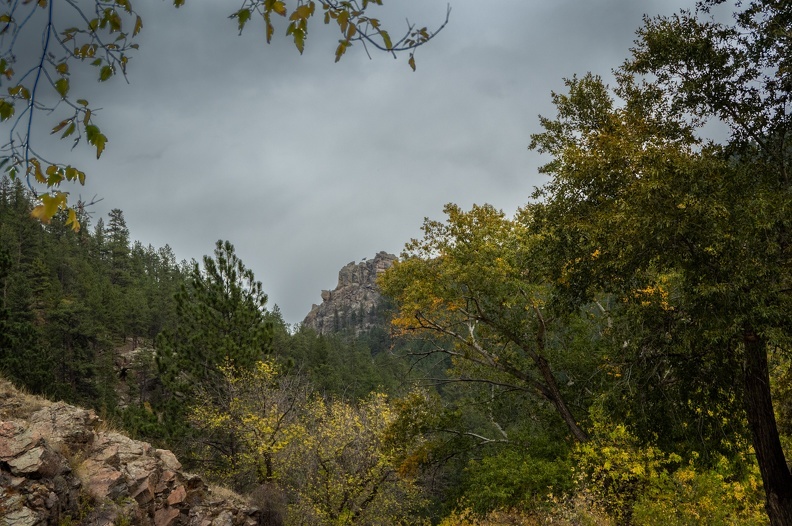 A few miles into the canyon, after seeing dark clouds looming ahead, my funk got a worse because of the weather. Winds picked up and swirled down from the ridge at the top of the canyon down to the road. It started raining heavily, and the rain was cold and stinging – almost like it was hailing. The winds were blowing me around, making it difficult to feel in control. Eventually, it got to be too much and I had to pull over for a bit. The driver of the support truck stopped to make sure I was OK. I told him I just needed a minute to calm my nerves. I actually considered throwing in the towel and giving up on the ride for the day, but decided against it. Another rider then motioned to me to follow him. He rode ahead of me, showing me the way and I powered through. After about 20 minutes of riding in the rain, the skies cleared up and the sun came out. It was a welcome relief. The constantly changing weather is a strange thing. We stopped at a bend in the Arkansas River where one of the MRP staff had a mineral claim. 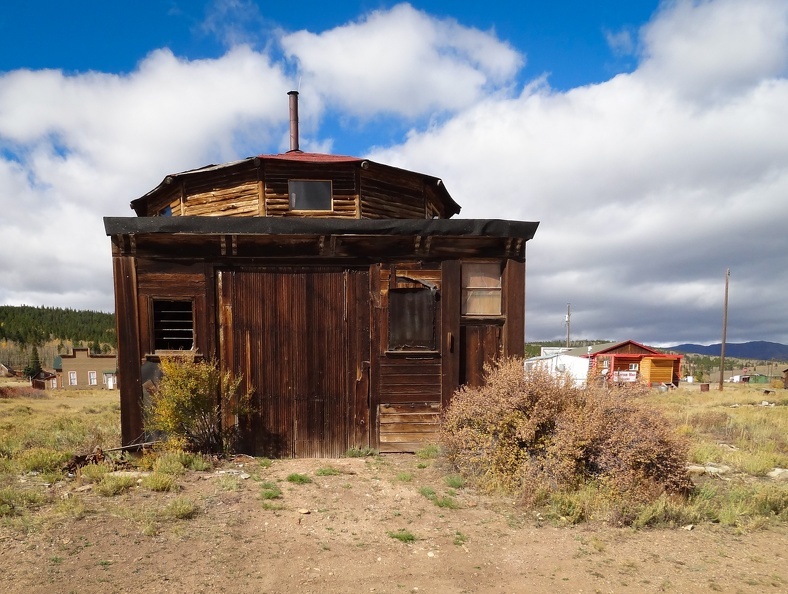 The area is all public lands, and the Bureau of Land Management allows people to make mineral claims for a fee. We were given a short lesson on gold prospecting, which was enjoyed by everyone in the group. 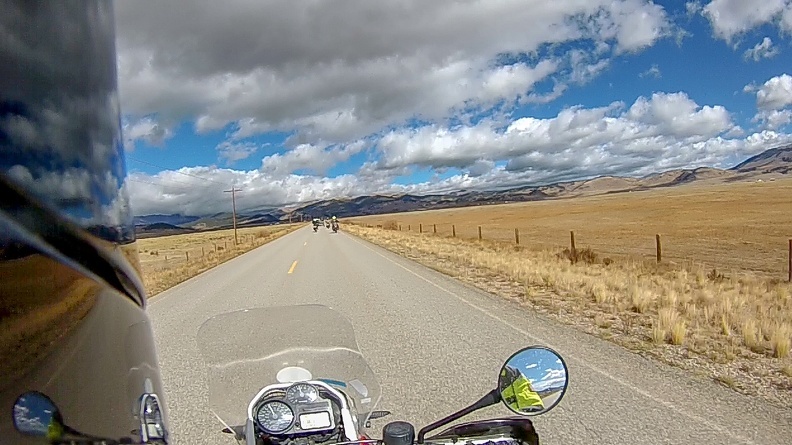 We headed north into Salida, where winds picked up again coming off the Rockies. 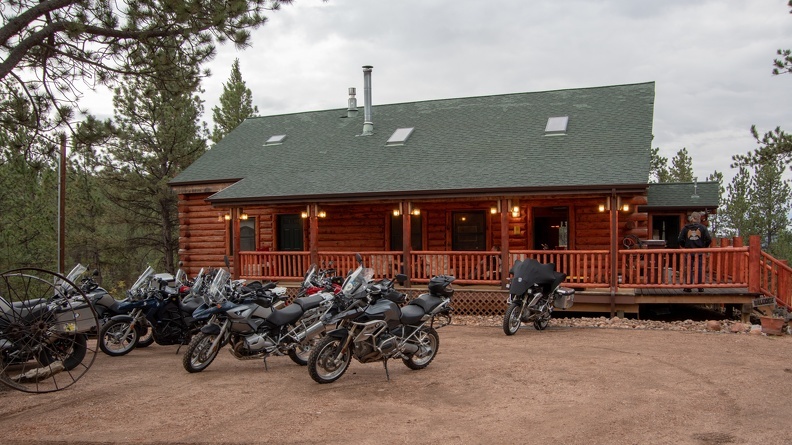 Everyone was having trouble riding their bikes straight, but we all made it back to the cabin in one piece. After this day, I was really tired and glad to get off the road. Over dinner, we talked about our highs and lows, and I found out I was not the only one who had been riding in a funk. It was nice to know everyone understood and I was not alone. We woke to sunny skies over Tihsreed. 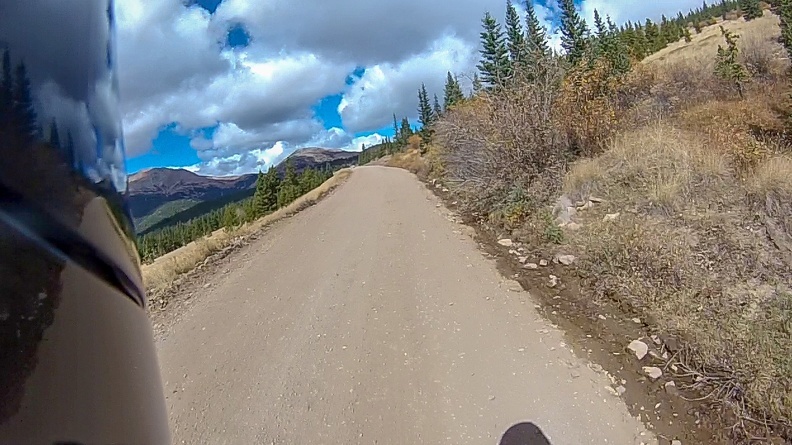 Our ride to Boreas Pass was originally scheduled for Day 4, but with bad weather in the forecast, the days were swapped as Boreas Pass would be safer and easier in the sun. We headed north out of Florissant and hopped onto Tarryall Road. Tarryall Road wound its way through several valleys and canyons. On the horizon I could see white fluffy clouds hanging out above gray and red mountains. 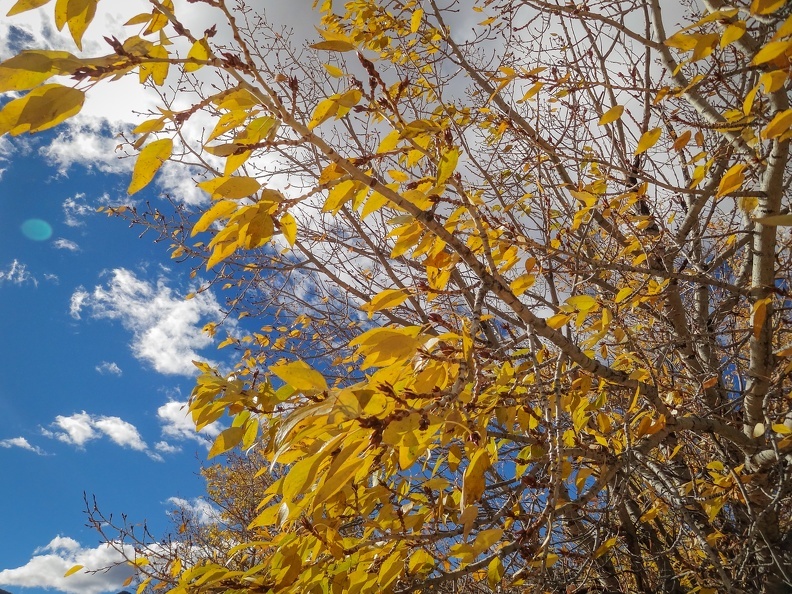 Several portions of the road were lined on both sides with aspen trees that have turned yellow for the fall, a breeze was blowing loose aspen leaves across the road. We took a break at Tarryall Reservoir where several people were fishing from the shores. We took a few group photos and downed some water, then returned to the road. We emerged from Tarryall Road near Jefferson. 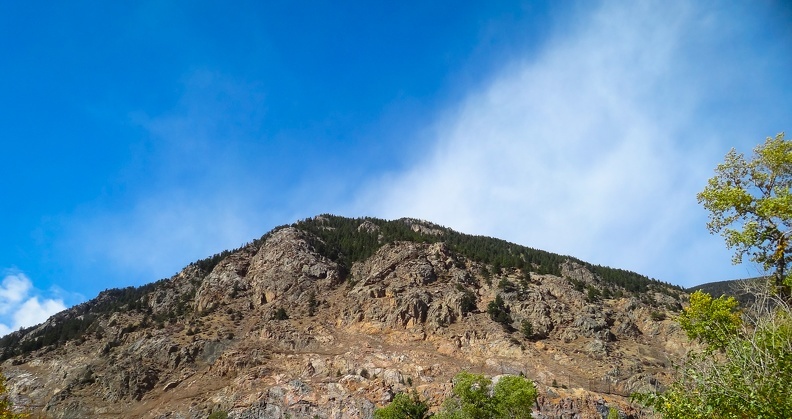 We had entered a large valley, where I could see the Front Range of the Rockies towering above. In the sky, the clouds were being quickly blown from my left to my right. We made a short stop in Como for another quick break and to set up our bikes for the dirt. Como is a former rail hub for mining trains running through the mountains. 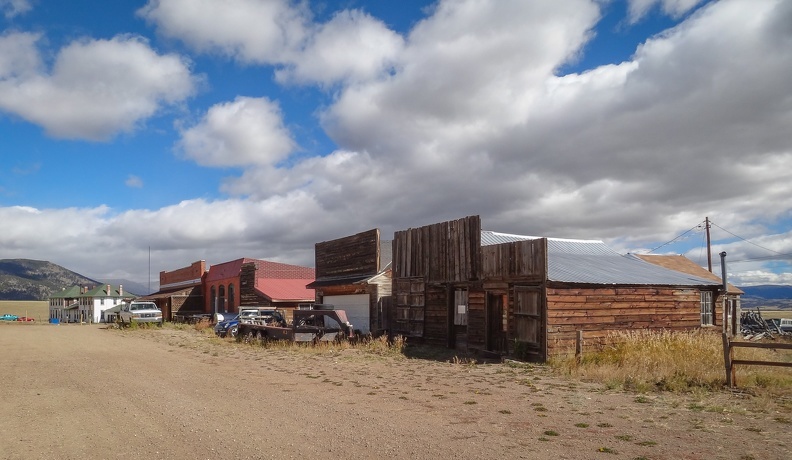 Though officially home to a little more than 400 people, it had the appearance of a ghost town. 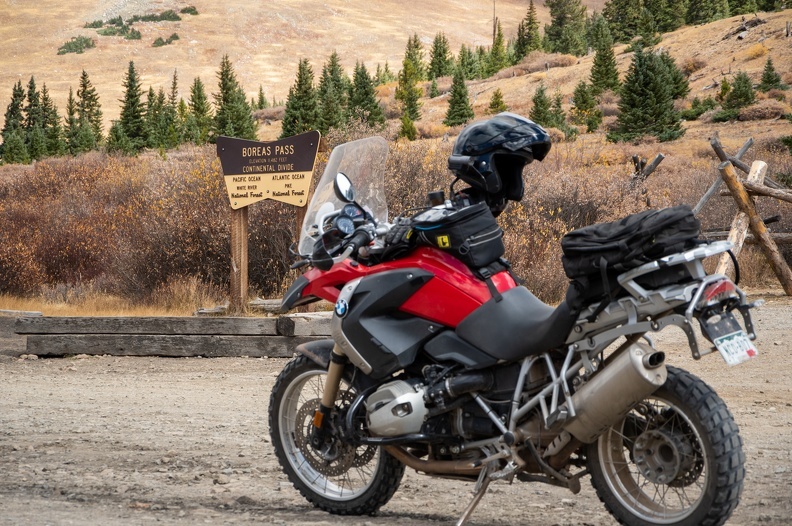 We headed into the mountains and stopped at the beginning of Boreas Pass Road. Knowing that I’m not the fastest guy in dirt, the driver of our support truck came up to me and gave me words of encouragement. One of the great things I noticed about the MRP crew is they are all very supportive. They would rather their riders enjoy their ride safely than to risk injury by riding outside their limits. 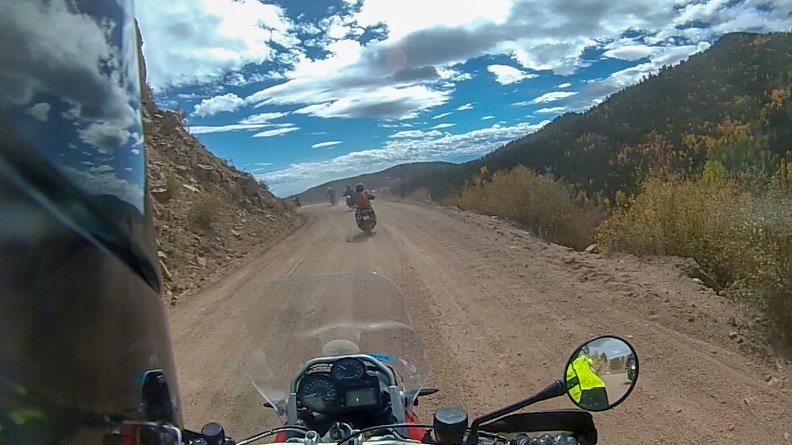 As we headed up the pass, the road was littered with rocks the size of baseballs. 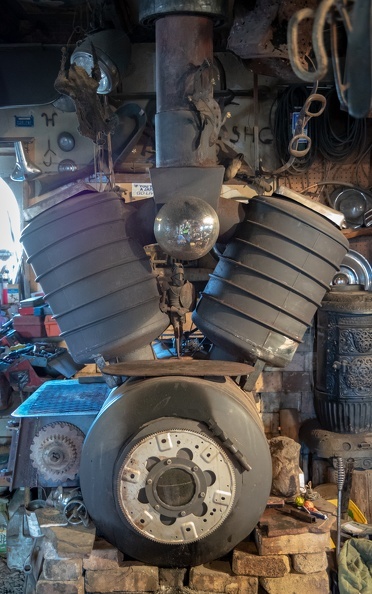 I could feel them sliding around under my wheels, but slow and steady wins the race. Heading up, every corner and clearing had spectacular views of the pass ahead or the valley below. 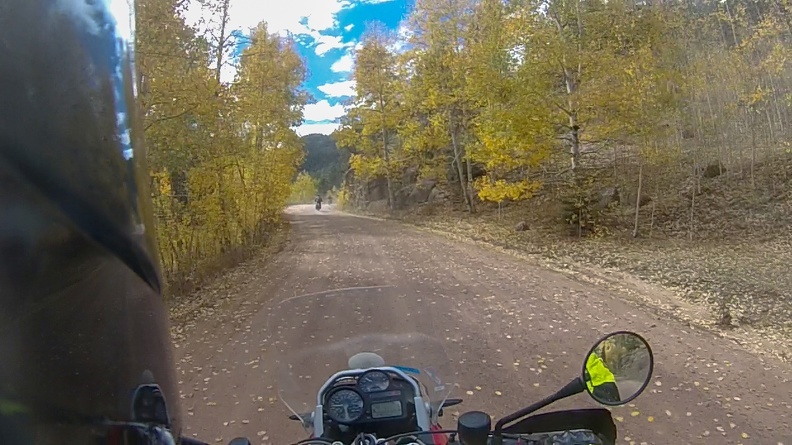 Soon the large loose rocks gave way to packed gravel, allowing us to go a little faster. At the crest of the pass (elevation 11,493 feet) we stopped for lunch. 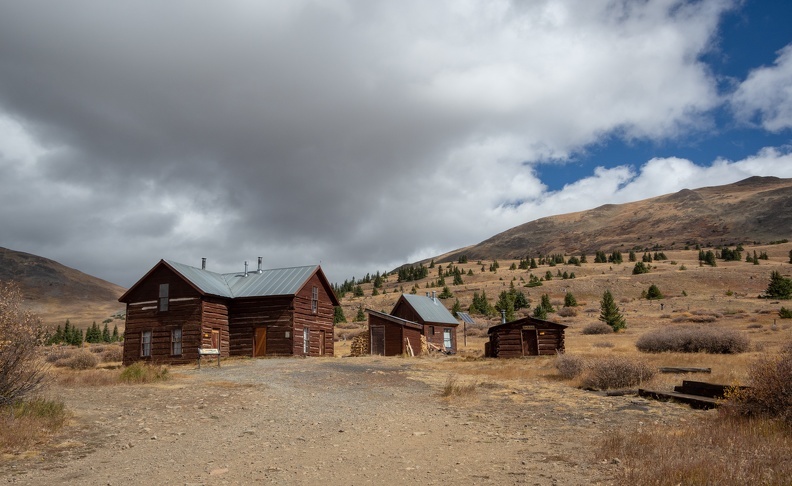 The pass’s summit is the former home of a railroad station. 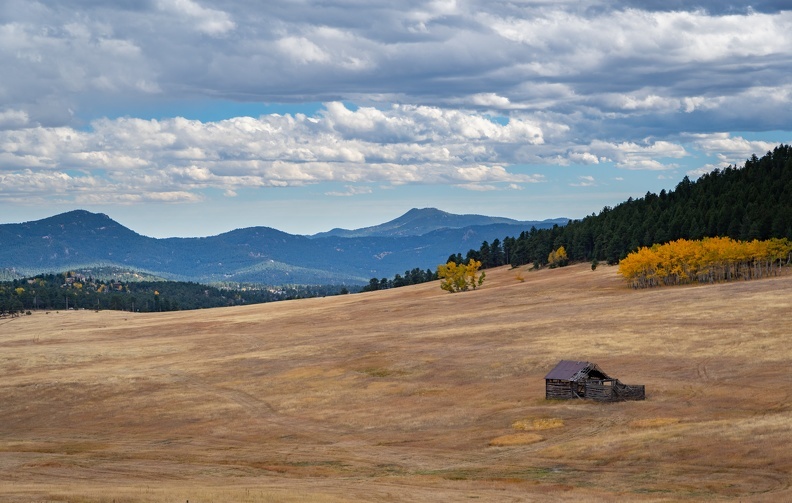 A box car sits at the top, straddling the Continental Divide, as a reminder of the pass’s history. We all climbed to the top of the box car for the penthouse view of the pass while we ate our lunch. A couple people passing through became intrigued about our group, and we were happy to tell them about it. They took a few pictures for us perched atop the boxcar and were given some stickers by the staff. Looming to the west were clouds that were starting to turn dark. Due to threatening rain, our lunch was cut a little short, though we were already done. 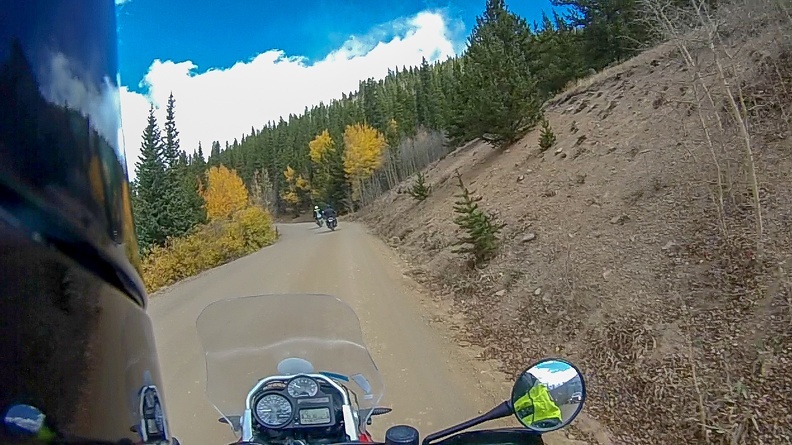 We continued down the pass toward Breckenridge. 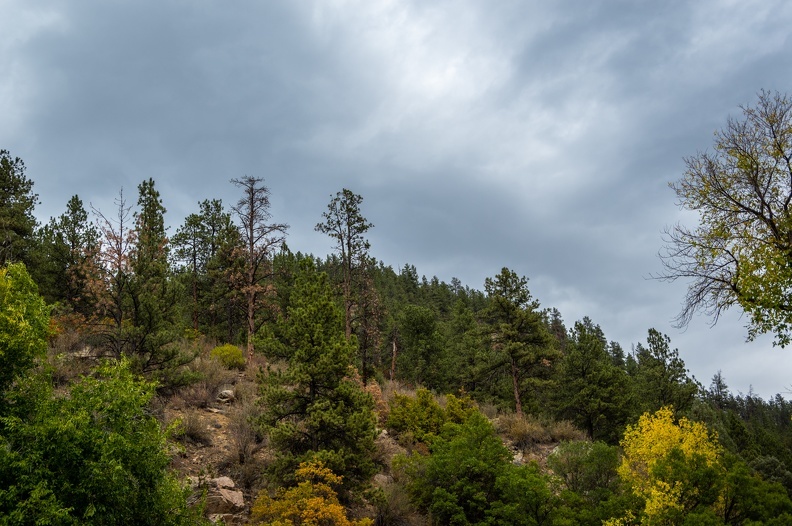 As we descended, I could see the clouds dumping rain on adjacent ridges, but avoiding us. 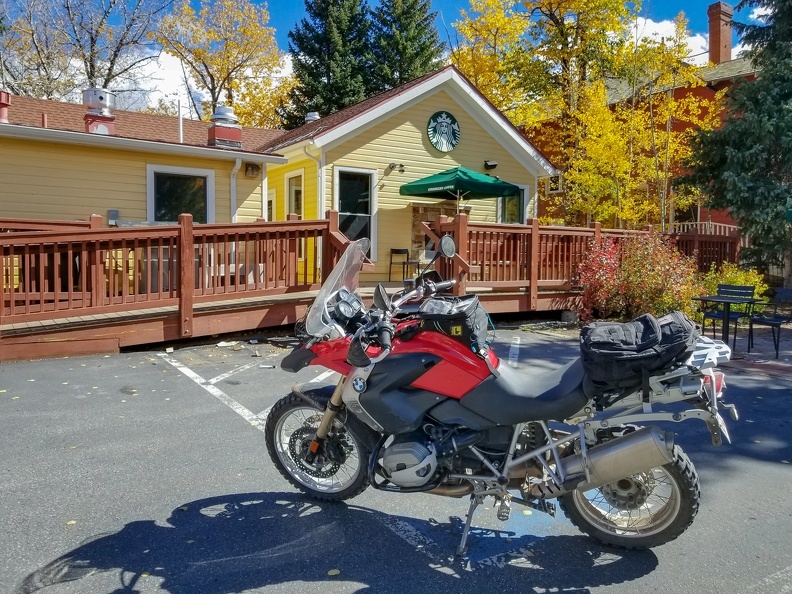 We stopped in Breckenridge and did what all proper GS riders do; we paid a visit to Starbucks. The descent had been a little chilly and a hot coffee was the prescription. While we were taking our break, I did my part to contribute to the local economy and bought a Colorado sticker from the shop next door to Starbucks. 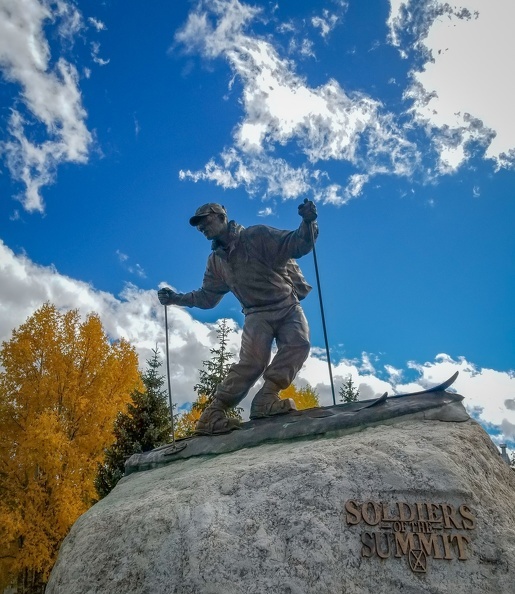 I also took the opportunity to wander around the block, finding a memorial to the US Army’s 10th Mountain Division “Soldiers of the Summit.” The 10th Mountain Division, which specializes in fighting in mountains, snow, and other rough terrain essentially got its start in the Rocky Mountains around Breckenridge. Shortly after the division was formed, they came to the Rockies to train. After World War II, many soldiers who served in the division returned to Colorado and started ski resorts and other businesses in the ski industry. 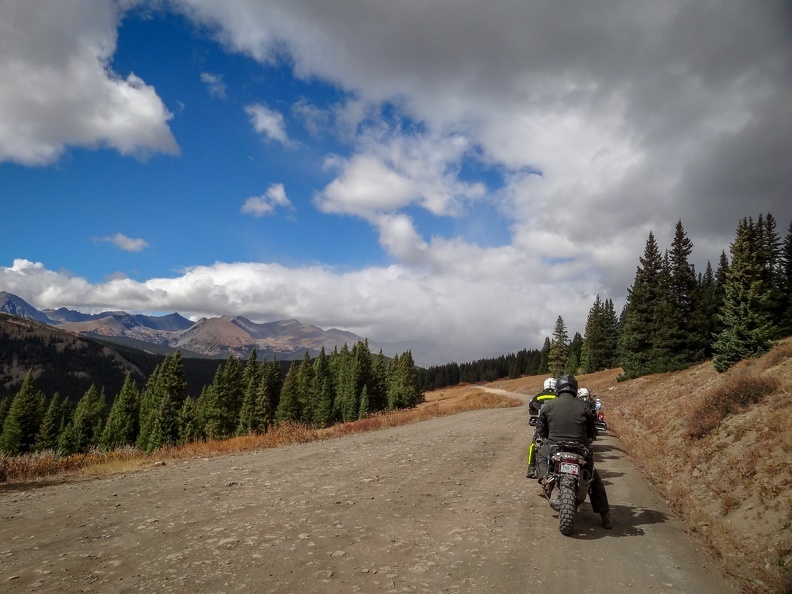 We headed south out of Breckenridge and climbed Hoosier Pass, where we crossed the Continental Divide for the second time. 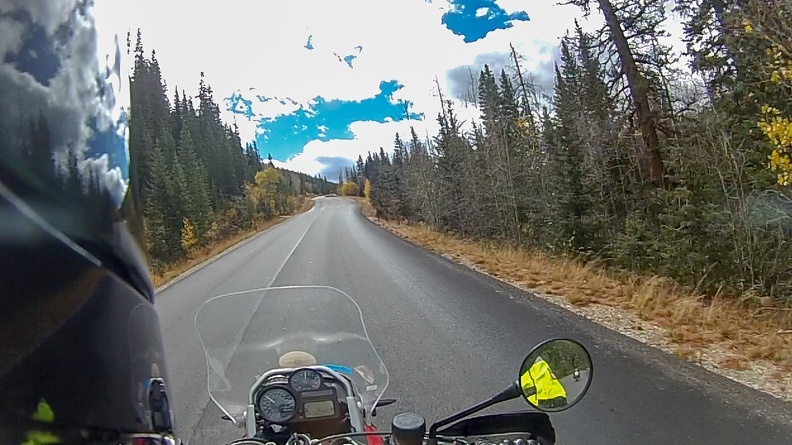 Though Hoosier Pass is higher than Boreas Pass by about 50 feet, the ride was easier because the pass sits on a state highway. 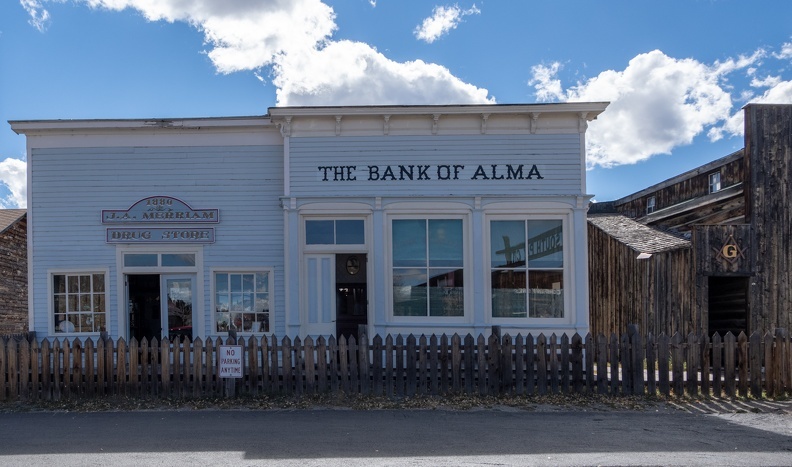 We dropped out of Hoosier Pass and passed through Alma, which has the distinction of being the highest incorporated town in the US (10,578 feet), then stopped in Fairplay. 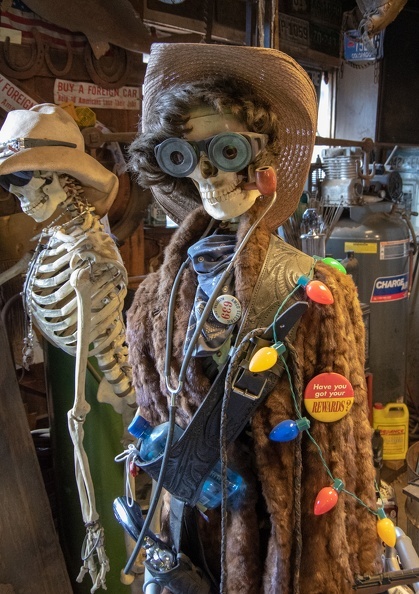 Fairplay is home to South Park City, a reconstructed mining town and now tourist trap. 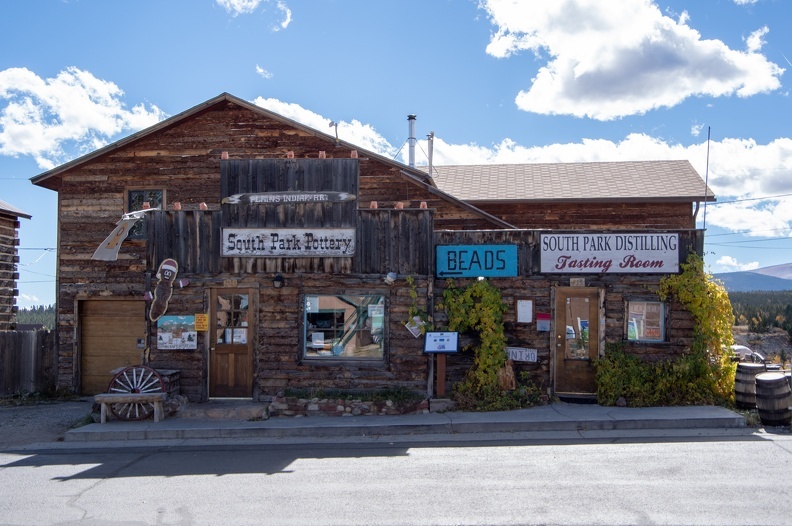 South Park City has many buildings from the 1800s lining its street. The city was actually the namesake for the TV show, and many of the local businesses play to this fact. One such business had Mr. Hankey perched on its front wall. After leaving Fairplay, we arrived back at Tihsreed just ahead of the incoming rain. That night, along with the rain, we were treated to nature’s light show as a thunderstorm passed over the cabin. We woke up to cloudy skies with rain threatening to dampen our day. That was not going to stop us! When asked what happens when it rains, the response is: We get wet. We had a hearty breakfast of eggs and a concoction called “bacon explosion.” Bacon Explosion is truly a dream of those who like to eat pigs. You take strips of bacon, then pack ground breakfast sausage around them. 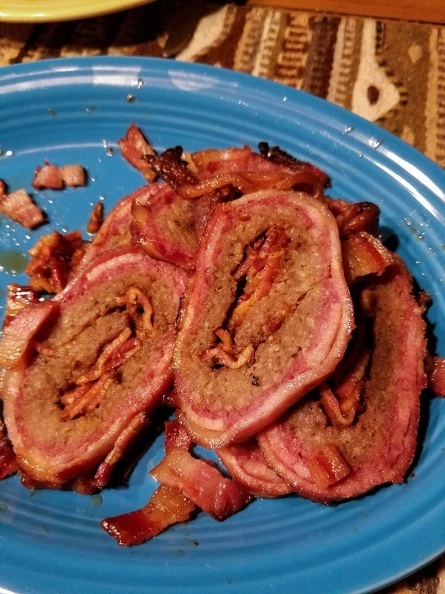 A lattice of bacon is then formed around the sausage. 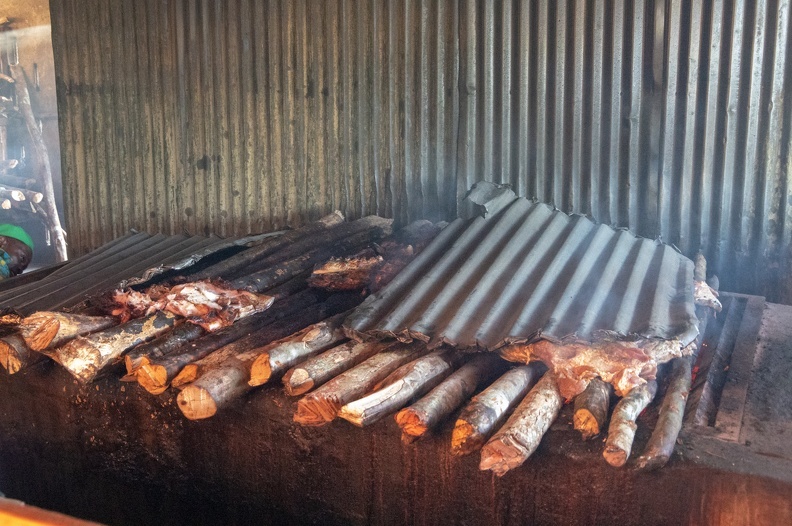 The porcine meat log is then tossed in a smoker for several hours. The result is an artery-hardening mass of deliciousness that is a perfect side to the typical eggs and toast. A serving was given with a warning that eating too much might result in a different type of bacon “explosion” later. We did our daily checks and packed up for the day. 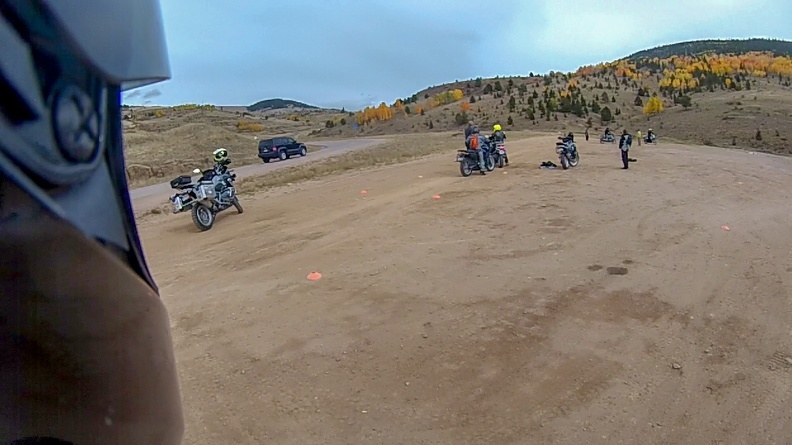 The plan was to head south to Cripple Creek where we would get training from Lance on how to ride our GSs in the dirt. 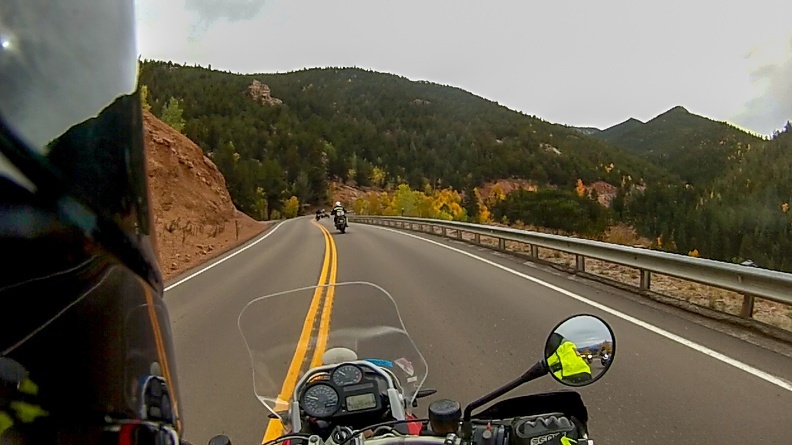 We headed east on US Highway 24 then turned south at Divide on Colorado Highway 67. 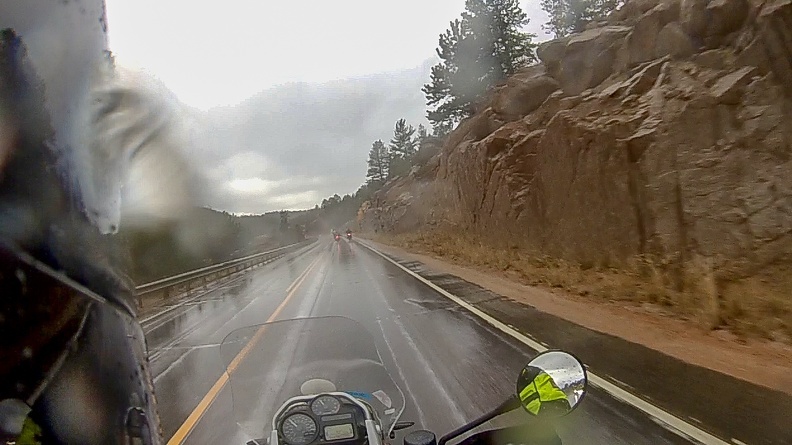 We were greeted by a light rain as we headed into the Rampart Range. 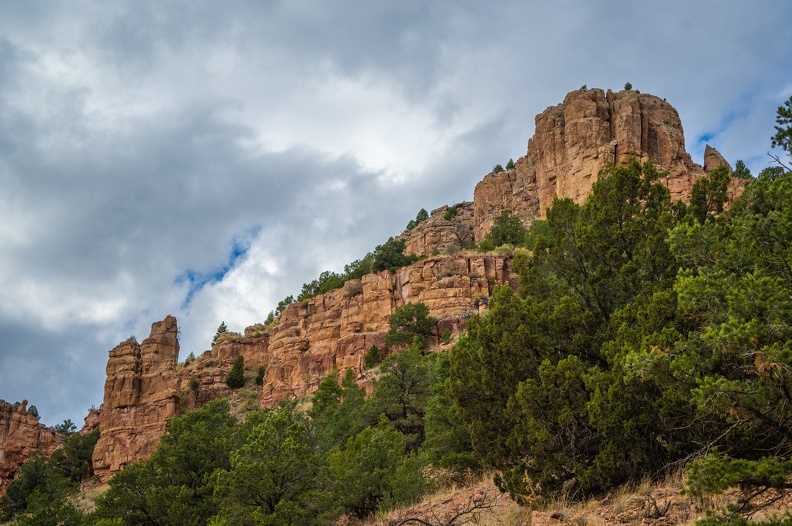 Highway 67 wound its way above a large canyon carved by several creeks. 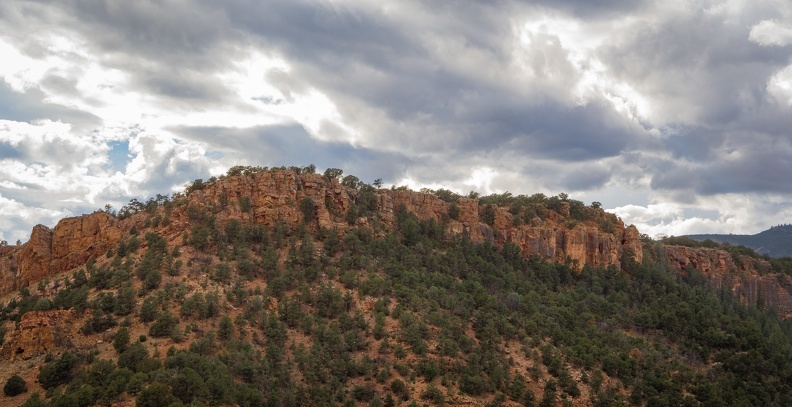 Views of the canyon were breathtaking – seas of dark green evergreens with small patches of yellow throughout. 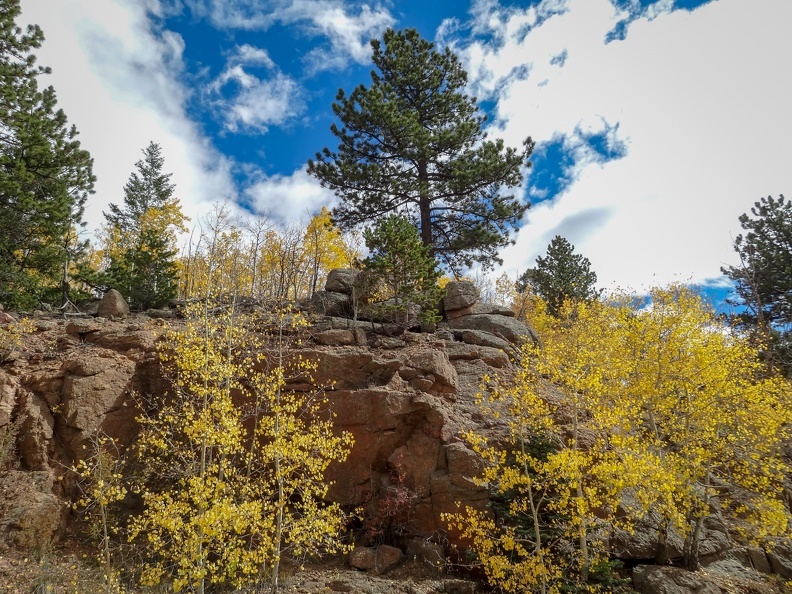 We climbed up above 10,000 feet for the first time as we crossed Tenderfoot Pass (elevation 10,200 ft) just east of Cripple Creek. 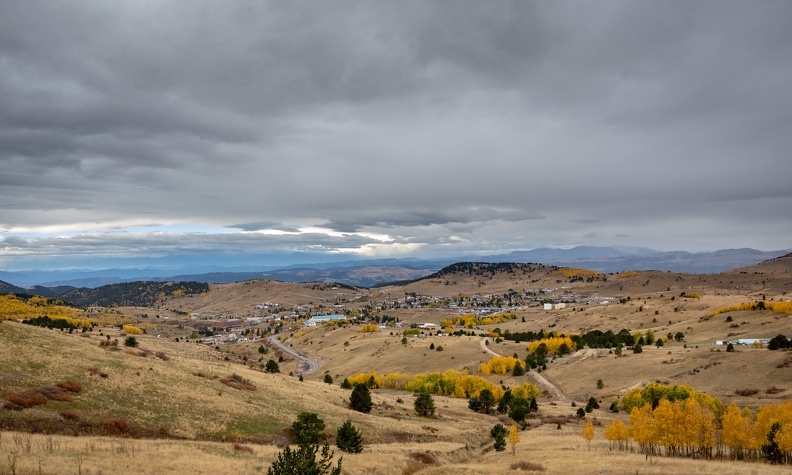 We stopped at an overlook above Cripple Creek and were give a brief history of the town and its origins as a mining town. Tailings from old mines were strewn about the hills below the overlook. 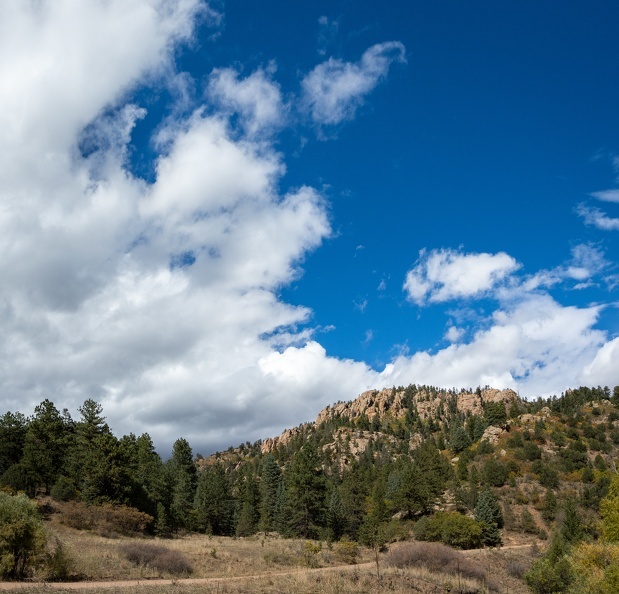 Even today, mines around Cripple Creek are producing millions of ounces of gold each year, and many mines offer tours. Despite the high gold production, the town has become a tourist destination due to legalized gambling. We stopped at a dirt parking lot in Victor for our off-road training. Almost as soon as we stopped, the rain stopped and skies began to clear. Lance would be our teacher for the day. Lance runs a business with his brother training people how to ride their large adventure bikes in the dirt. Lance set up a cone course in the lot and we went to work. Though we were only covering the basics, Lance was a really good teacher, and I was surprised at what I could do with the 1200GS. A few people dropped their bikes, but it was not a big deal. 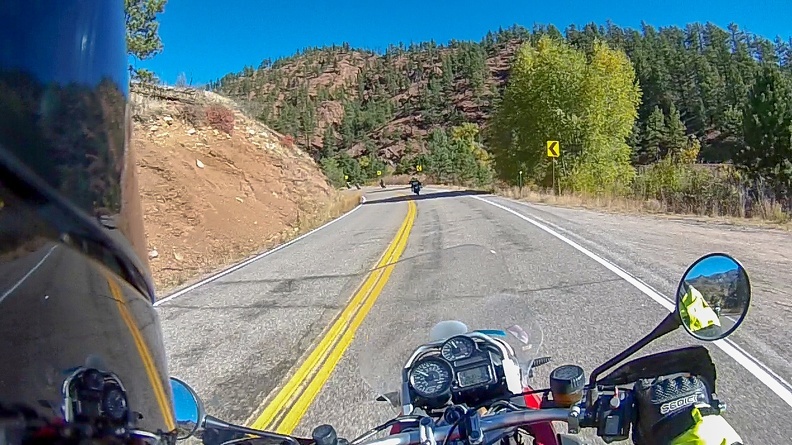 When riding with the MRP, we don’t get angry or sad at dropping the bikes, we celebrate it. Each time a bike touched the ground, we would celebrate it by honking our horns in unison. I managed to keep my bike up. 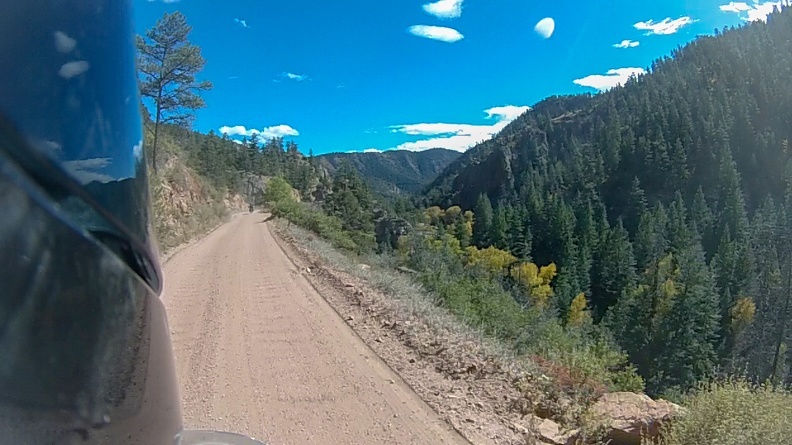 After a couple hours of practice, we headed for our first long dirt ride: Phantom Canyon. 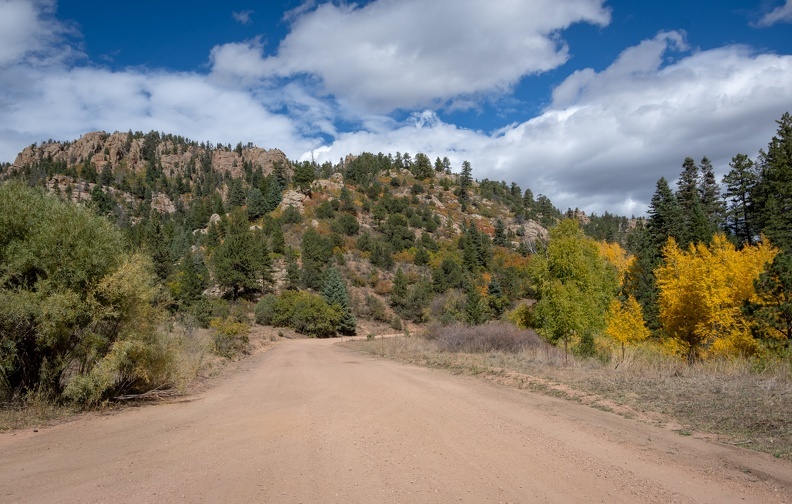 Phantom Canyon Road descends from Victor, and is built on the former right-of-way of the Florence and Cripple Creek Railroad. 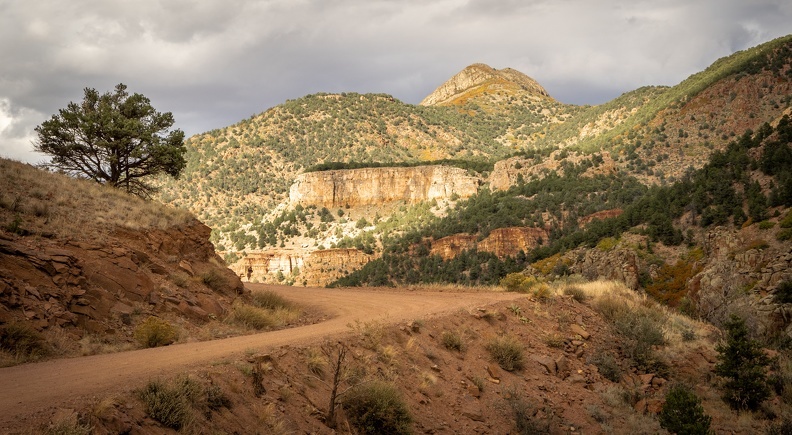 The road runs about 28 miles through the canyon, emerging northwest of Cañon City. We were blessed with twists, turns, switchbacks, wooden bridges, and tunnels. 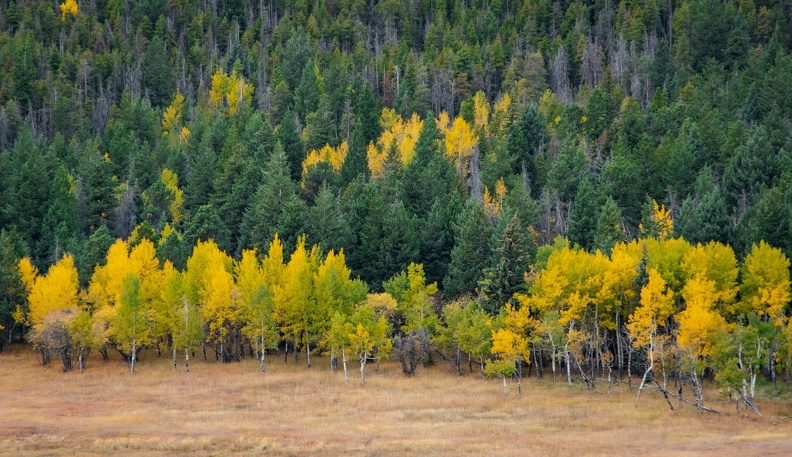 The ubiquitous aspen trees lined the side of the road. Leaving Victor, the road was smooth hard-packed gravel, as the road descended into the canyon the road turned to looser rock and gravel. Still, the GS handled it with ease. We stopped at the bottom of the canyon next to Eightmile Creek. The spot had great views of the creek and towering rocks above. As we were preparing to roll out, I felt my bike lurch forward, then it started to fall over. I didn’t know what was happening, as I was just standing there waiting. I looked over my shoulder and saw that another rider had somehow run into my bike, causing a domino effect. 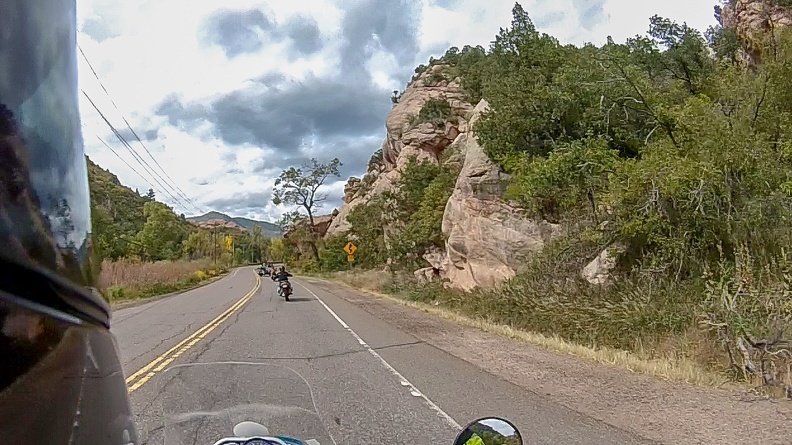 We continued out of the canyon and stopped at Cañon City for a break. As we sat there in the parking lot of a Walmart, one of the volunteers showed up with a gift of Snickers ice cream bars! It was hot and the cold ice cream was a welcome snack. 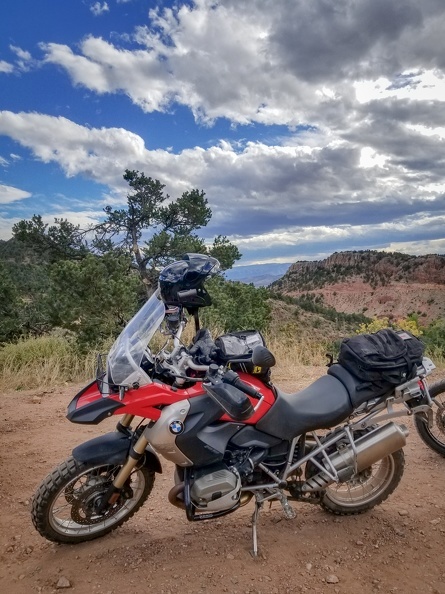 We saddled back up and headed north from Cañon City for Shelf Road. We had to contend with a few detours due to construction, but soon found us headed out Red Canyon Road and the hills. 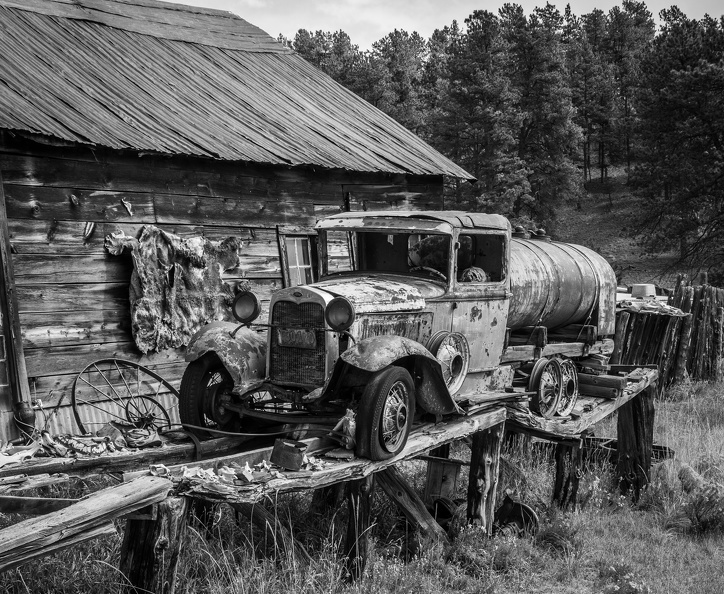 Shelf Road is a former stagecoach route between Cripple Creek and Cañon City. It’s so named because the road is carved into sheer cliff faces like a shelf. Shelf Road was also a lesson in contrasts. 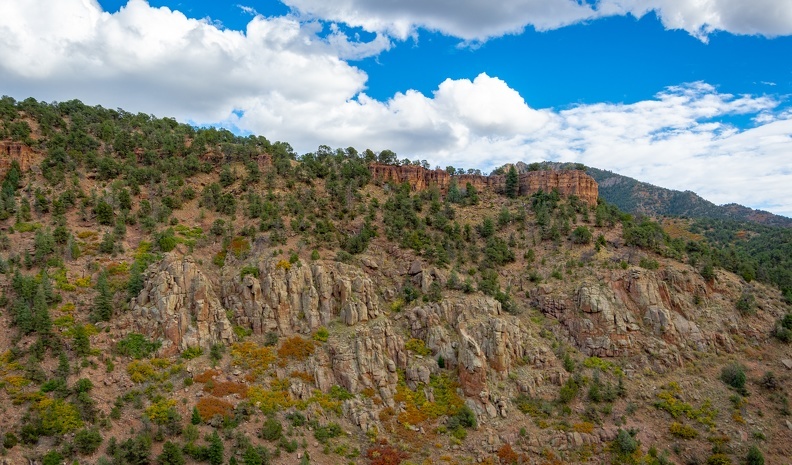 Whereas Phantom Canyon was covered in greens and yellows, the area around Shelf Road contains a lot of red rock. Strangely, the two canyons are separated by only about six miles. As we climbed up Shelf Road, much of it was loose gravel, only one lane and perched on the edge of steep drops with no guard rail. A few times we would come around blind corners to find trucks approaching in the opposite direction. 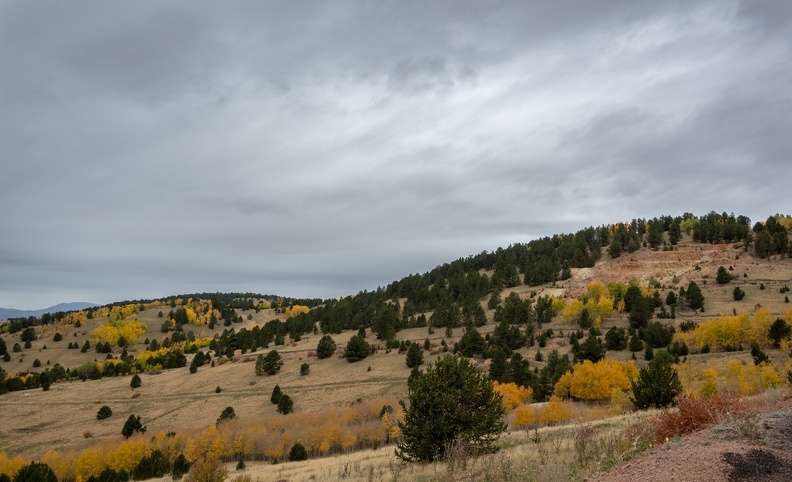 After about 15 miles, we emerged at Cripple Creek where the weather was cold and threatening rain. If you don’t like the weather, wait a few minutes. It’s the Colorado way. I found all the dirt riding to be tiring. 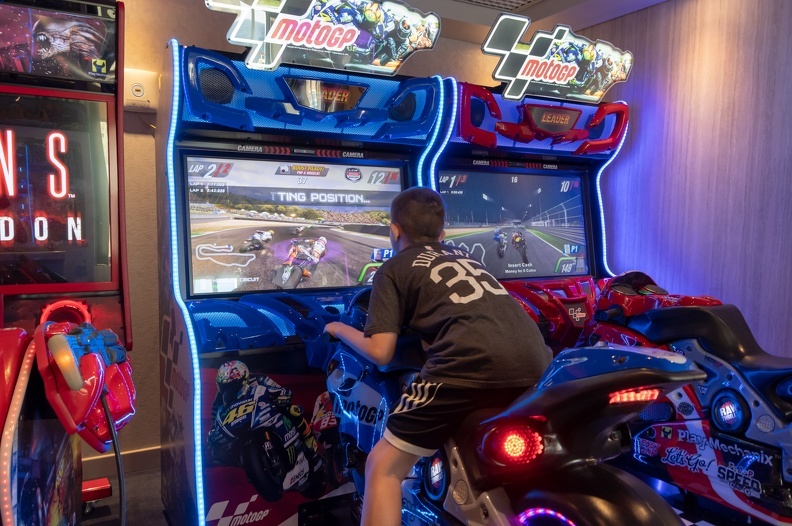 Standing up and sitting down on the bike was like doing hours and hours of squats … Actually, it wasn’t just like it, it WAS hours and hours of squats! I arrived back at Tihsreed to find that my rear tire had lost 10 pounds of air pressure. I filled it up to see if it was leaking or just temperature and elevation changes. The topic at the dinner table centered around our dirt exploits. 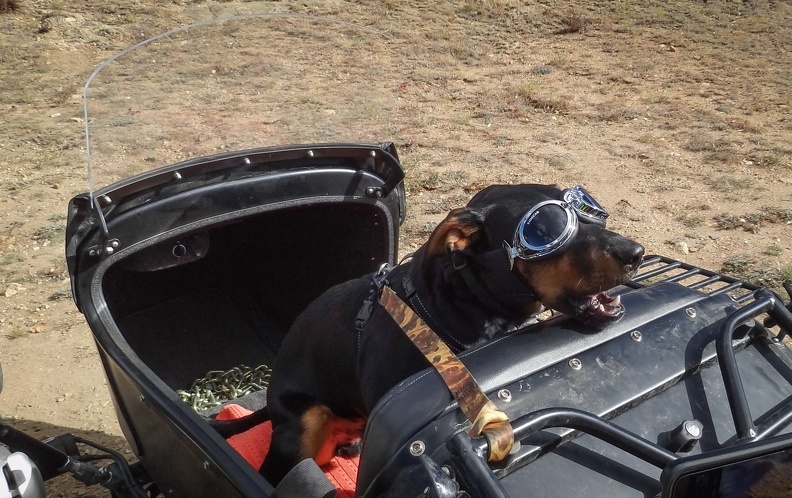 Everyone enjoyed dirt riding a lot, even the guys who normally ride Harleys. One even whispered, “Does anyone know someone selling a GS?” Laughter filled the room. 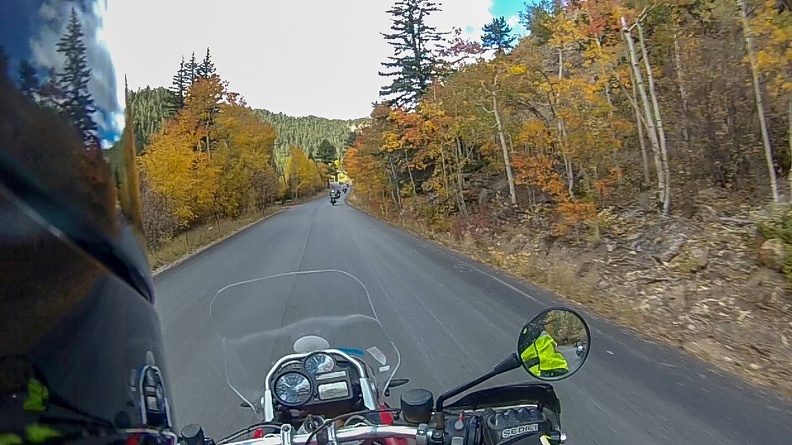 Route: Littleton, Colo., to Florissant, Colo. 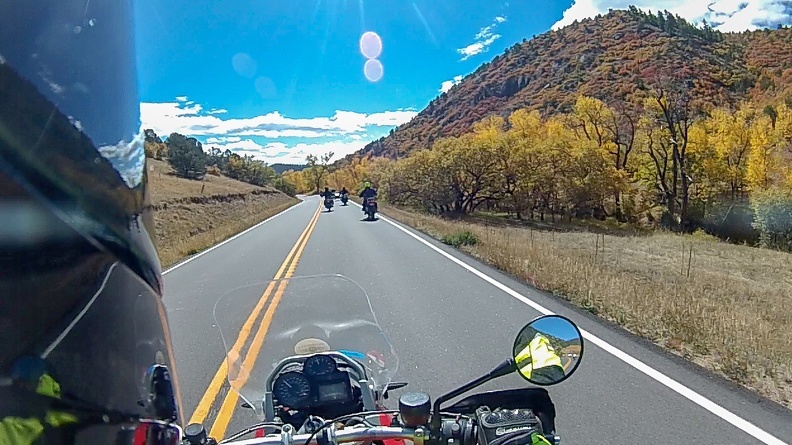 This ride report actually starts on Saturday, September 29. Today is day one of the Motorcycle Relief Project. 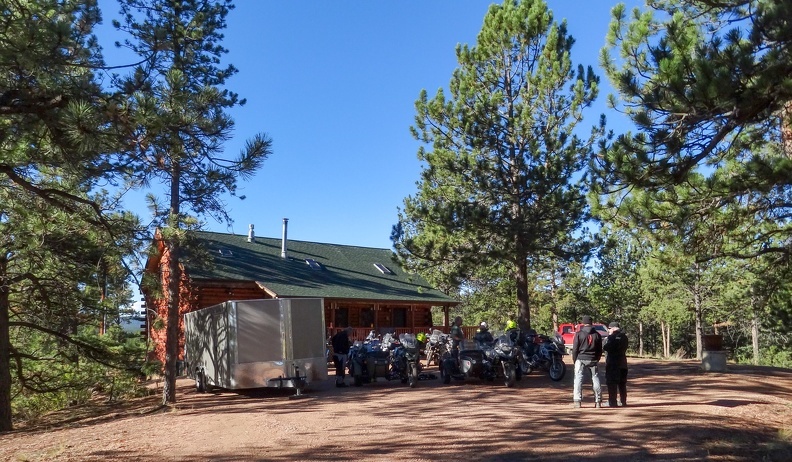 MRP is an organization that takes aims to provide relief to veterans and first responders with PTSD and other injuries by taking them on multi-day motorcycle tours. I had been trying to get on of the MRP’s rides for a few years, after seeing an article about them on Facebook. They have recently been featured in ADVMoto magazine. Having served in the Army and being diagnosed with PTSD myself, I thought the program sounded like a great way to decompress. I flew into Denver to meet with the crew from the MRP. I arrived a day early and unfortunately stayed at hotel close to Denver International Airport. I say unfortunately because there was nothing around the hotel, and it was about 20 miles from the city itself. On Sunday, I made my way back to the airport to meet a couple other participants and to get a ride to MRP headquarters in Littleton. At the airport, I met Dan, a retired US Coast Guard rescue swimmer, and Lance, not a veteran, but he would end up being our dirt-riding coach. We were picked up by Don, the MRP’s lead volunteer, and a Vietnam War veteran. Sunday night, the other participants and I met at MRP headquarters for a meet and greet. There were a wide variety of veterans from different eras and all of the branches of the US military. 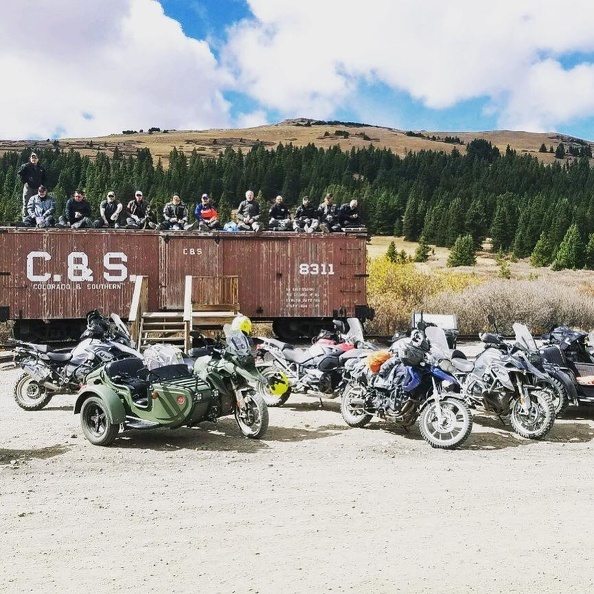 It did feel a bit strange to meet a bunch of strangers, but two things brought us together: our status as veterans and love for motorcycles. It did not take long for us start getting along like old friends. 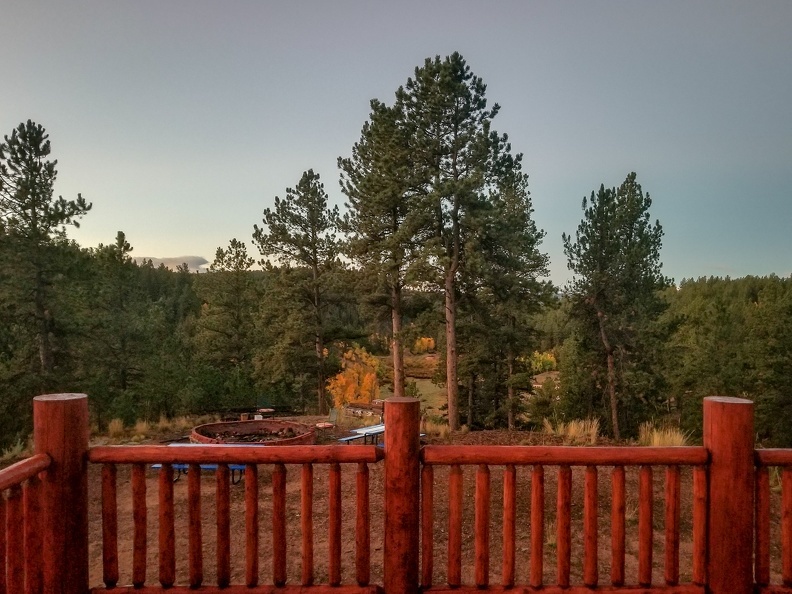 Monday morning we all met back at MRP headquarters to make our way to our accommodations for the week – a cabin in Florissant rented by the MRP. 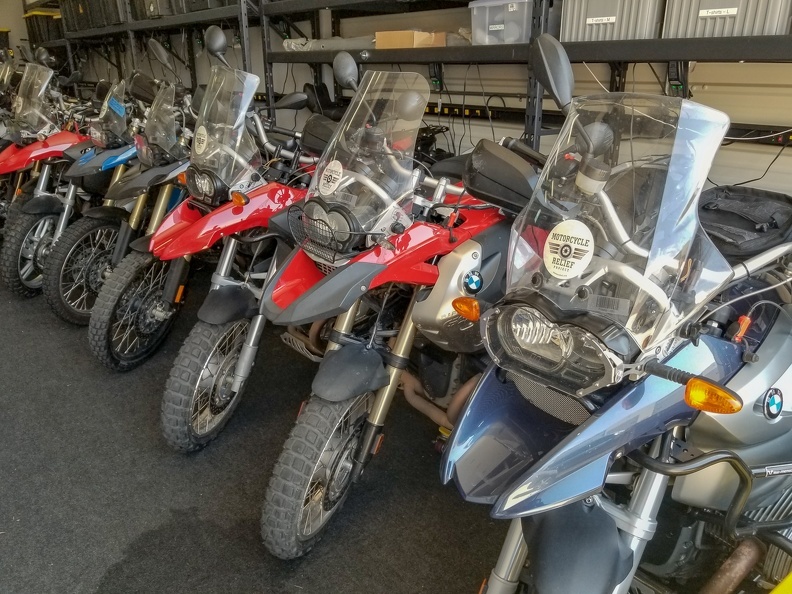 At headquarters, we were assigned our motorcycles – also provided by MRP, acquired mostly through generous donations of MRP supporters. 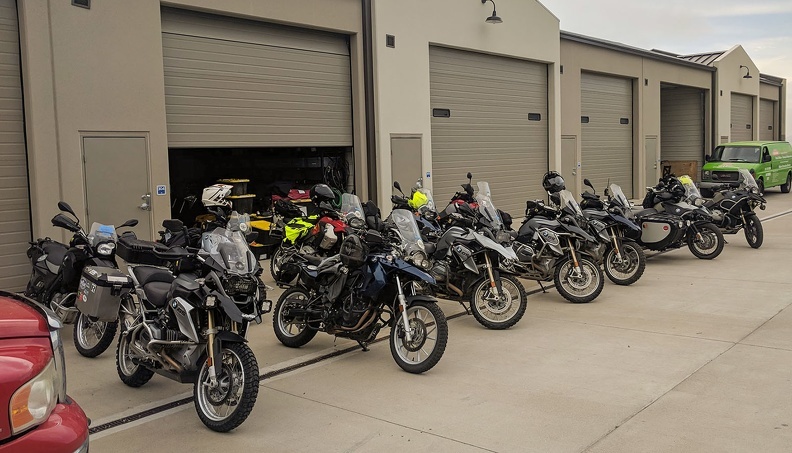 I was assigned Katrina, a 2007 BMW R1200GS.O I was a little apprehensive about riding such a big bike – my own bike is a V-Strom 650 – but I was assured all would be OK.
MRP’s entire fleet is made up of BMW 650, 800, and 1200 GS’s. 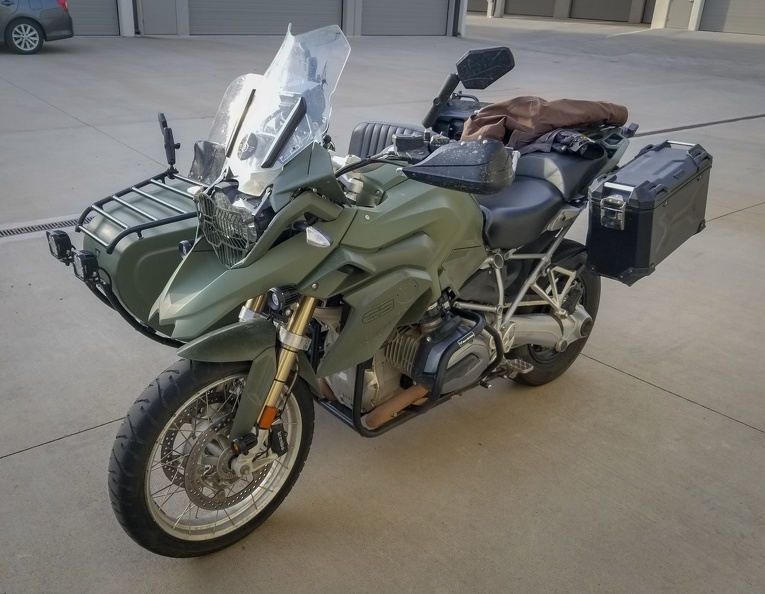 New to the fleet is Greta, an Army-green R1200GS with a DMC sidecar. MRP recently acquired the sidecar, so veterans who are no longer able to ride motorcycles can participate in their rides. 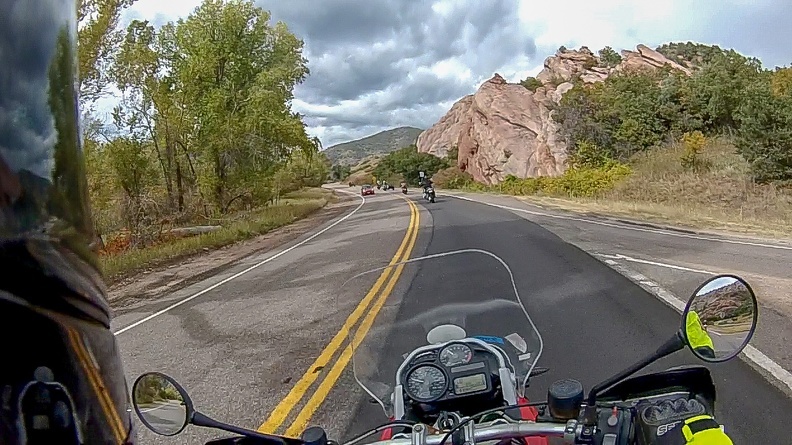 We mounted our bikes and headed west into the Front Range. 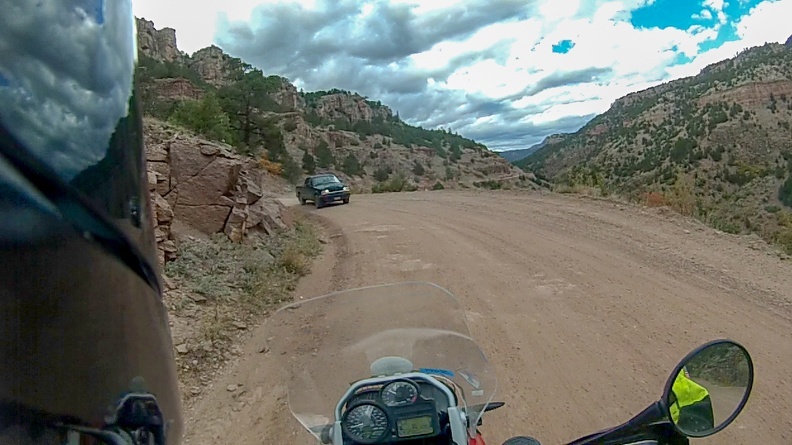 We soon entered Deer Creek Canyon, which was fun and twisty. 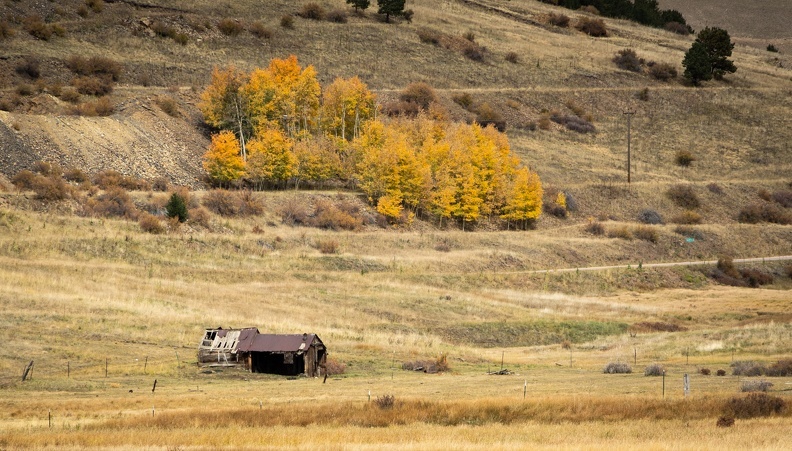 Instantly, we were greeted with beautiful Colorado fall color. 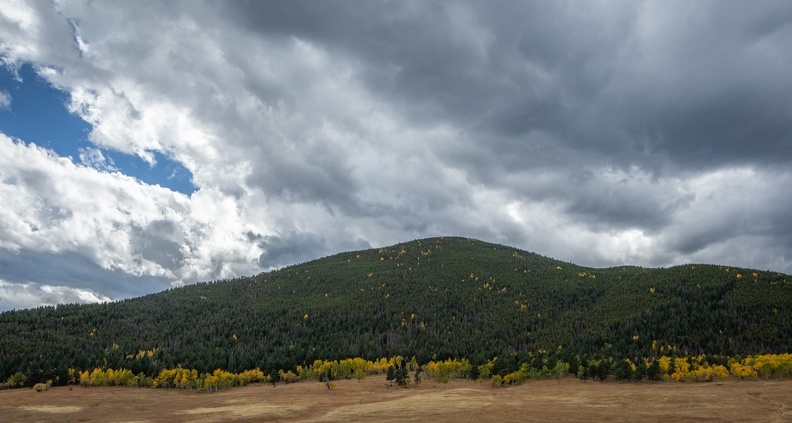 There were many evergreens with yellow aspens interspersed throughout. 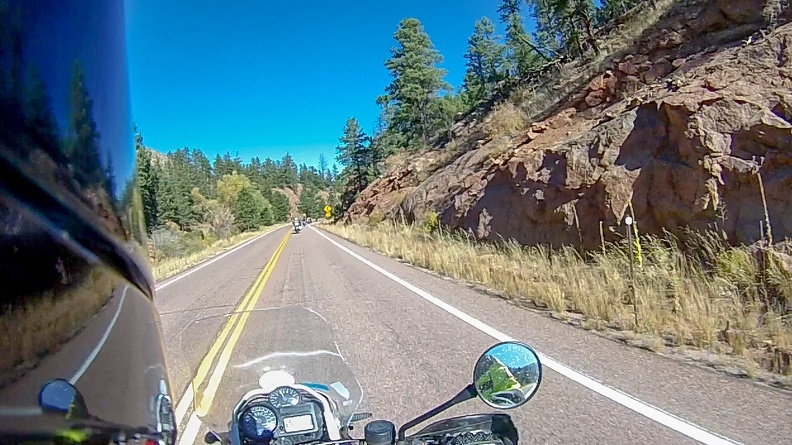 We soon started climbing into the mountains, coming out of the canyon near Conifer. We stopped for lunch at the home of MRP’s founder – a home with expansive views of the Rocky Mountains and a vast valley between adjacent ranges. 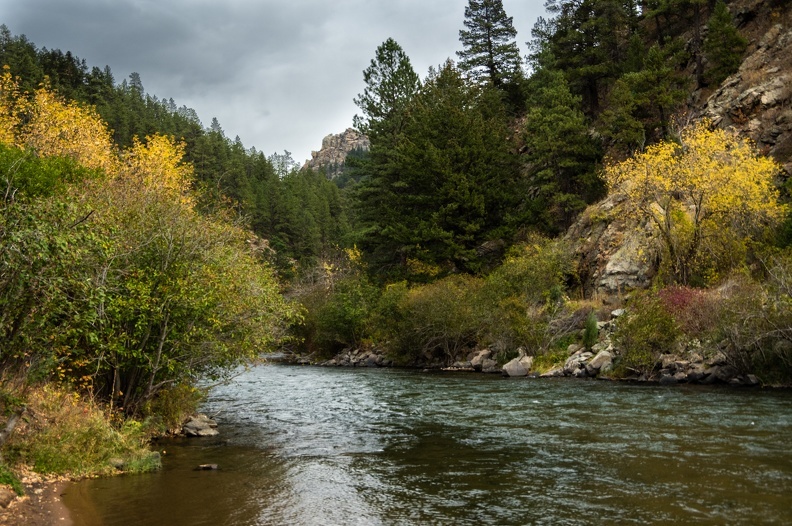 We headed south from Conifer and entered the Platte River Canyon. The road was tight and twisty, following every curve of the river. 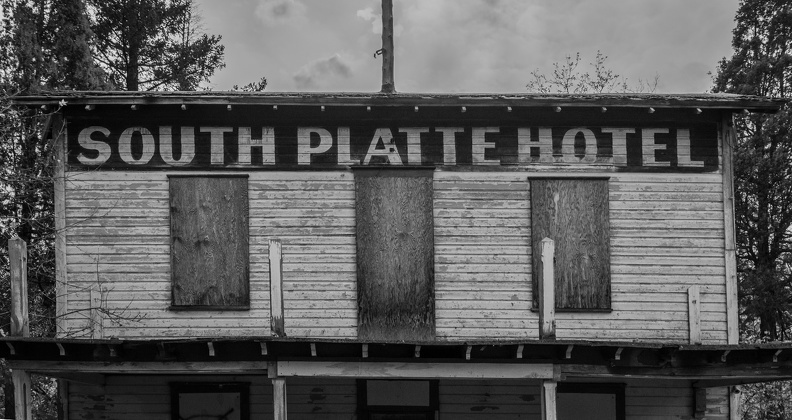 We stopped at the old South Platte Hotel for a break. 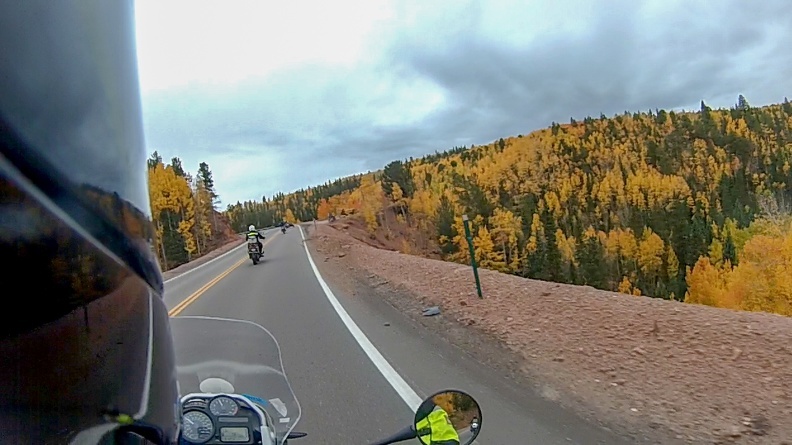 We enjoyed cold water surrounded by yellow and brown hills covered in evergreens and aspens. 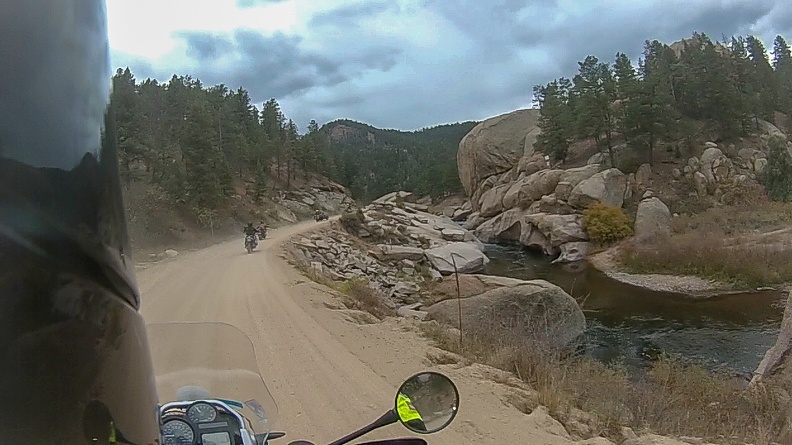 Leaving the South Platte hotel, the road turned to gravel and we got our first, easy taste of the life off pavement. 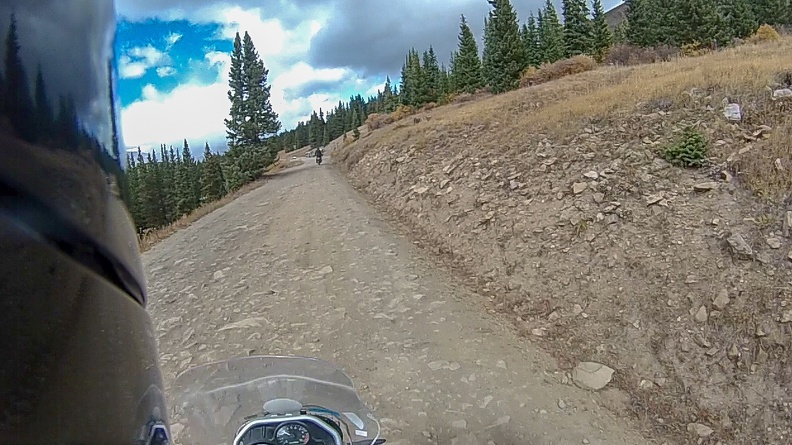 Surprisingly, the GS handled the gravel well. But then again, everyone knows what GS’s can do. The road came to a T in Deckers, and we stopped there to enjoy ice cream cones at Deckers Corner coffee shop. We had been riding together for only a few hours, but we all acted like old friends. 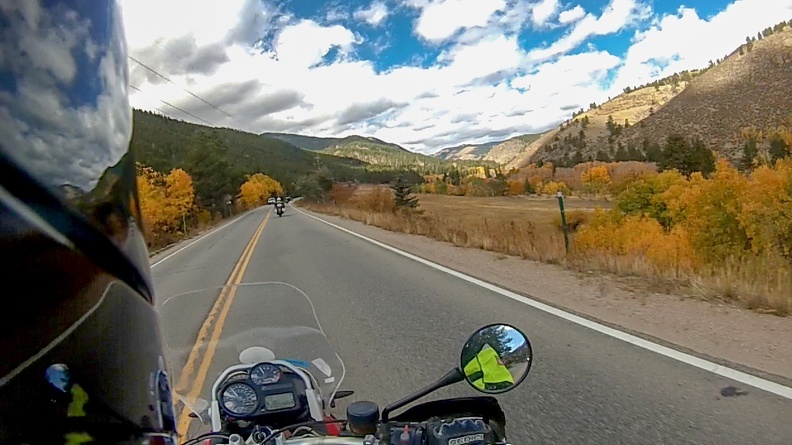 We took Colorado Highway 67 out of Deckers toward Woodland Park. 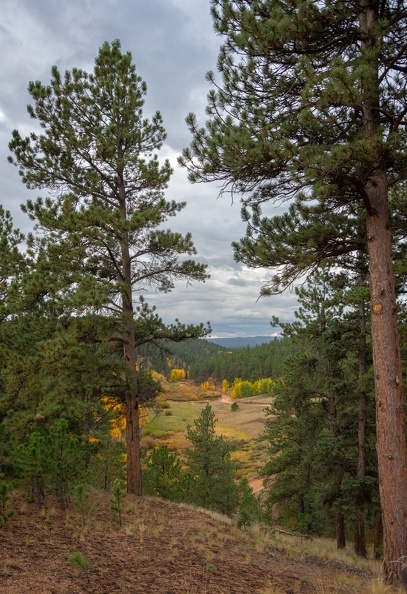 Highway 67 wound through the Horse Creek and West Creek Canyons before climbing up the Rampart Range into Woodland Park. 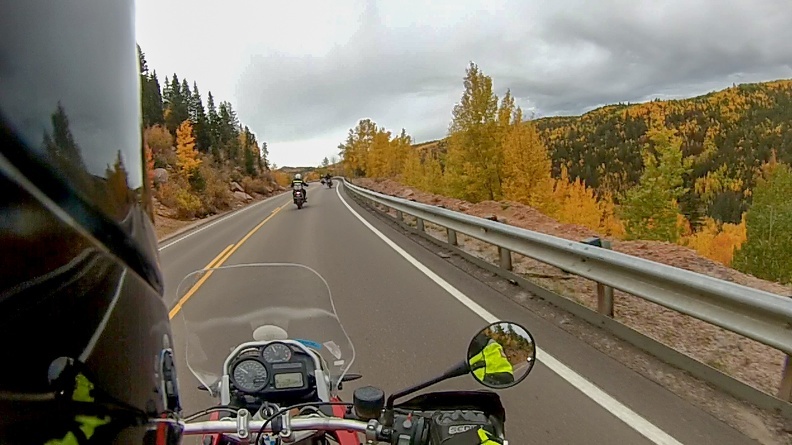 From Woodland Park, we headed southwest into Ute Pass. Entering Ute Pass, the scenery changed. Gone were rolling hills covered in trees. 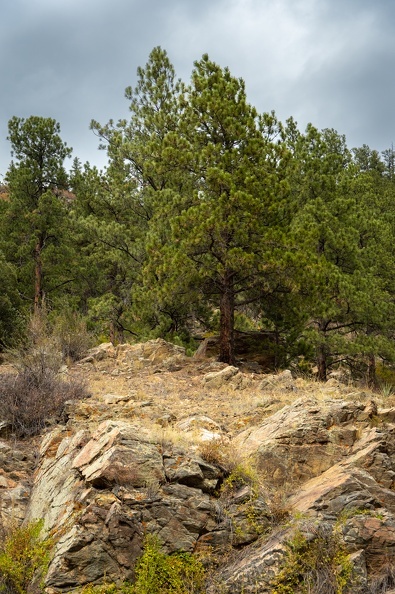 Trees were still there, but all around were outcroppings of large red rocks. Ute Pass also introduced us to the manic personality of Colorado weather. Out of nowhere the blue skies gave way to gray clouds and a falling rain. 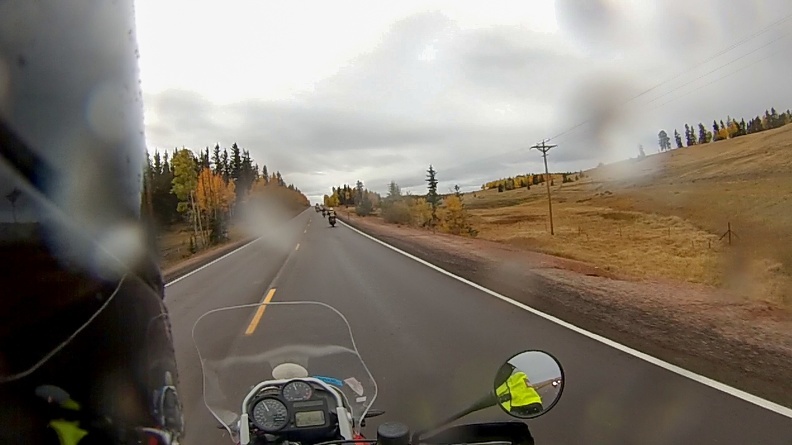 The rain stopped before we entered Florissant, allowing a bit of time to dry out before arriving at the cabin. 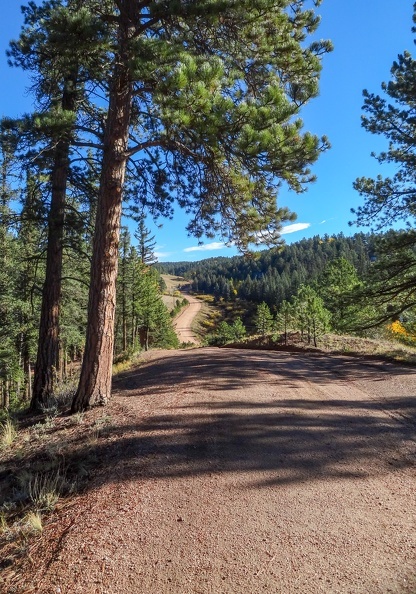 We took a dirt road up into the foothills above Florissant to our cabin, the Tihsreed (read that backwards for a chuckle). 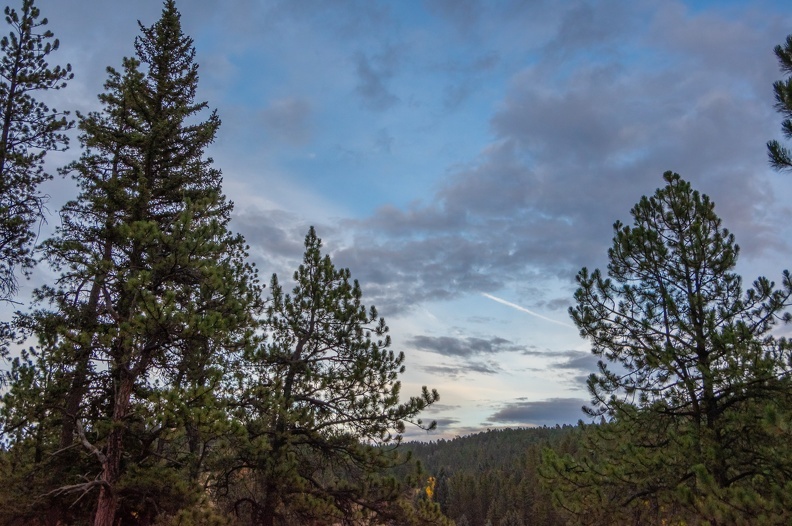 The cabin was perched on the top of a bluff overlooking a valley carved by a creek. The cabin itself was really nice and would make for a fine base of operations. We unpacked our gear and selected our rooms. Soon after we had a group dinner around the large dining table. We quickly found ourselves joking around like one big family. 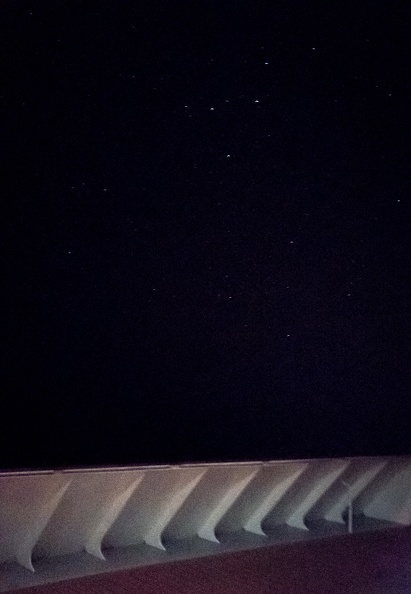 The stars even managed to come out. 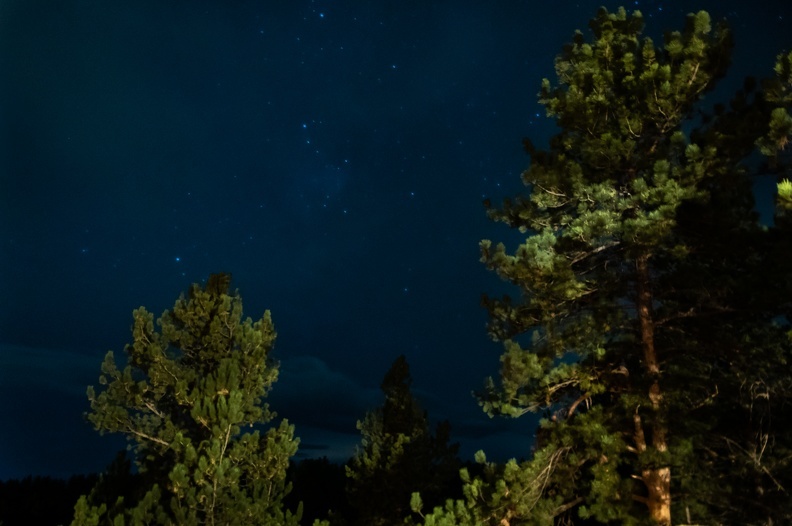 I wrote most of this while sitting by my tent at Joseph Stewart State Park. My Canada adventure has come to an end. I’ve been riding solo for the last four days, something that was very intimidating to look forward to at the start of the trip. Yet here I am, 1158 miles from Nakusp, with 207 to go. Ted Simon said it best: It is remarkably easy to do things, and much more frightening to contemplate them. I have ridden some of the most amazing roads, and seen some of the most beautiful scenery British Columbia, Washington, and Oregon have to offer. The only real disappointment is that I had to choose to see some things and not others. There’s something about riding alone. You can go at your own pace. You can stop whenever you want. When you stop for the night, it’s just you and your thoughts. Sometimes the solitude is exactly what you need to reflect on your journey. If you’ve never done a long trip by yourself, I highly recommend you try it sometime. It just may change your life. Though you’re alone, you never truly are alone. 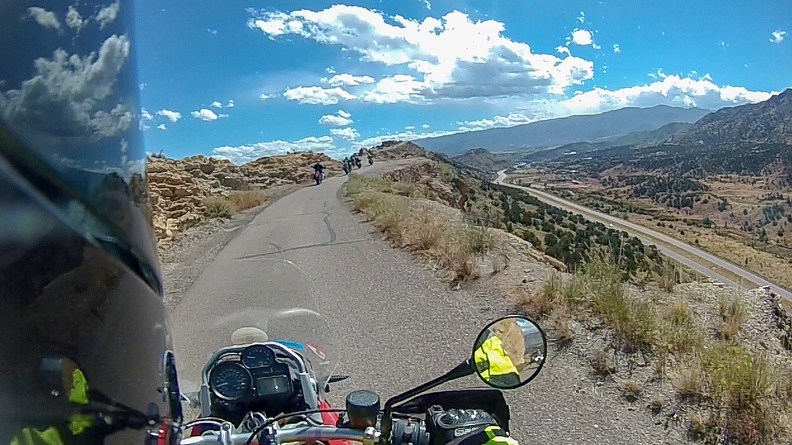 There’s an amazing community of people sharing an interest in motorcycles out there. People who will slow down or stop when they see a stranger on a bike on the sire of the road just make sure they are OK. Often times, they’ll even lend a helping hand or stay with you until help arrives. We are also connected to our loved ones via little magic boxes that fit in our pocket. Support is only a fingertip away. All throughout the news, we hear about how much bad there is in the world. This could not be further from the truth. Though, through my job, I often see the worst in people, I really believe that people are inherently good. Once you get on the road, you see this. 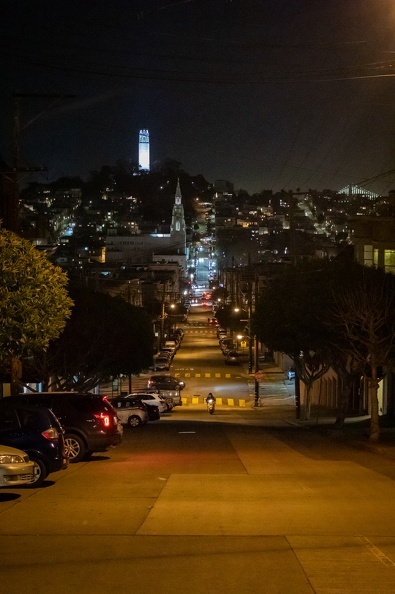 I met several people who have offered up places to stay if I ever need one while traveling. 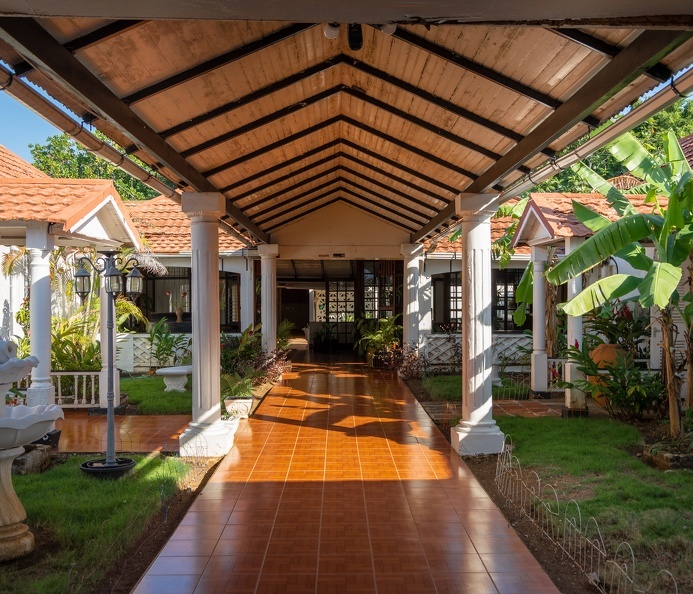 I even took a chance and spent the night at a complete stranger’s home on my trip. 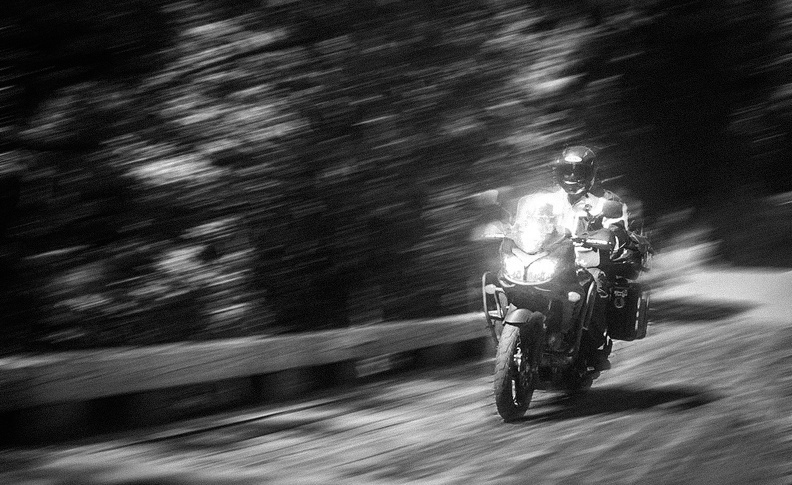 A motorcycle seems to be a magnet that draws people to come out of their shell and make a connection with a stranger. You don’t hear about people on car trips being approached in restaurants to be asked about their travels. 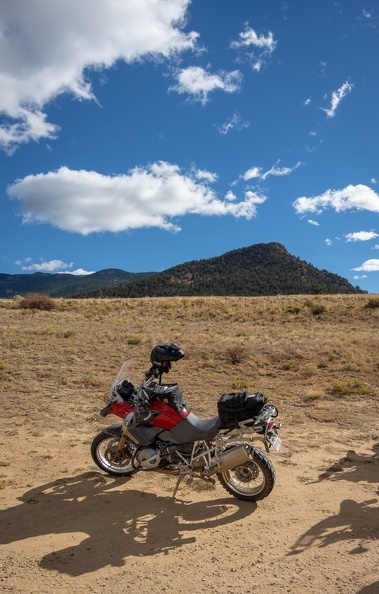 Change it to a motorcycle, and there is quite a mystique about a lone traveler. 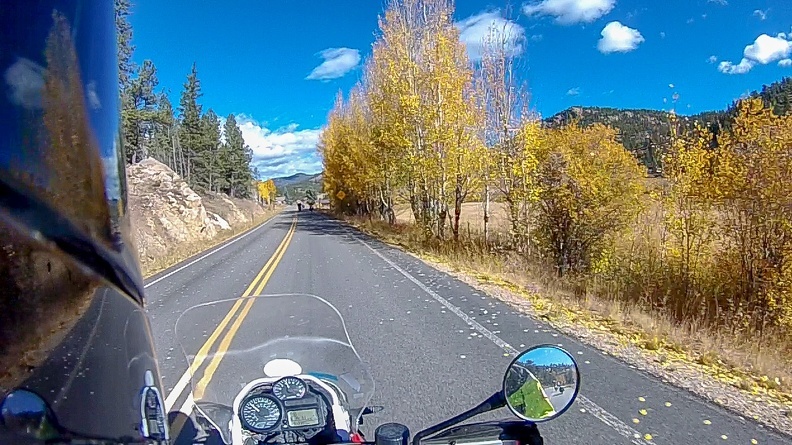 When I first started riding, I knew I wanted to take trips, but I always thought it would be short weekend trips to places within a few hours’ ride from home. I never thought I’d find myself crossing an international border! 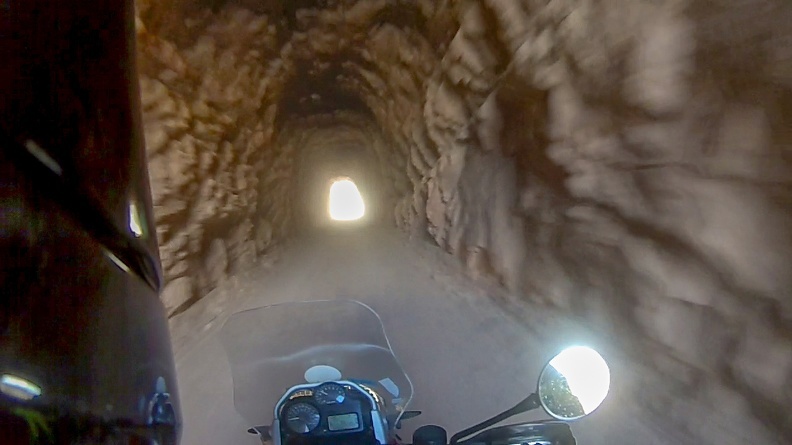 Following ADV Rider and attending Horizons Unlimited events have only raised my desire to see more of what’s out there. Having an understanding family is great. 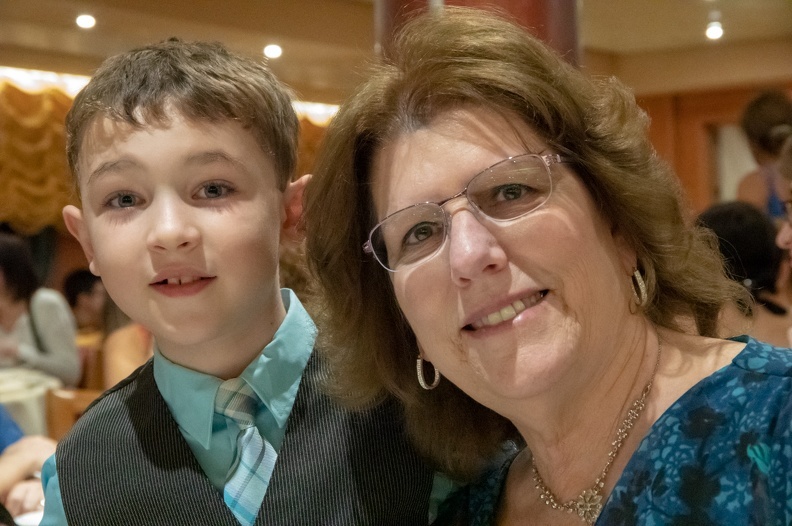 Their support allowed me to take on this trip, when before, it was something I didn’t think I would ever do. It was my own wife who bought my admission to Horizons Unlimited and set this journey in motion. Everyone should have such a supportive spouse. I thank her from the bottom of my heart. I’m forever grateful to Greg as well for taking the lead and accompanying me from home to Nakusp, and for all of his motorcycle travel mentoring. It was quite strange leaving Nakusp without seeing his Tiger in front of me, but I easily found my solo groove. I’m looking forward to my next great adventure, and I look forward to sharing it with you all. I’ll see you down the road.